As I have stated before in this blog, I’m not a fan of eggplant. I don’t care for the taste, texture, and several bad experiences as a child have all left me wary of this particular nightshade. However, over the years I have come to appreciate eggplant in two – YES! 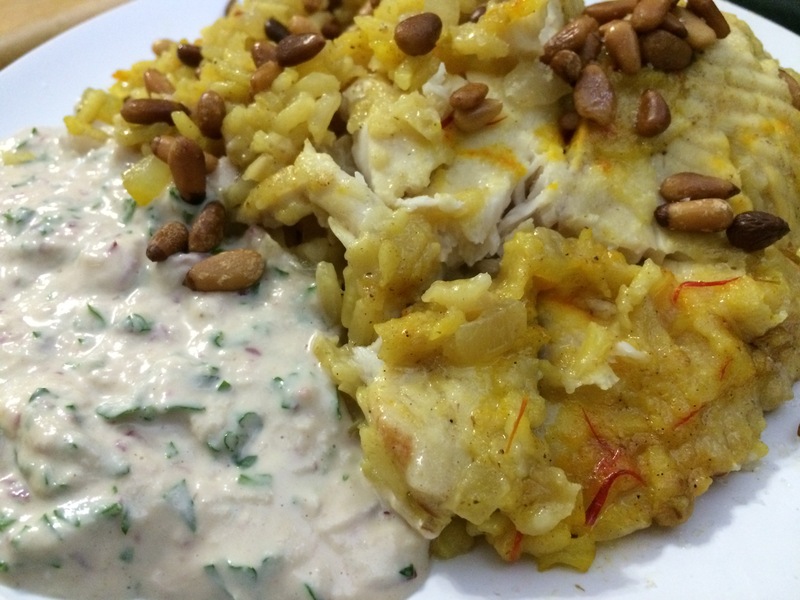 – two dishes; Baba Ghannouj and Makdous. Makdous is ubiquitous all over the Middle East. It can be eaten for breakfast (the most common way) or as a mezze. I’ve been searching for an actual origin story for this dish, but haven’t been able to find one. No doubt it came, like most preserved foods, out of sheer necessity to get people through until the next harvest. 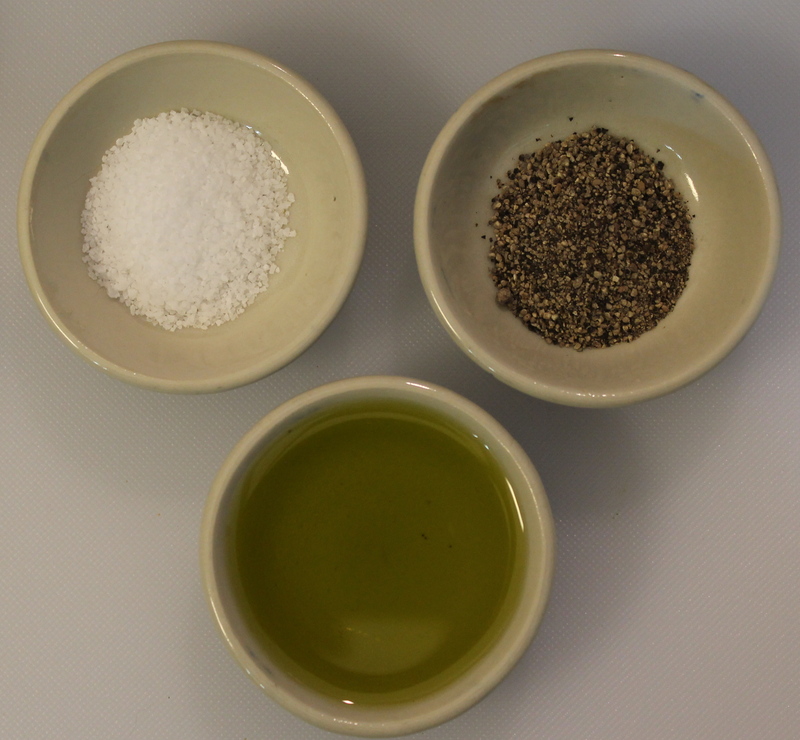 There is an odd alchemy that happens with Makdous during the preservation process. 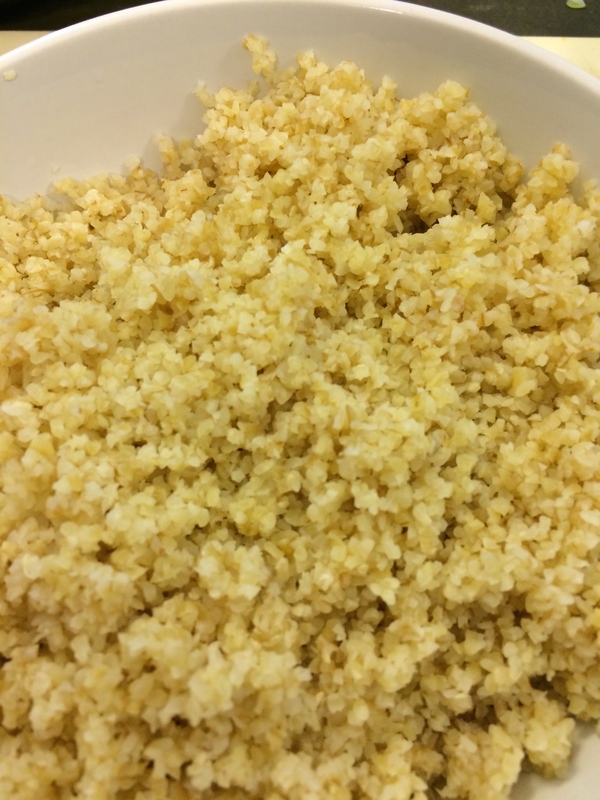 While it is generally known that you don’t store raw garlic in olive oil, especially at room temperature, it seems to work just fine in this recipe. It could be the mixture of the nuts, salt, and pepper along with the alkaline nature of the eggplant. 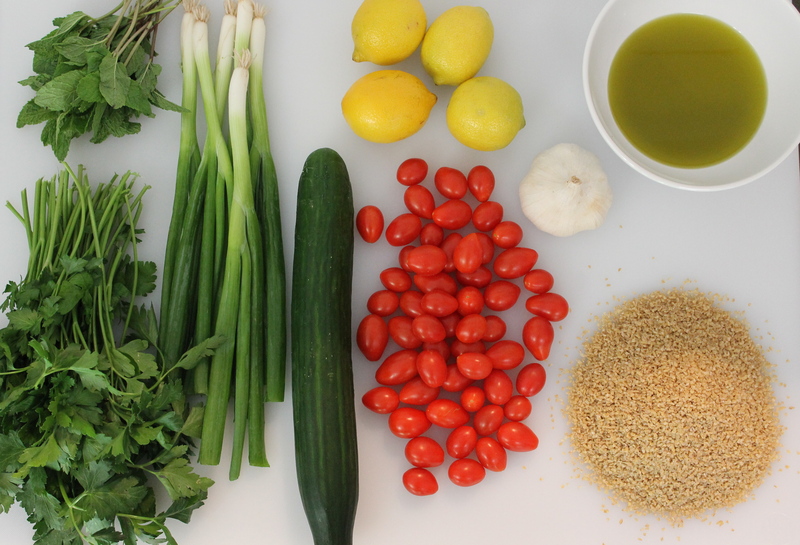 You can store Makdous in the refrigerator or at room temperature in the pantry (as I’ve always seen my dad do). 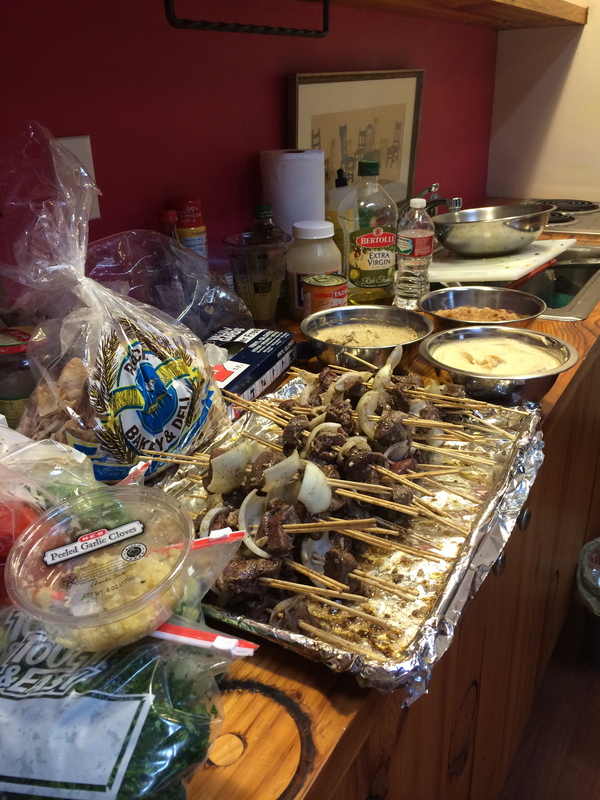 There are several ways Makdous can be prepared. One constant is the eggplant should be blanched and drained before stuffing. Some drain the eggplant by stuffing it first, placing it in the jar, then turning the jar over to let the liquid drain out; others will cut a slit in the eggplant, lay it slit side down, then let it drain overnight. I use the latter method. (There is only one time I’ve seen a recipe that simply salted the eggplant and let it drain without cooking.) Always use small or baby eggplant. The baby eggplant will be more tender, sweeter, and less apt to be bitter. You’ll be able to find baby eggplant in abundance in any grocery that caters to the Middle Eastern community or, if you’re lucky, at the local farmers market or farm stand during the growing season. (In central Texas, we have eggplant from roughly June through the first frost in late October/early November.) 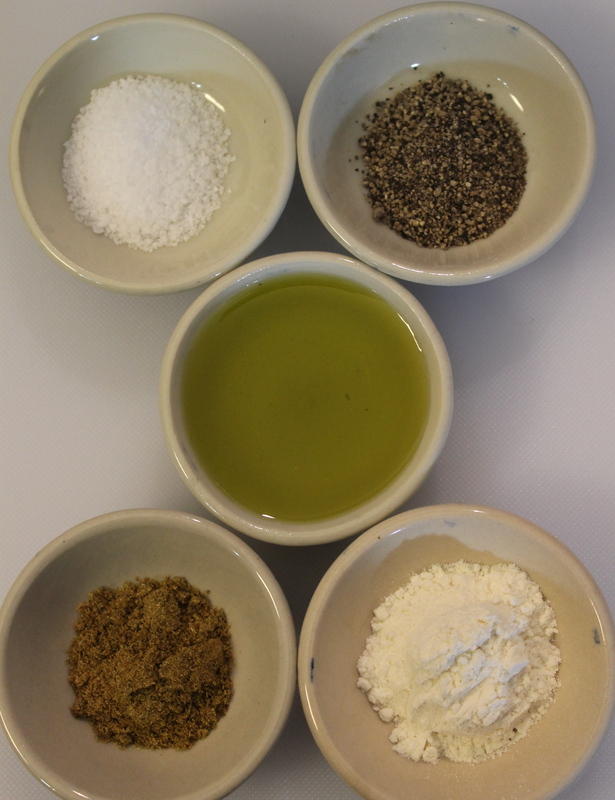 There are also, of course, ingredient variations. 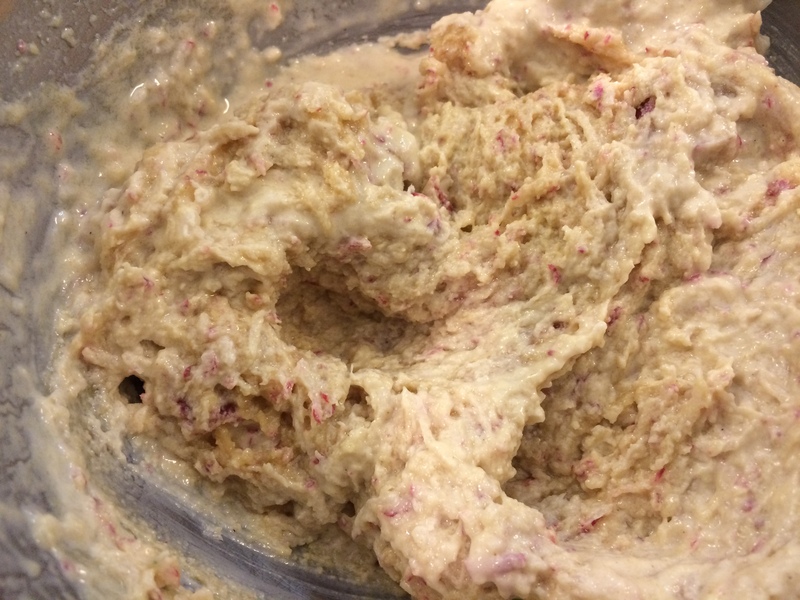 Some will use pepper paste (like harissa), a combination of sweet & hot peppers, cayenne, parsley, lemon, chili powder, Feta cheese (although they don’t last as long), cilantro (coriander), pecans, and pomegranate seeds. The constants are always eggplant, walnuts, and salt. This recipe was written in consultation with and advice from my dad. He is a Makdous connoisseur and, along with my mom, has made Makdous in the past. I just hope he likes this batch once I get a jar to him. “Dancer” eggplant. This is what I used in the recipe. I got the smallest ones I could find. After 10 minutes, drain the eggplant. Once it is cool enough to handle, cut a slit in one side (not all the way through and try to leave about 1″ at each end uncut). Lay the eggplant on a rack, cut side down, and let drain overnight. The cut eggplant. Sadly, no. It doesn’t keep its color. Draining the eggplant. Some people will weigh the eggplant down at this point to drain out as much liquid as possible. I generally don’t; it’s up to you. 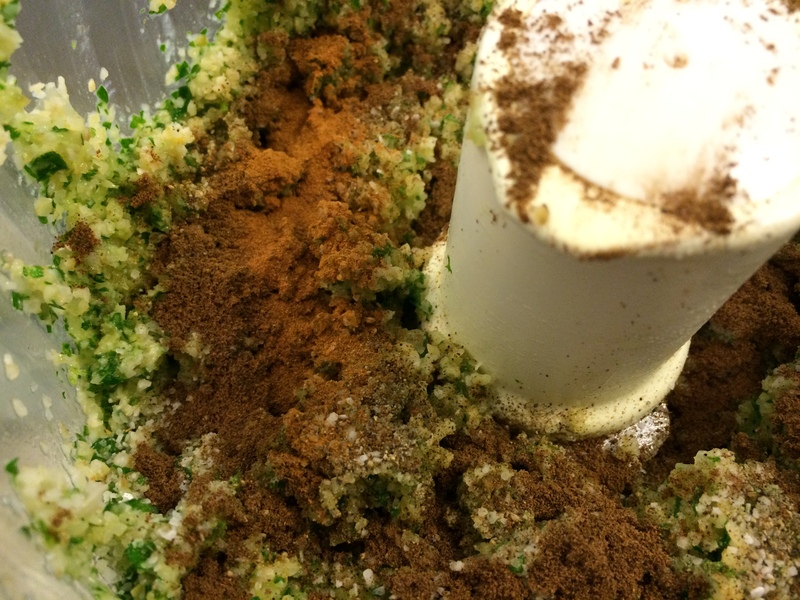 The next day, mix together the walnuts, garlic, pepper flakes, and salt. Taste for seasoning and adjust as you like. The stuffing. 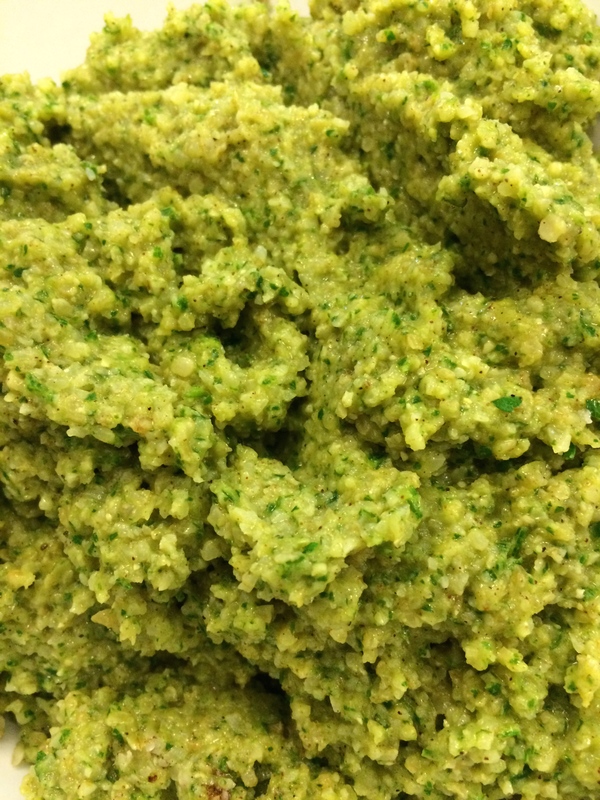 It’s almost like a nut pesto. Place as many of the stuffed eggplant as you can in a Mason Jar with minimal crushing. Slowly add the olive oil to cover the eggplant. Set the jars on a rimmed baking sheet lined with a thick layer of paper towels or a dish towel you don’t really care about. Place the lid (only!) on the top of the jar. Place the baking sheet with the jars in a cool, dark place and let sit for 1 week. The Makdous ready for preserving. Note how it’s just the lid on the jar, not the rim. You want to allow the moisture to escape. There will be some overflow from the jars. This is due to the moisture (mainly water) escaping and overflowing the jar. Simply check to be sure the oil is covering everything in the jar. After 3 days. Notice how yellow the towels are. 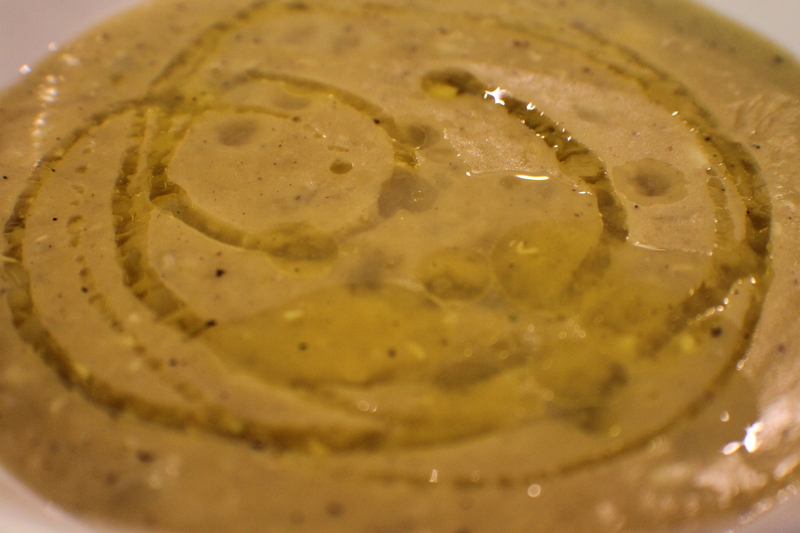 That’s the excess moisture and some olive oil escaping the jar. You may also see some bubbles. This is from the water and air escaping and it’s normal. After 1 week, carefully clean off the rim of the jar, tighten the lid with the rim, and wash off any oil residue off the jar. I believe this is after 10 days. (We went on vacation.) I cleaned off the rim of the jar, put on the lid rims, then washed the residue off the jars. 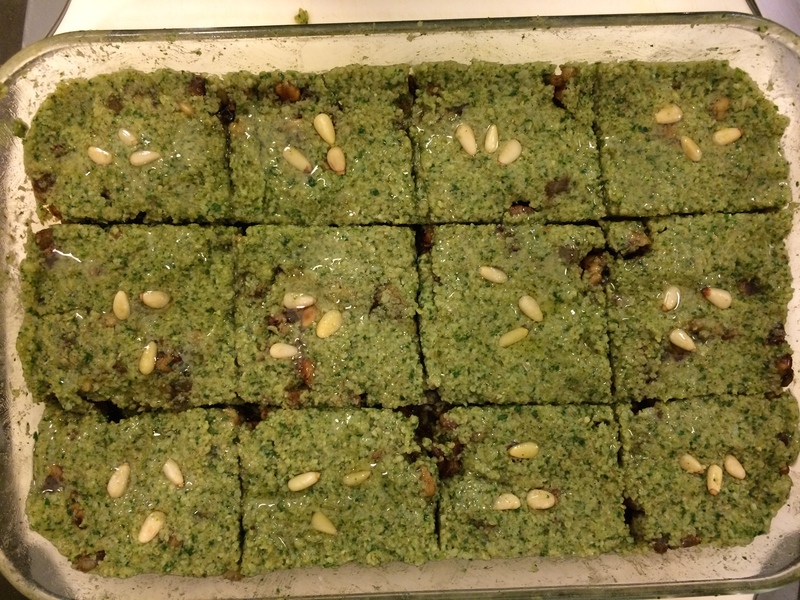 The Makdous is now ready to eat. You can store it in the refrigerator (just let it come to room temperature before eating) or in a cool, dark pantry for up to one year as long as the contents are always covered in olive oil and the lid & rim are sealed tightly. I personally like Makdous on a good cracker. Kibbeh is ubiquitous throughout the Middle East. 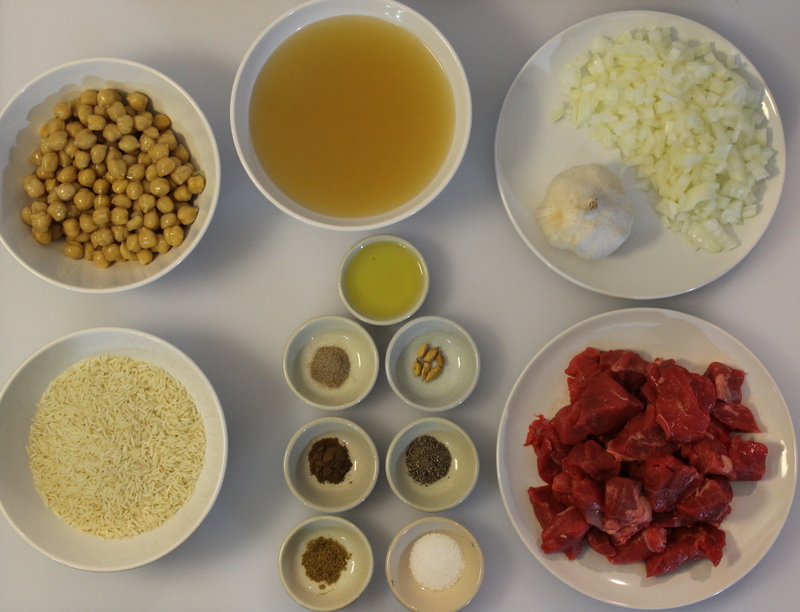 If you know anything at all about this dish, you know it is usually made with meat – beef, lamb, or, rarely, goat. 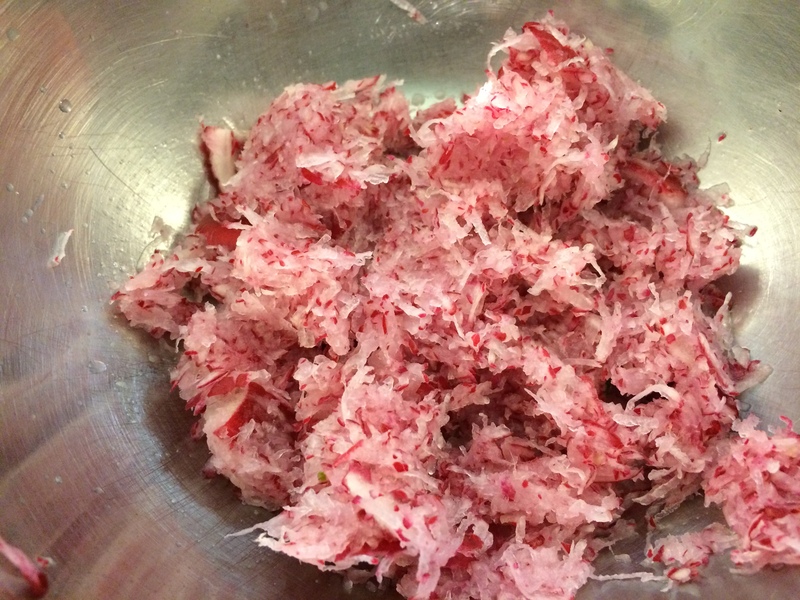 It can be baked, fried, or eaten raw. It is essentially a meat feast with a little wheat thrown in. 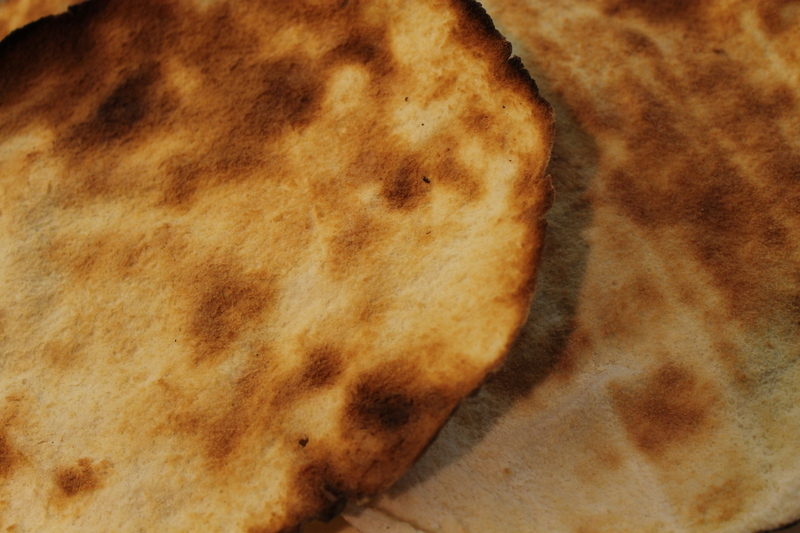 However, during Lent, many Christians throughout the world – including the Middle East – give up eating meat. 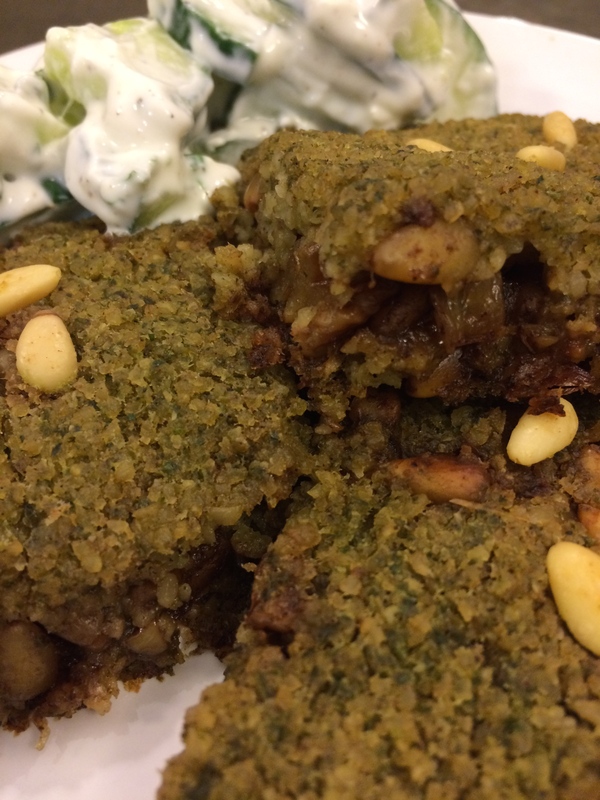 So, a vegetarian version was created (most likely in Lebanon) so they could still enjoy Kibbeh throughout Lent. I came up with my version of this dish about 15 years ago when my husband was still a practicing vegetarian. He’s since come back to the dark side, but I still like to make this version on occasion whenever we are having a vegan week here at Chez Ray. 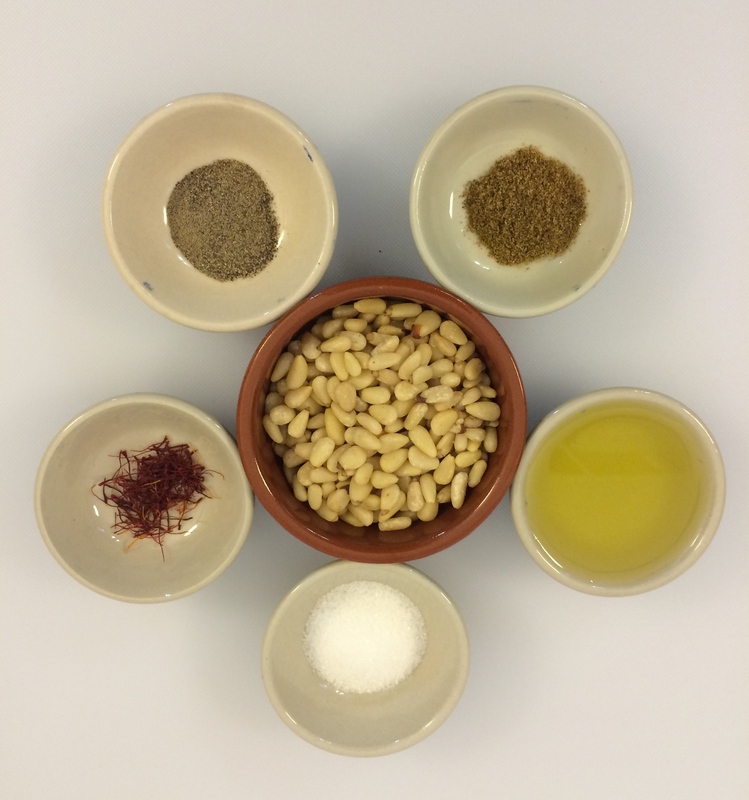 I use pine nuts in this recipe, like I do in traditional Kibbeh. However, if you can’t find, afford, or don’t want to use them, you can substitute slivered almonds. If you want to add some additional flavoring or bulk, you can also layer in along with the filling, sliced boiled potatoes, sautéed squash, sliced tomatoes, or fried eggplant slices. 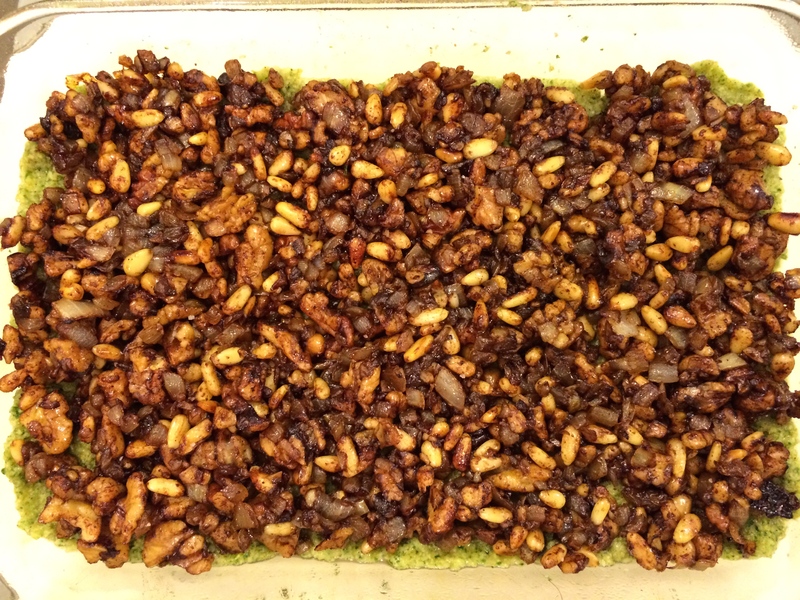 If you are making this for someone who is allergic to nuts, then you can use vegetables (see above) or seitan or tempeh. However, if you decide to use either of these, be sure that either of them aren’t highly seasoned (like many commercial ones are – especially seitan). 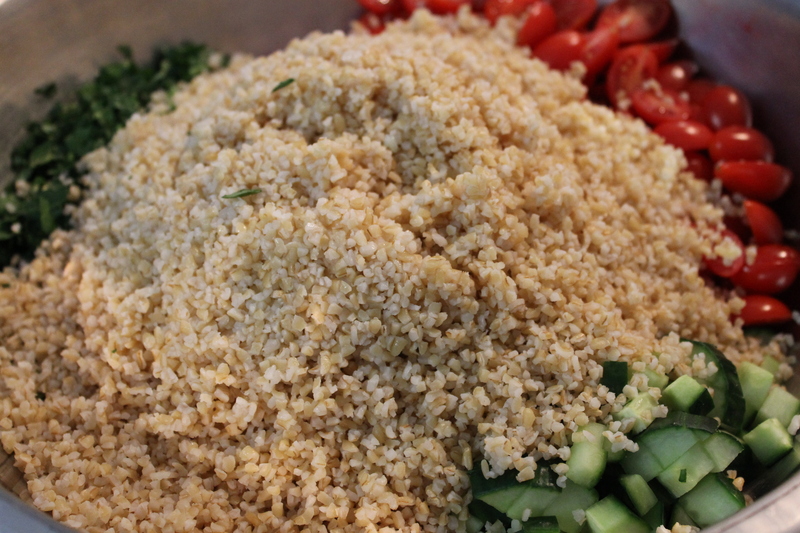 I like to use fine bulghur wheat for this dish (#1 grind) because the crust holds together better with the finer grind. 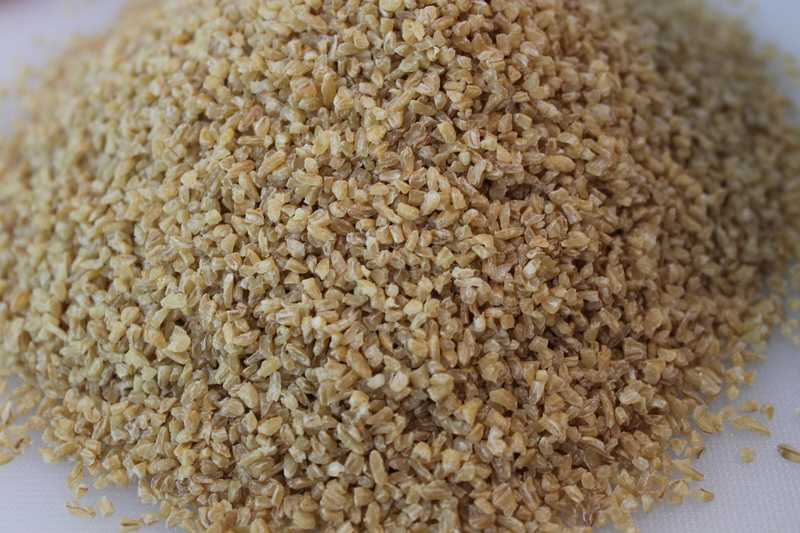 If the crust mixture is too dry, add a little water; if it is too wet, add a little whole wheat flour. 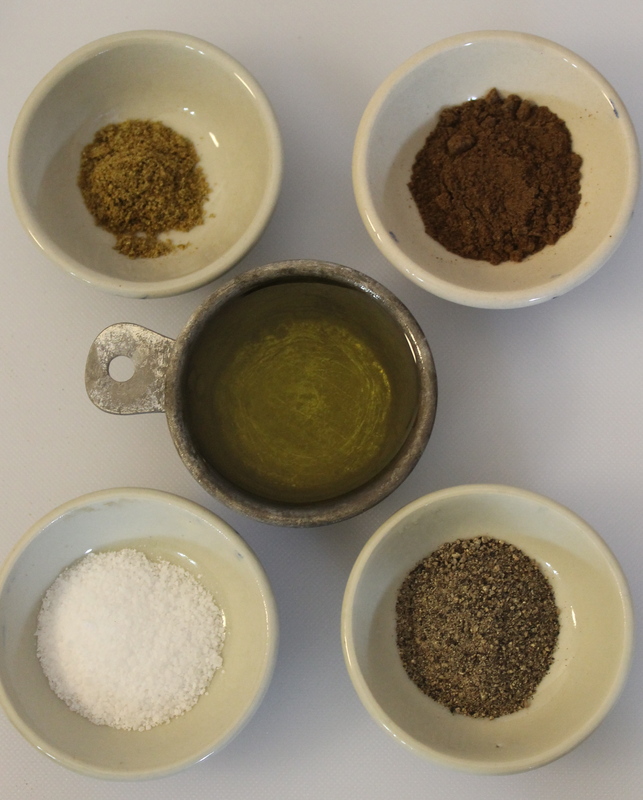 However, make sure that you have everything well mixed before you begin adding any additional ingredients. If you do have to add anything, adjust the seasonings accordingly. 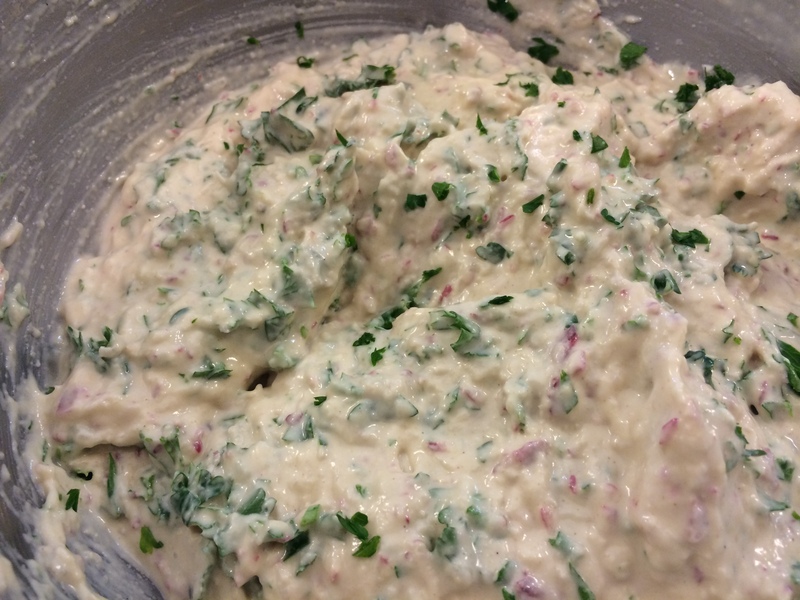 A traditional accompaniment to Kibbeh is a cucumber-yogurt salad. If you want to keep this completely vegan, then use a soy-based or coconut milk-based yogurt (however, check the label to make sure there’s no casein in the yogurt). The wheat. Try to use a #1 grind. 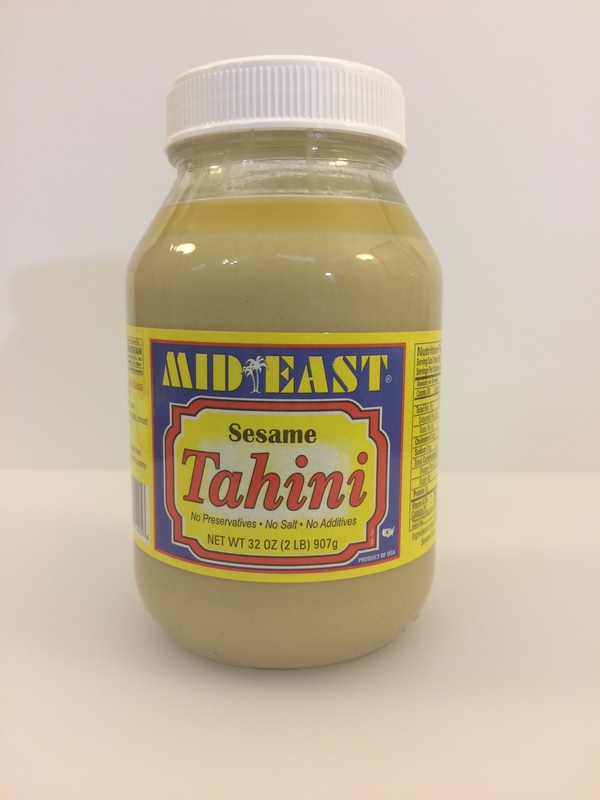 You can generally find it at any Middle Eastern market. 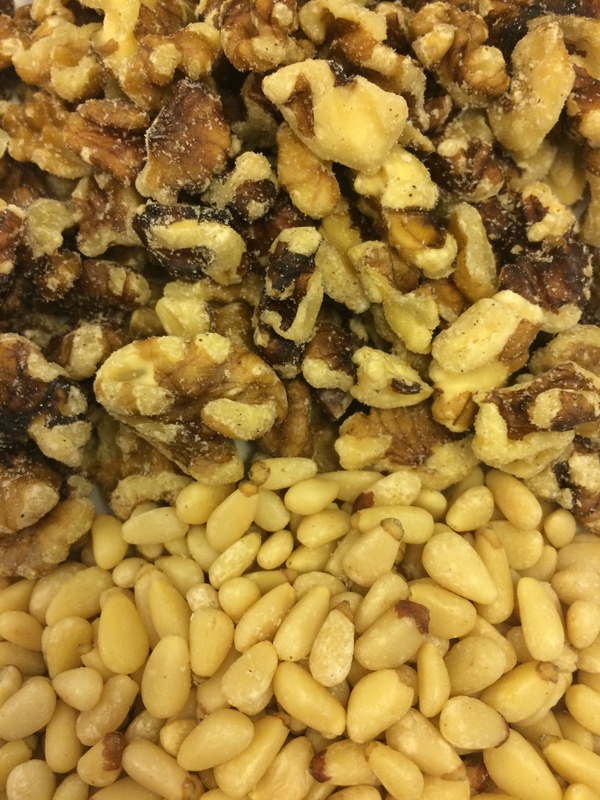 Walnuts and Pine Nuts. 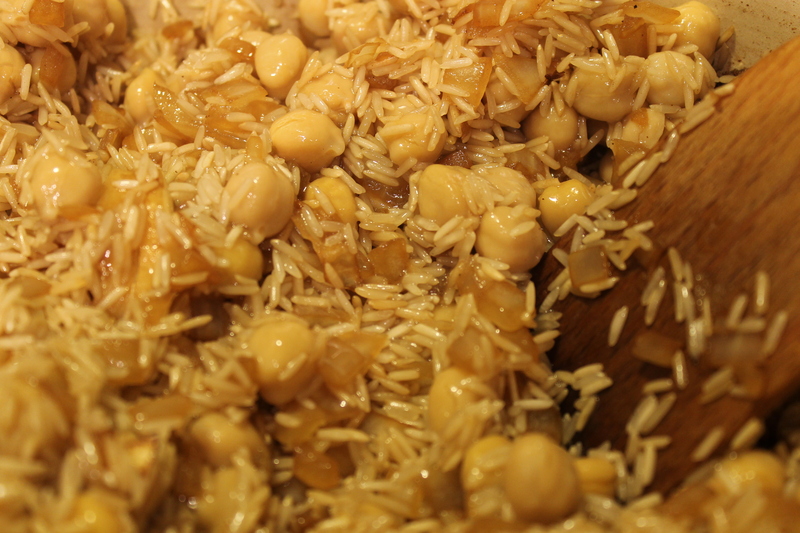 You can substitute slivered almonds for the pine nuts. However, the walnuts are a must. Most other nuts are going to be too sweet. Preheat the oven to 375F. 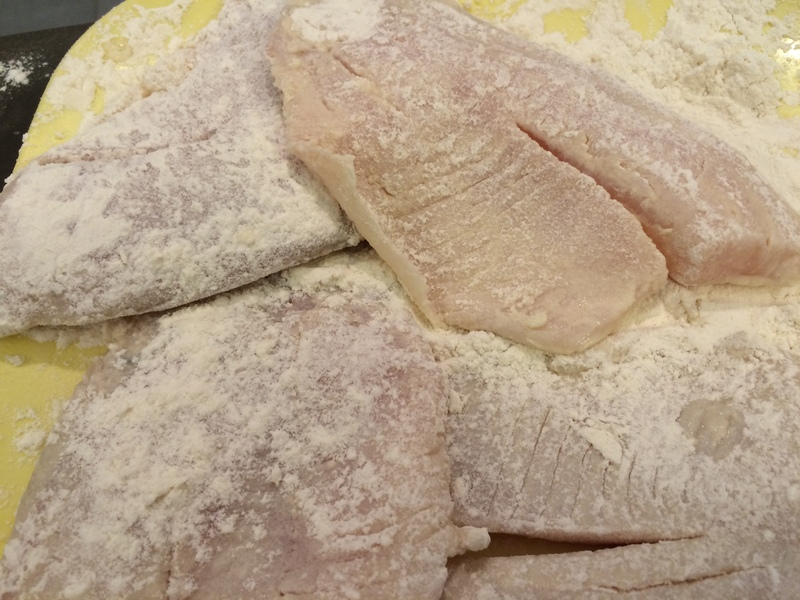 Either spray or oil a medium baking dish (about 7″ x 11″) and set it aside. 2. 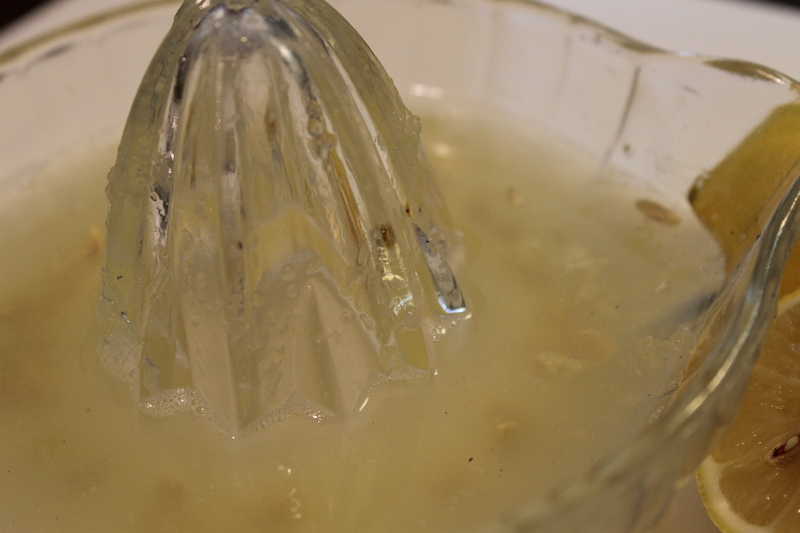 Rinse the wheat in a fine mesh strainer until the water runs clear. Rinsing the wheat. You want to be sure to get off as much of the dust as possible. Processing methods are better than they once were, but some dust is still present. 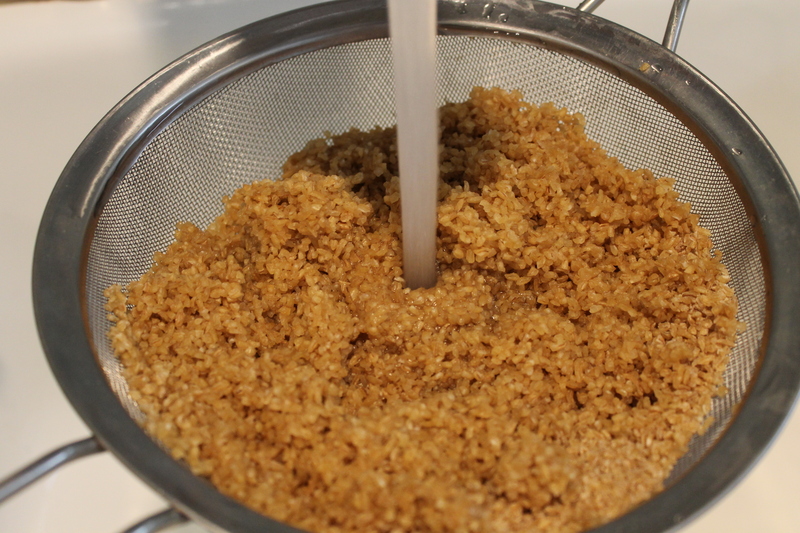 Then, put the wheat into a bowl and cover with 1″ of water. 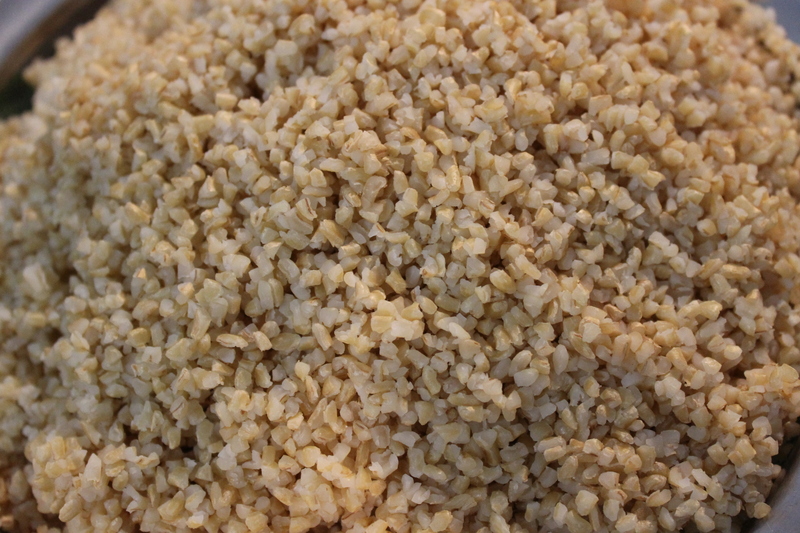 Set aside and allow the wheat to soak until it is “al dente”, about 20 – 30 minutes. Soaking the wheat. Start testing it after about 20 minutes. It should still have some chewiness to it, but it shouldn’t be crunchy. 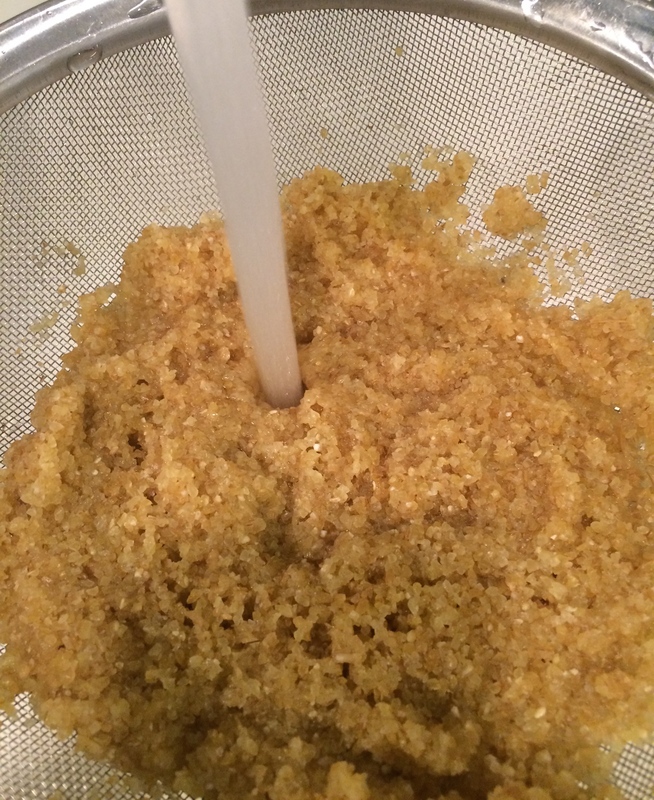 Once the wheat is ready, drain it through the strainer again. (There’s no need to squeeze out all of the water; just be sure the wheat is well drained.) Set aside. 3. 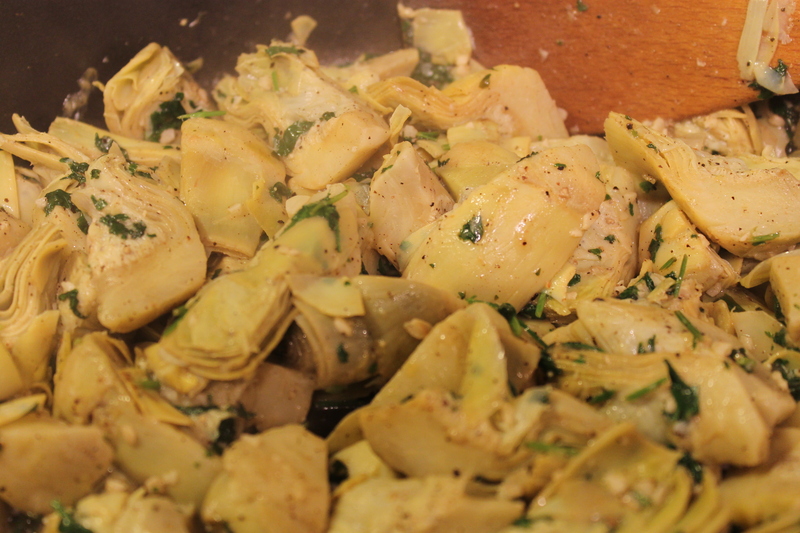 Make the filling: Heat 2 tablespoons of the olive oil in a large skillet over medium-high heat. 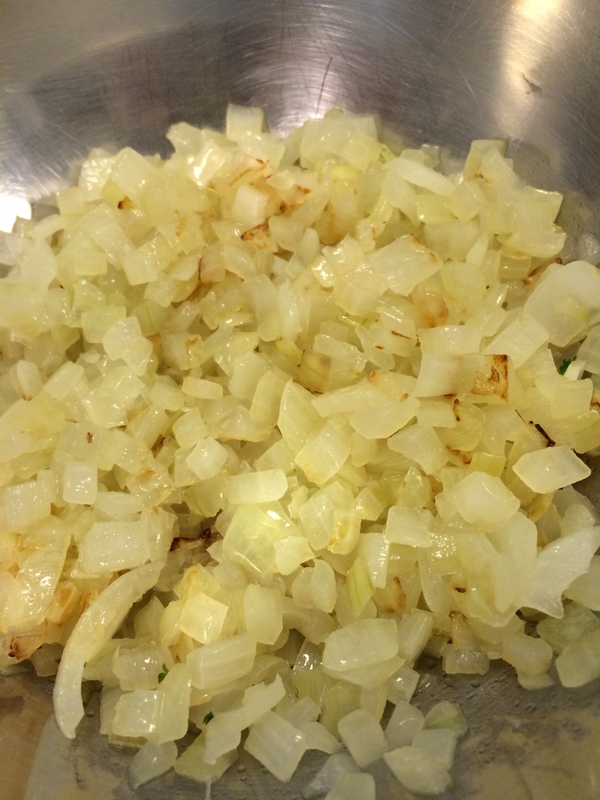 Sauté the onions until they become soft, about 5 – 7 minutes. Stir frequently. 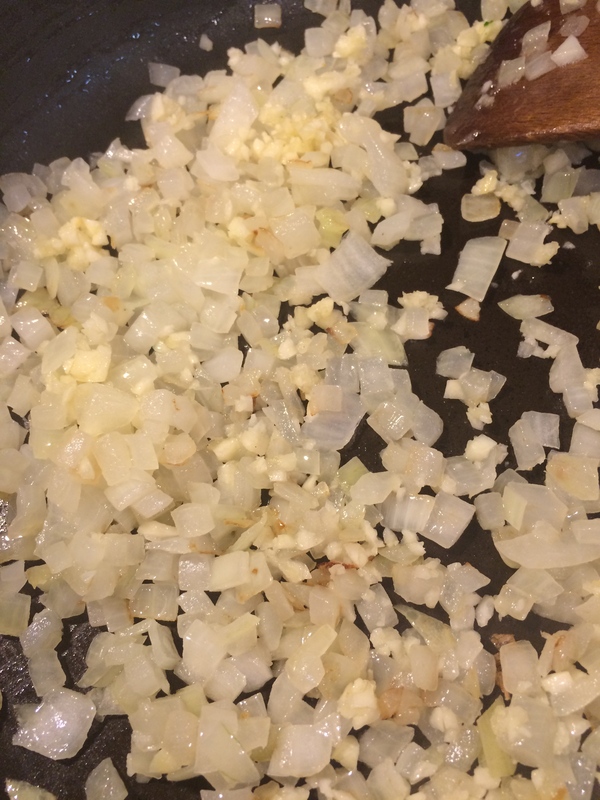 Take half of the onions out of the skillet and place them into a bowl. Set aside. This half is waiting to be made into crust. 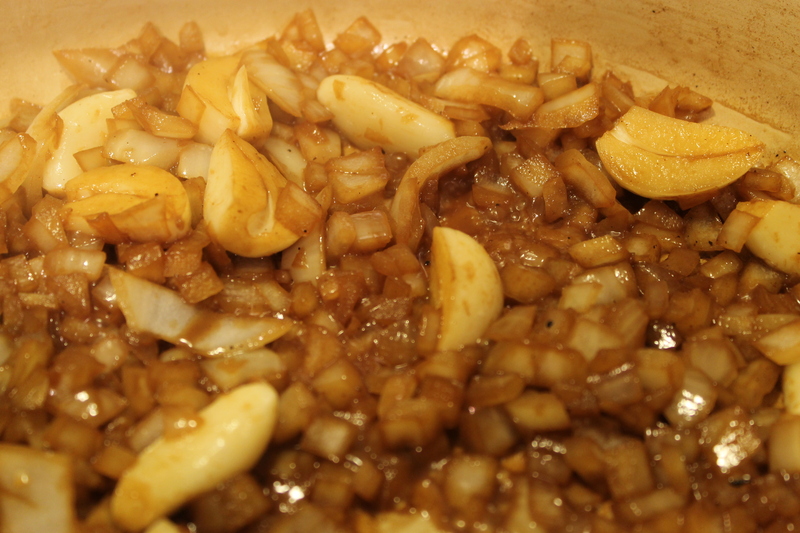 Place the skillet back on the heat and turn down the heat to medium and add the garlic to the onions. Sauté for 2 – 3 minutes. Stir frequently. 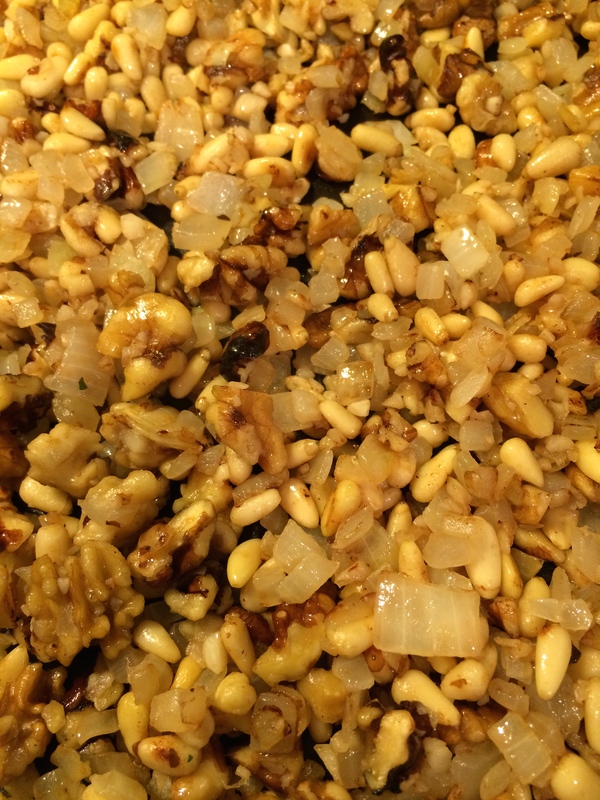 Add the pine nuts and the walnuts and cook for another 3 – 4 minutes, or until they have toasted (be sure not to burn them). Again, stirring frequently. Be sure not to let the nuts burn. You just want to get a nice golden brown on them. Add in 1/2 teaspoon of the cinnamon, 1 teaspoon allspice, the pomegranate syrup, and salt and pepper to taste. Cook for another 5 minutes, stirring frequently. Take the skillet from the heat and taste for seasoning. Allow the filling to cool slightly. This is what you’re looking for – a deep maple color. 4. 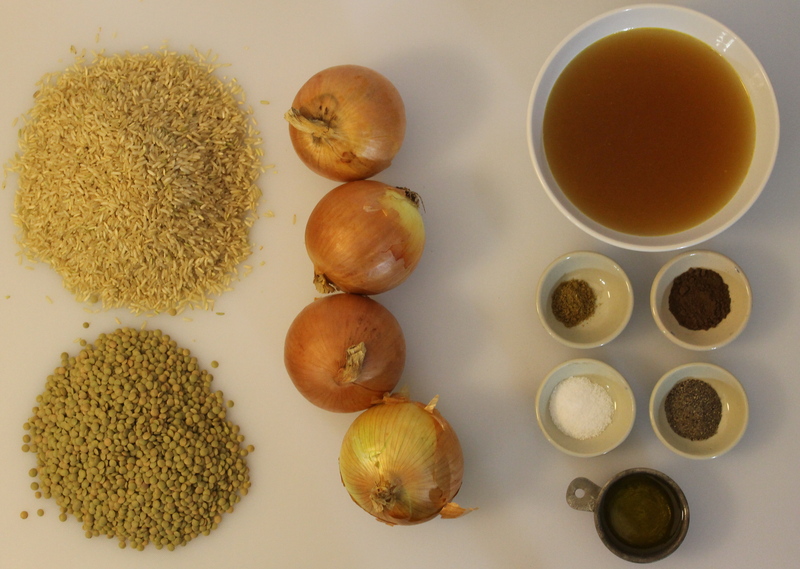 Make the crust: Take the other half of the onions and place them into a food processor along with the parsley, and the wheat. 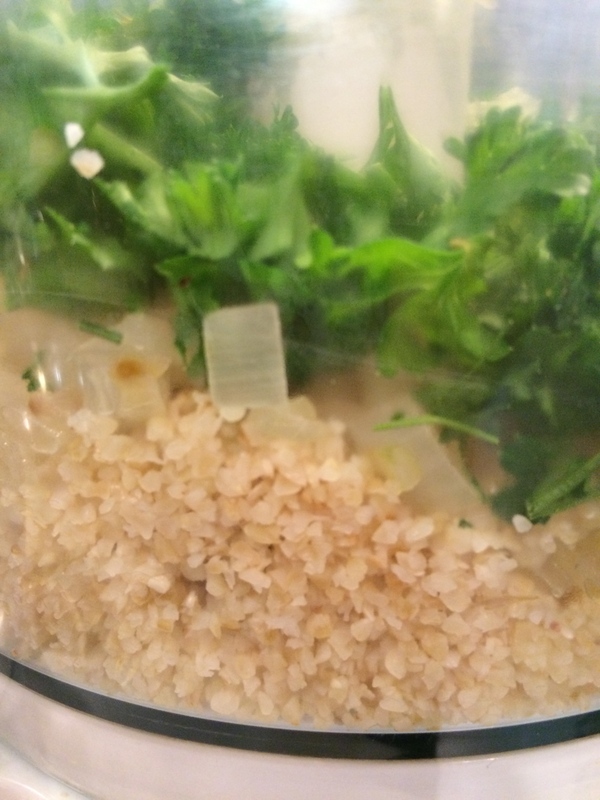 The wheat, onion, and parsley in the processor. Pulse a few times to begin mixing the ingredients, scrape down the bowl and add the other half each of the cinnamon and allspice, and a good pinch each of salt and pepper. Process the mixture (scraping down the sides and pulsing as needed) until it is well mixed and has almost a paste-like consistency. It should still have some texture, but the mixture should hold together. Taste for seasoning. The finished crust mixture. If the ingredients are well mixed, you shouldn’t have to add anything to adjust the texture. 5. 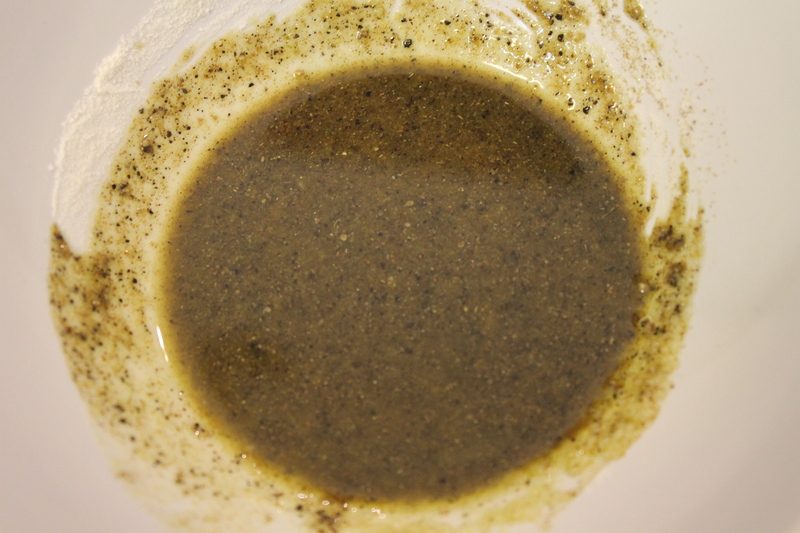 Assembly: Take half of the crust mixture and spread it evenly over the bottom of the dish. The bottom layer. Be sure it’s spread as evenly as possible. Spread the filling evenly over the bottom layer. The filling. This, of course, is where you would add any additional filling if you wanted to. Essentially, this is ready to go into the oven. The top layer is a little thin because I used too much on the bottom layer. If that happens to you, just very carefully spread out the top as much as you can. It does smooth out; it may not be pretty, but it will work. 7. Place the Kibbeh in the oven and cook until the top crust is slightly browned, about 30 minutes. Serve hot or at room temperature. 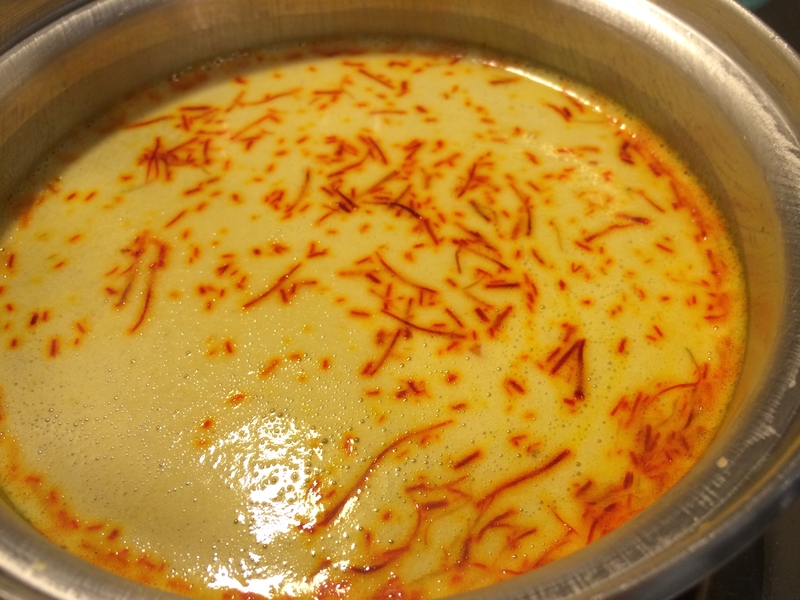 In the ongoing informal series of foods from my childhood, today, I’m going to introduce you to Mujadarah. Admittedly, this wasn’t my favorite dish growing up. I usually picked at it or ate it with lots of salad so I could get it down. But, as happens with most of us, my palate changed and discovered that I, even if I don’t love Mujadarah, I like it. It must have been the lentils. 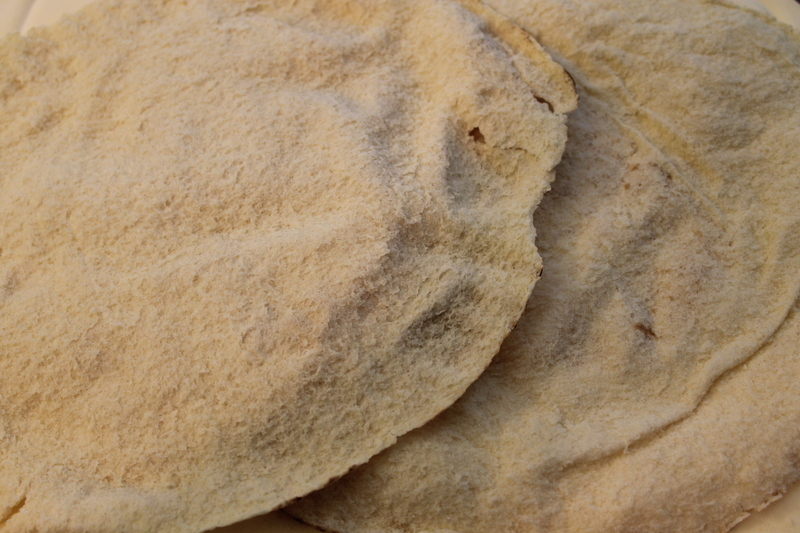 Arab Christians traditionally eat mujaddara during Lent. 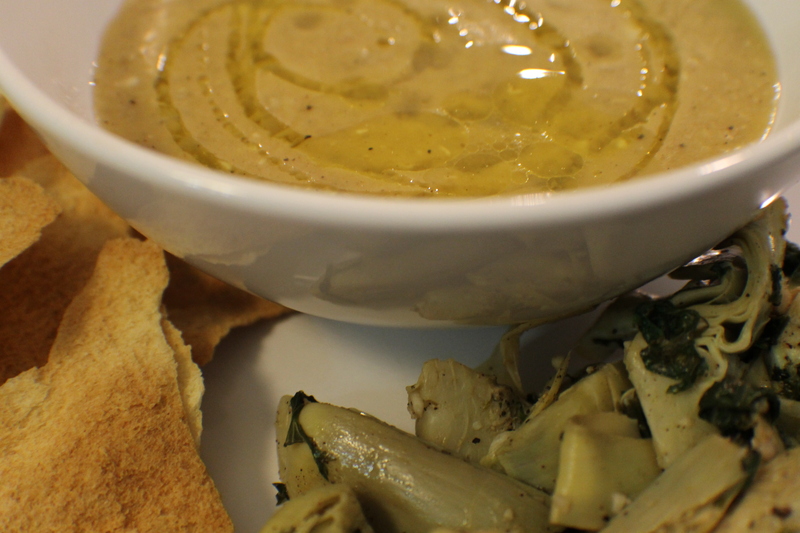 The dish is also popular among Jewish communities of Middle Eastern origin, in particular those of Syrian and Egyptian backgrounds; it is sometimes nicknamed “Esau’s favourite”. Jews traditionally ate it twice a week: hot on Thursday evening, and cold on Sunday. 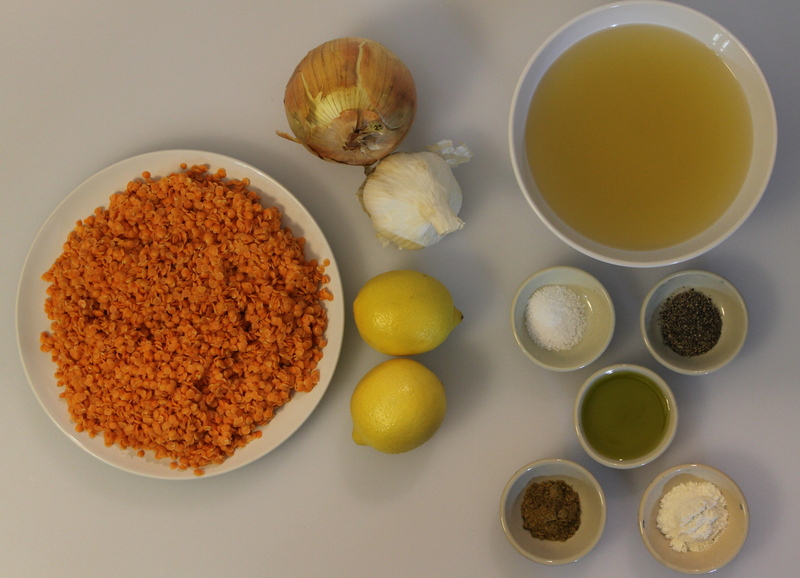 If the recipe looks somewhat familiar to you, I’ve made a dish similar before, Koshari. 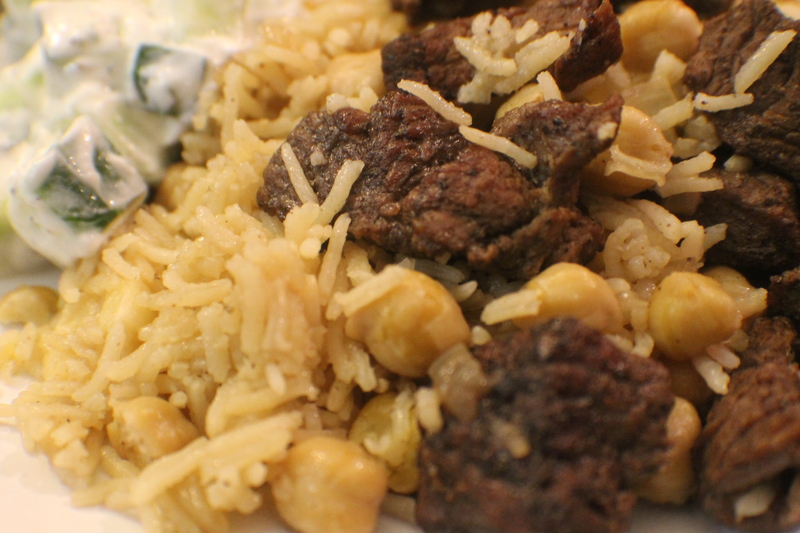 The biggest difference is that Koshari has chick peas and pasta and is generally served with a tomato-cumin sauce. 1. 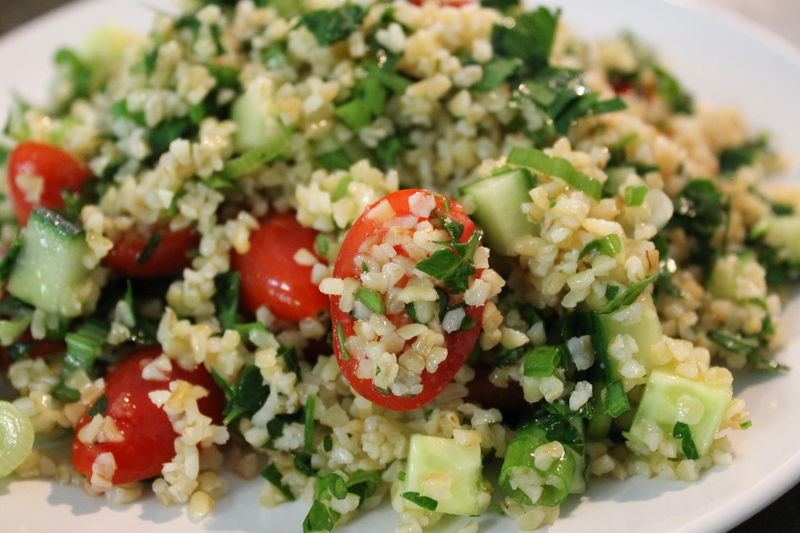 You can make this dish with white rice, brown rice, or burghul wheat. 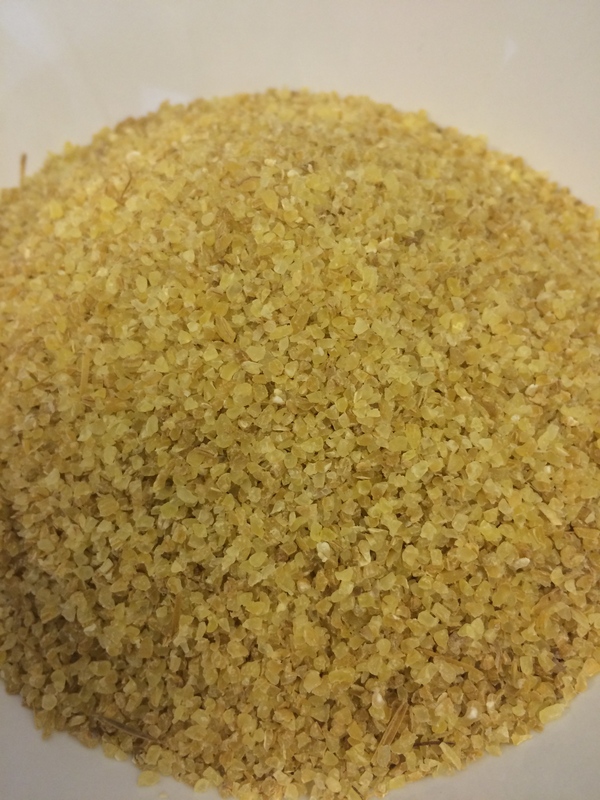 If you use burghul, be sure to use a #3 (medium coarse) or #4 (coarse) grind. 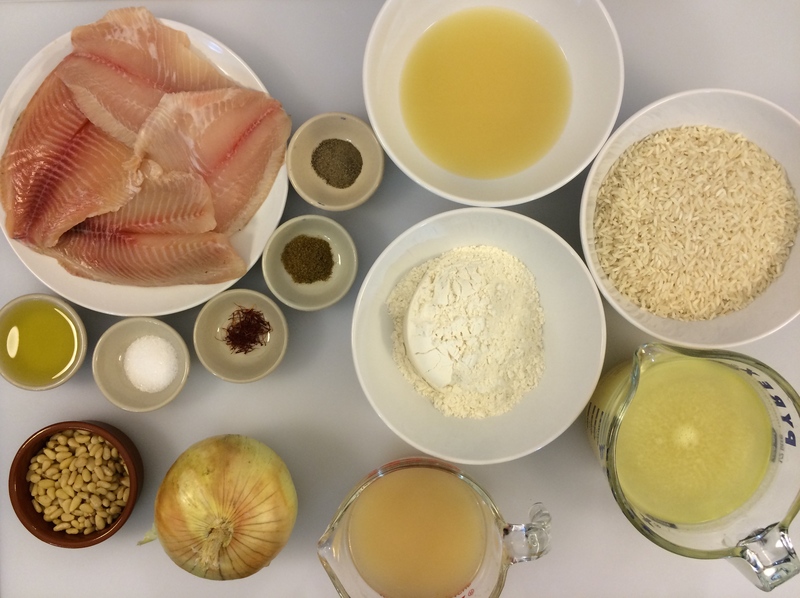 If you use burghul, it will be the standard 2:1 ratio you would use for white rice. 2. 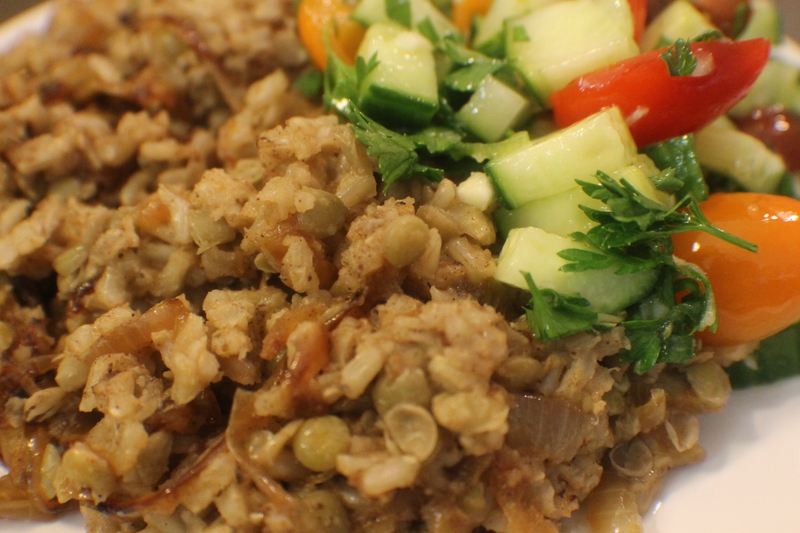 You can use either brown or green lentils. Don’t use red. They cook too soft for this dish. 3. My mom uses just cinnamon as the spice (other than salt & pepper). 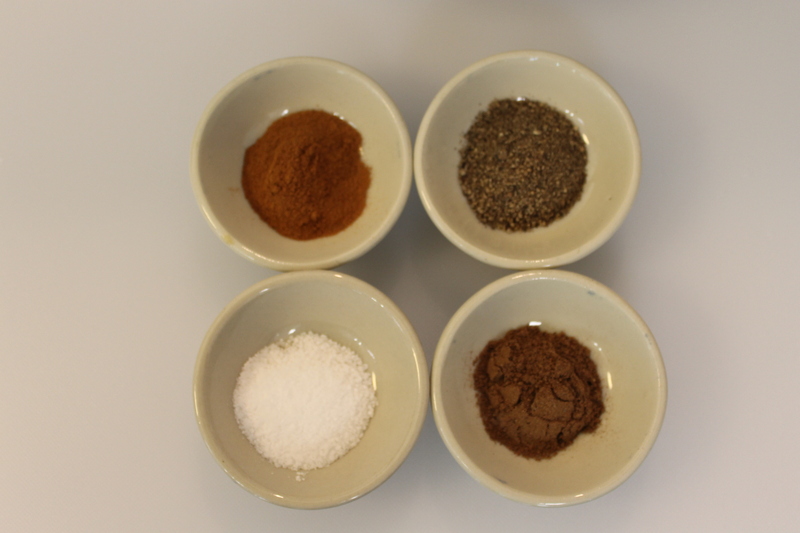 Play with the spices and come up with a combination you like. 4. While some do make this dish with meat, I’ve always eaten it as a vegetarian meal. If you want to add meat, follow the meat cooking instructions for Kidra. 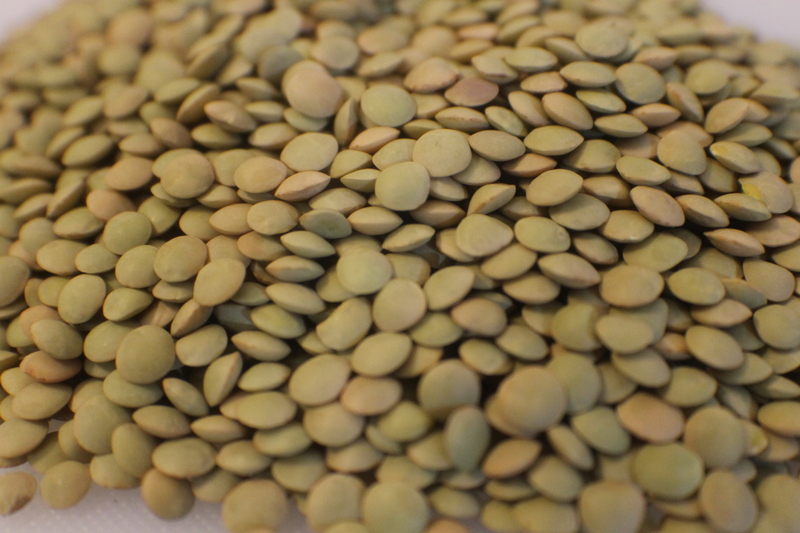 The lentils. Use brown or green. 1. 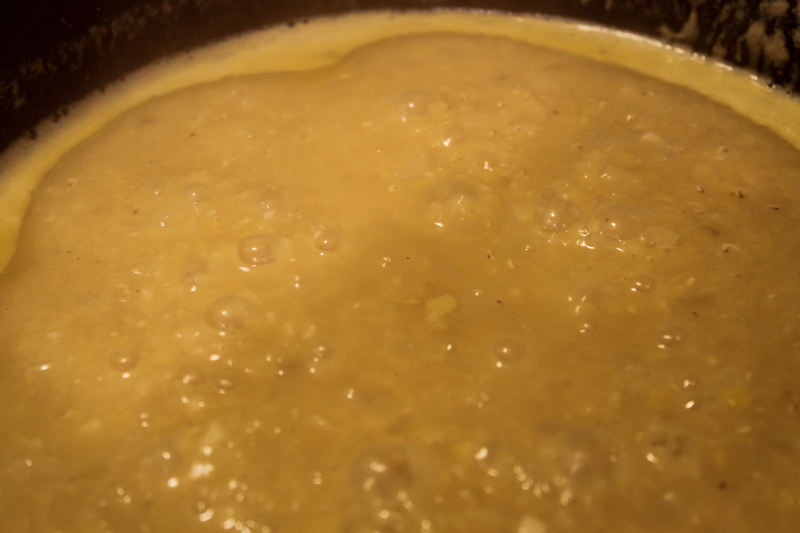 Heat 2 tablespoons of the oil in a large saucepan over medium-high heat. 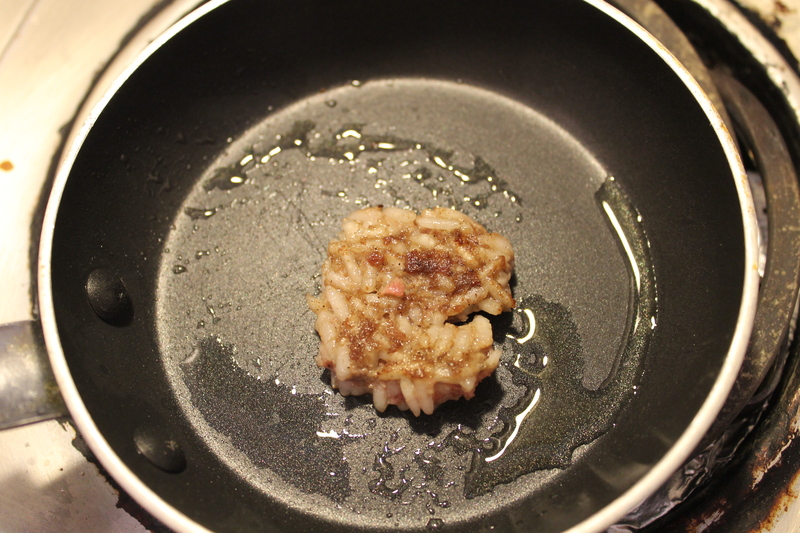 Add the rice and saute for 1 – 2 minutes. Sauteing the rice. I used brown in this post. Add the salt, pepper, allspice, and cumin. Cook until the spices begin to give off a fragrance, about 1 minute. Adding the spices. 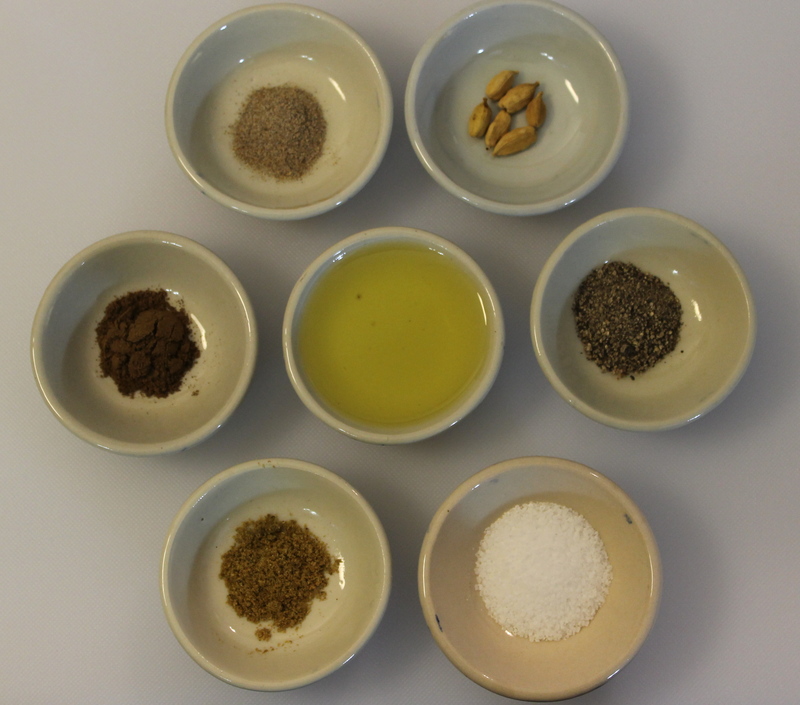 As you cook, the oils in the spices will come out and flavor the oil and rice. Be sure to stir constantly so the spices don’t burn. 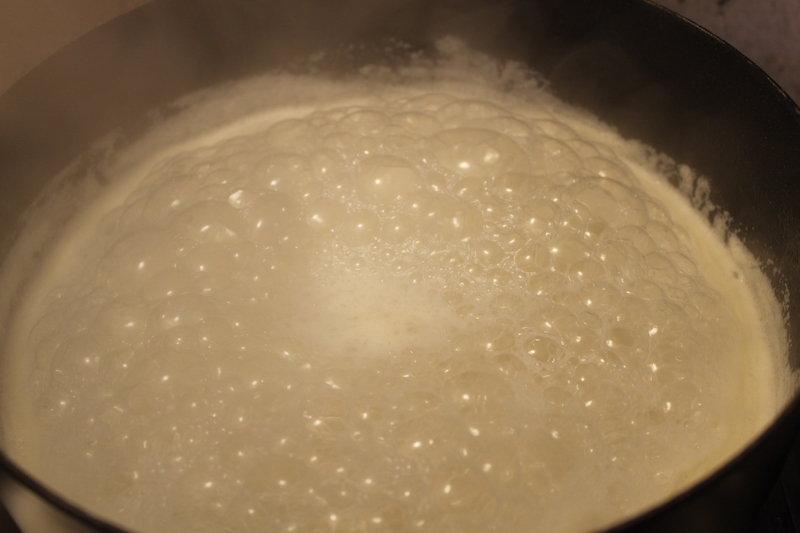 Add the water or broth, bring to a boil, cover the saucepan, and turn down the heat to low. 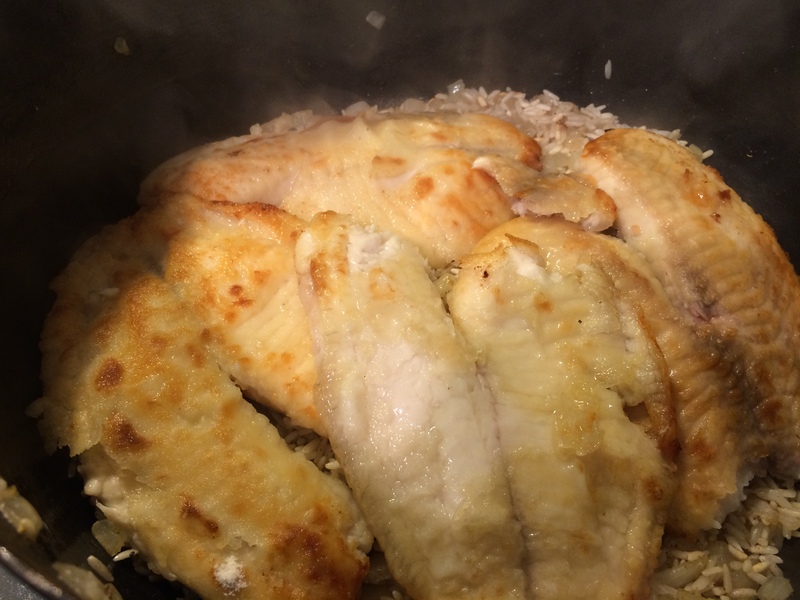 Cook until the rice is done – 25 to 30 minutes for white, 45 to 50 minutes for brown. 2. 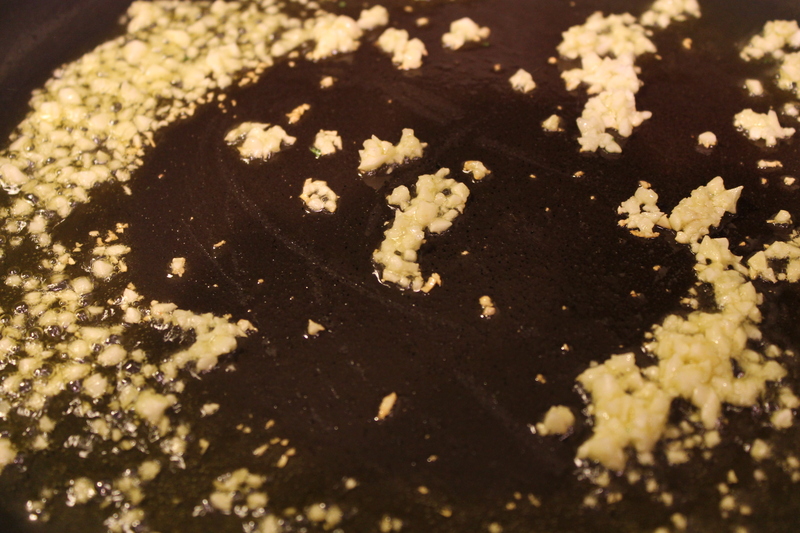 Meanwhile, heat the 1/4 cup olive oil over medium heat in a large, deep skillet. Add the onions and a pinch of salt. Stir occasionally, until the onions are soft and begin to take on color. Cooking the onions. When you get to this point, make sure you watch them closely. 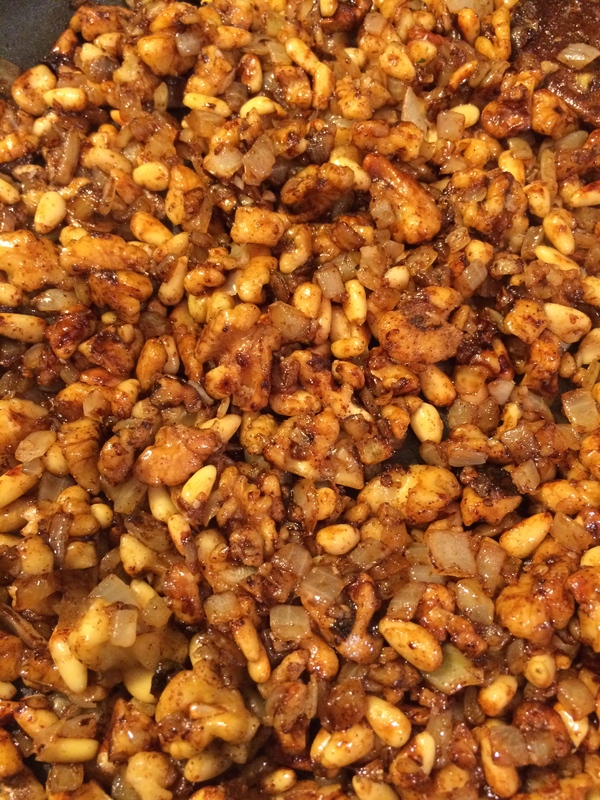 You want caramelization, not burning. 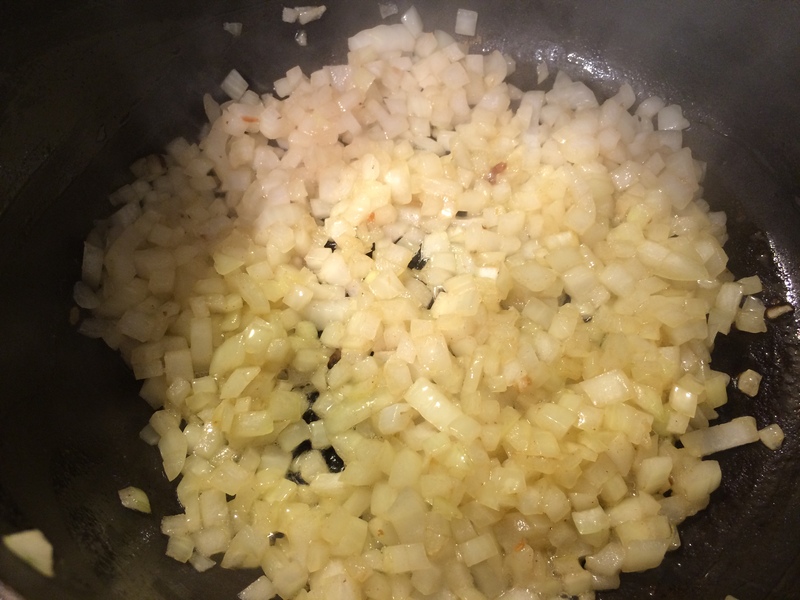 Once the onions begin to brown, watch them more closely and stir more often; you want the onions to brown, not burn. Cook them down as far as you like. (I prefer them to be fully caramelized.) 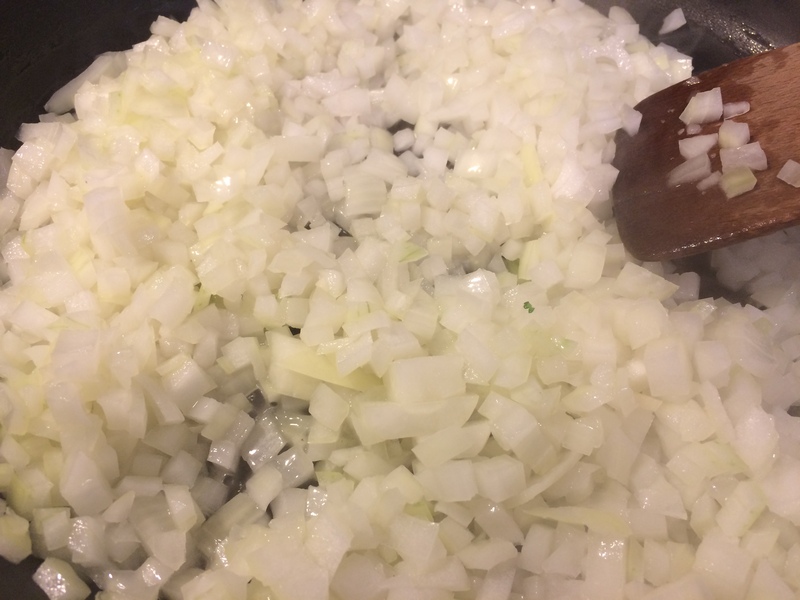 Depending on how dark you want the onions, it could take anywhere between 20 – 30 minutes to cook them. 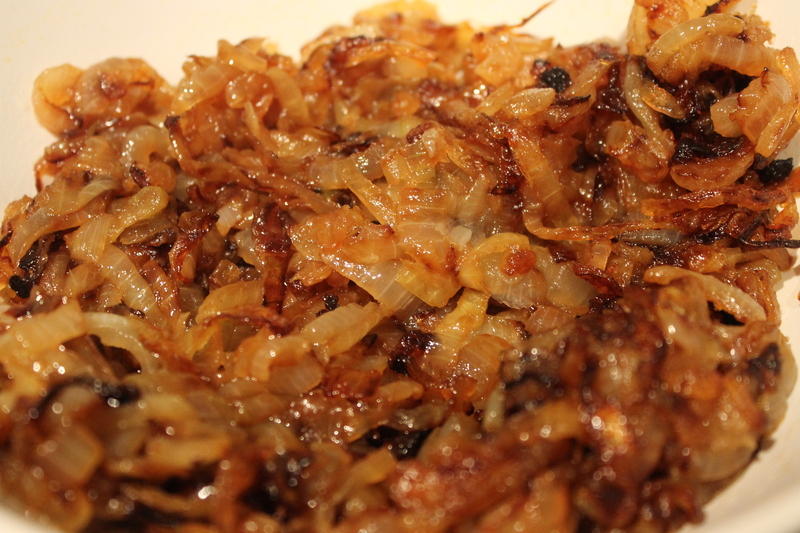 I like my onions well caramelized. This took about 30 minutes. 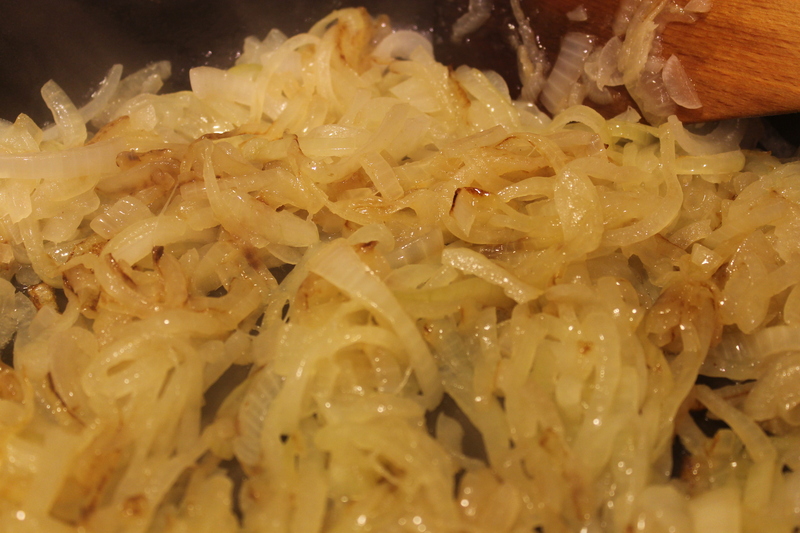 When the onions are done, take them off the heat and set aside. 3. 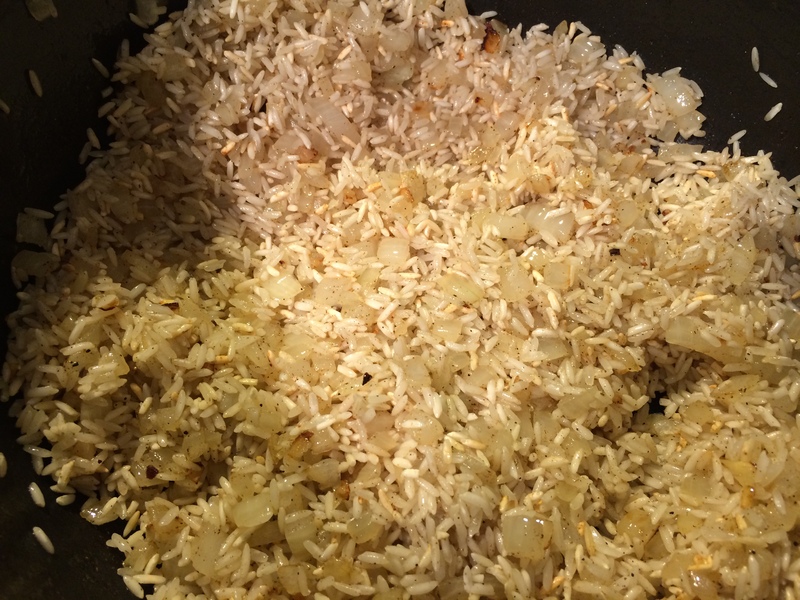 About halfway through the rice cooking time, place the lentils in a medium saucepan, cover with water to at least 1″ above the lentils, and bring to a boil over high heat. 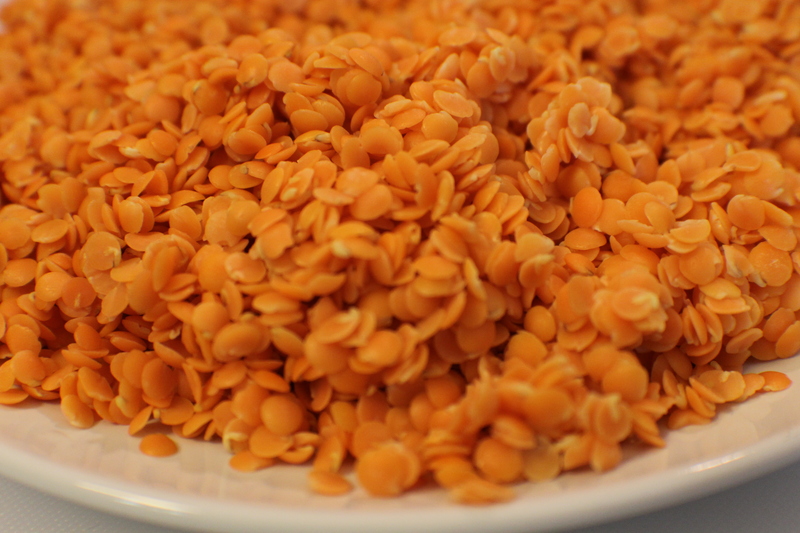 Cook the lentils, adding water as needed, until they are done, about 20 – 25 minutes. 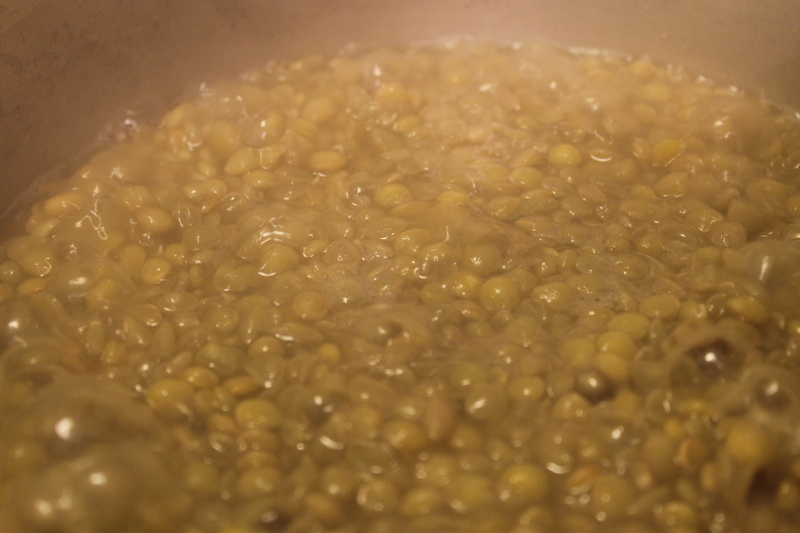 Boiling the lentils. Be sure to keep them covered with water so they don’t dry out. 4. 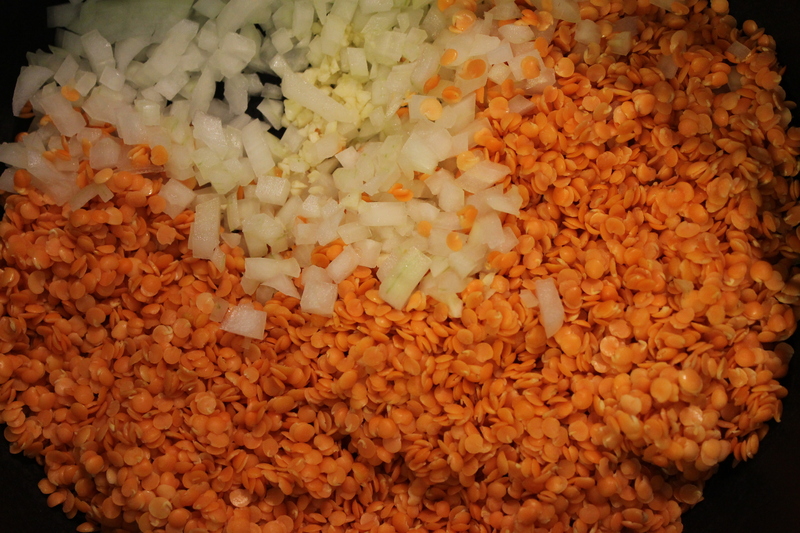 When the lentils and the rice are done, mix them together (I usually do this in the pot I cooked the rice in). Mix in the onions. Taste for seasoning. 5. 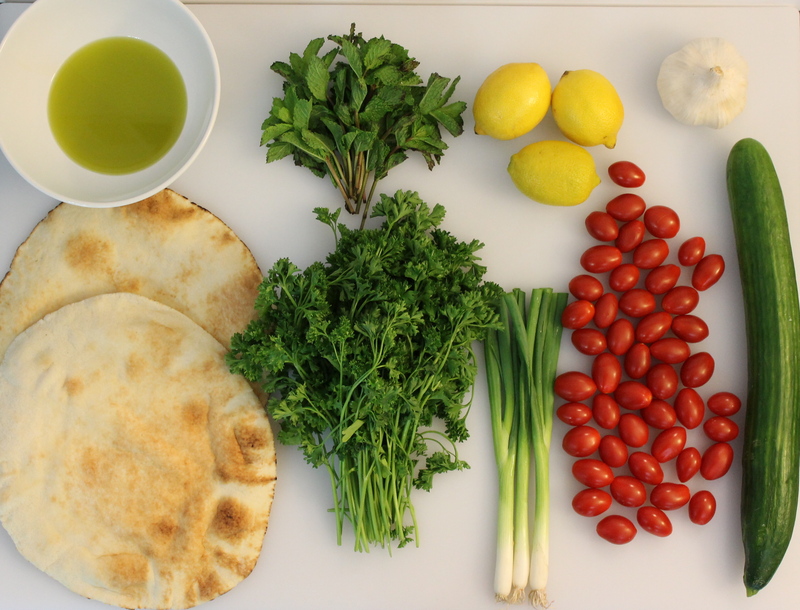 Mujadarah is usually served with either yogurt or a tomato-cucumber salad (basically tabouleh without the bulghur wheat). I’ve been feeling sentimental lately thinking about the foods from my childhood years. I’d forgotten how good some of them were and still are. It must also come with the realization that I’ve hit middle age and how I really need to eat healthier. 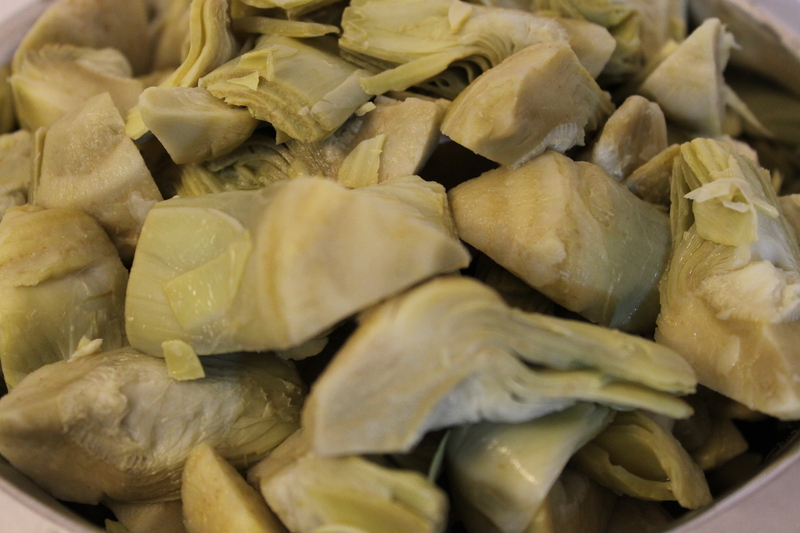 Kidra is another one of those dishes from our childhood that my sisters and I remember fondly. It was an every-once-in-a-while dish; it was never one of Mom’s favorites, so we didn’t have it too often. But, when we did have it, my sisters and I would gorge. 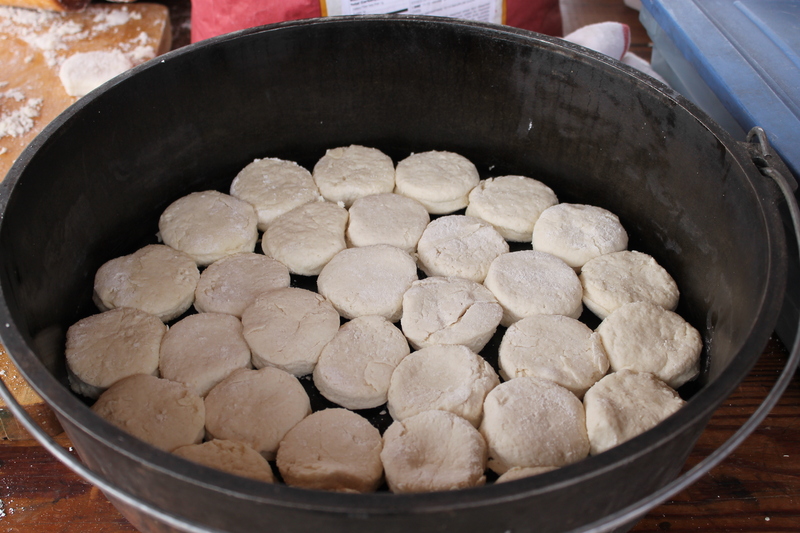 Traditionally, it’s a recipe that is baked in a large narrow-necked clay pot called a tanour (التنور). The pot was filled with the ingredients, sealed with a flour and water paste, and buried in an oven built into the sand where it was left to cook for hours and up to overnight. Once cities started growing, people would send not only their bread to the bakeries, but their tanour pots as well. 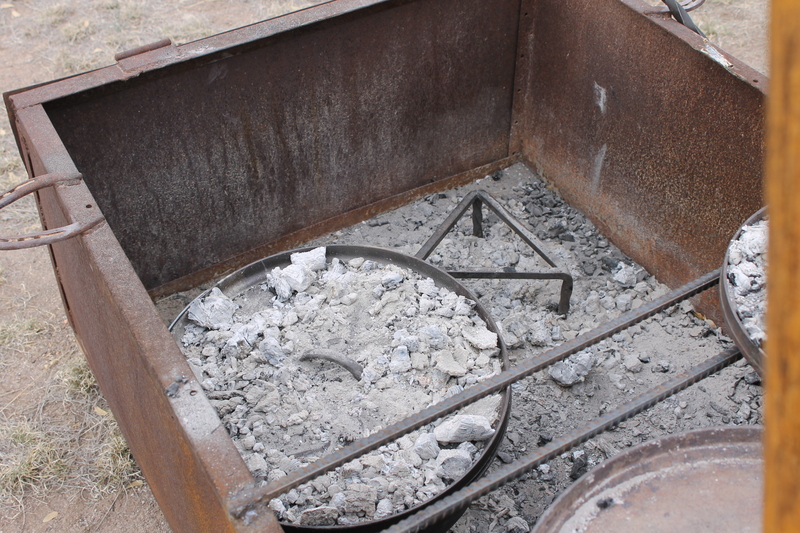 In some very remote areas, the Bedouin still cook Kidra this way. Now, many families have tanours made of lined copper that can be placed in the oven or on the stove (my parents have one) and it generally takes less than an hour for the Kidra to cook. This is dish cooked all through the Palestinian regions and families in the Middle East, but it is most popular in Gaza, where, from what I can tell, the dish originated. 1. If you don’t have a tanour, don’t worry. I don’t either. I used my Dutch oven. It works well. 2. 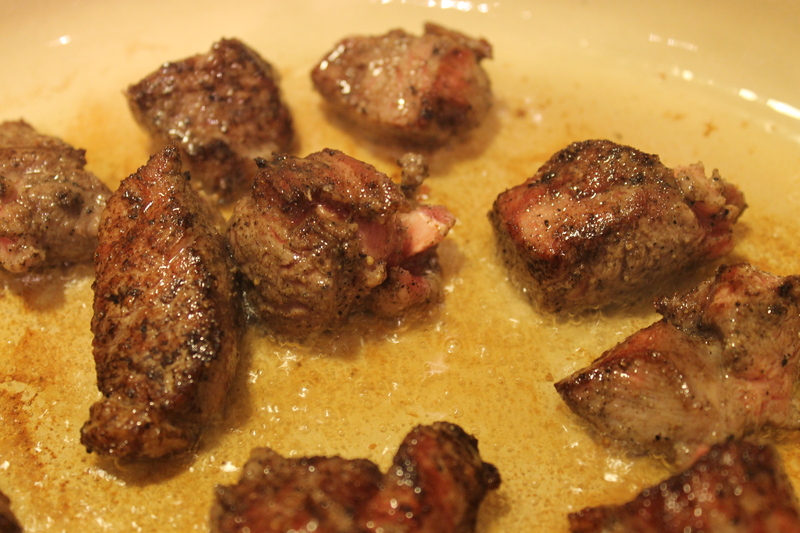 Lamb is the most traditional meat to use in this dish. You can use beef if you prefer. Either way, be sure to use a stew meat (shoulder, round). 3. 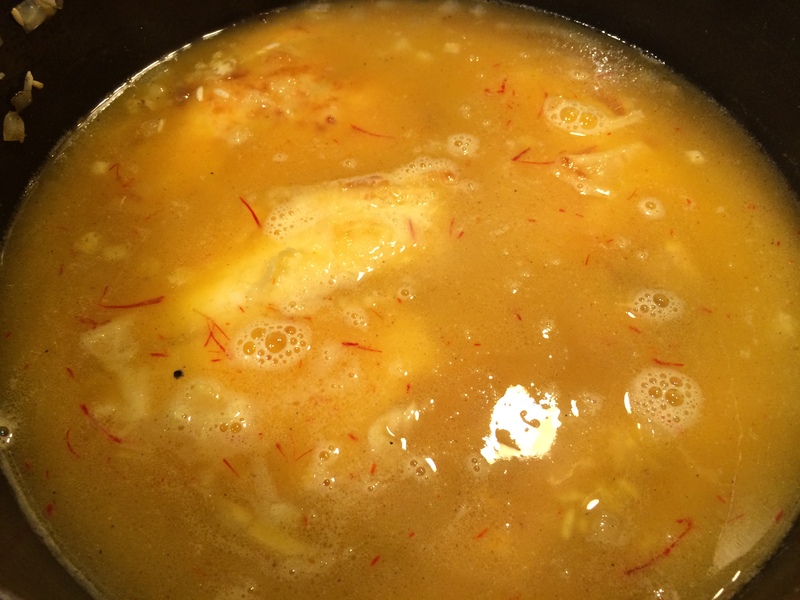 Some people will use saffron or osfour (the stamen of the safflower) to give the dish a yellow color. It is totally optional. My parents never used either of these in this recipe, so I don’t either. 4. Another traditional ingredient in this recipe is whole heads of garlic that are added just before the tanour goes into the oven. My parents never used garlic in their Kidra. 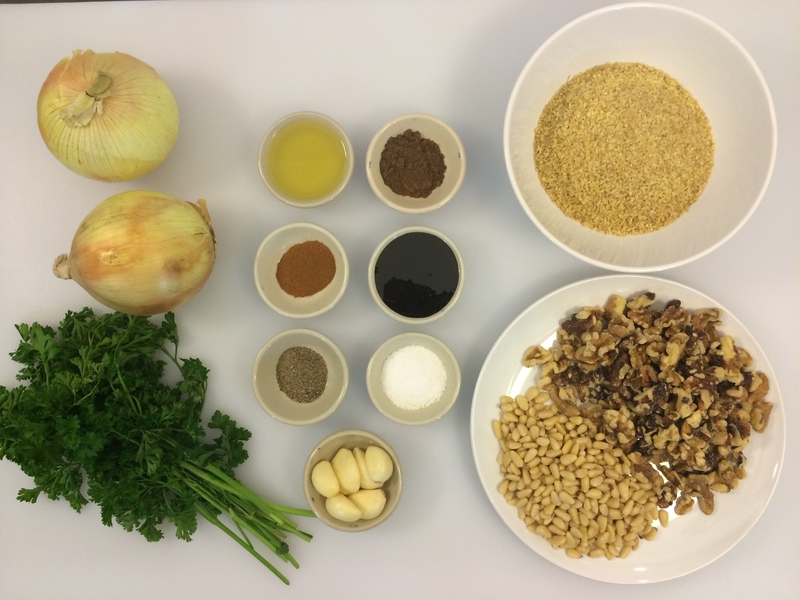 After doing some research, I decided I wanted to add garlic in my own recipe. 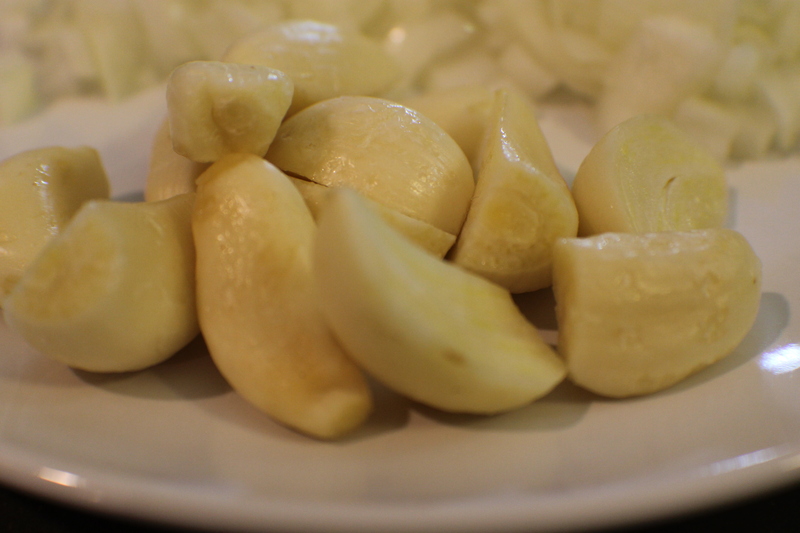 However, instead of whole heads of garlic, I use peeled cloves. I like it. Again, this is completely optional. 5. 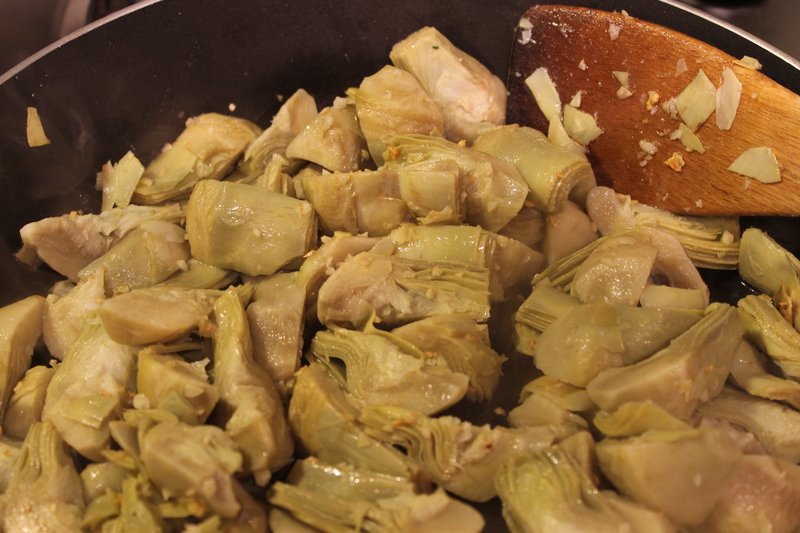 If you don’t have whole cardamom pods for this dish, it will be fine without them. However, you do miss out on some of the traditional flavor if you don’t use them. 6. 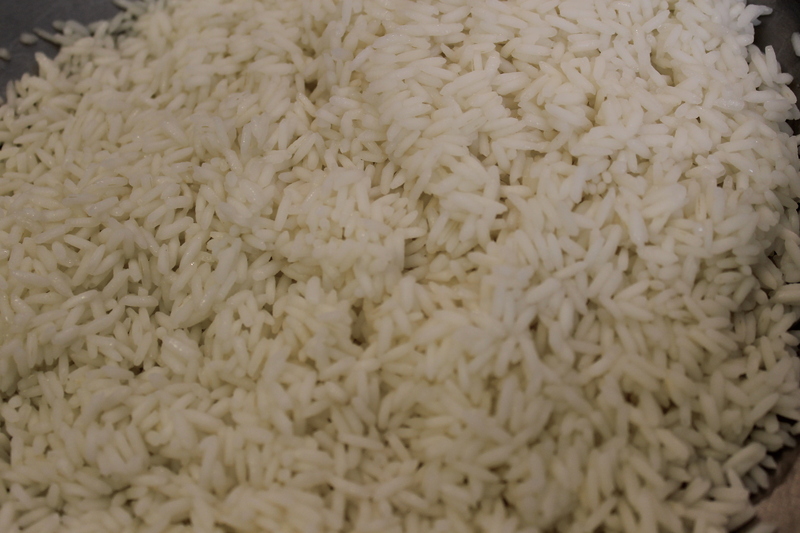 While white rice is most commonly used, you can use brown long-grain rice (brown basmati works well). Just add an additional 1/2 cup of liquid and add 15 -20 minutes to the cooking time. 7. You can make this vegetarian by using vegetable broth or water, omitting the meat, and adding more chick peas and/or fava beans. If you’d like to add some green, use fresh green beans (not haricot vert) and saute them at the same time as you would the chick peas. 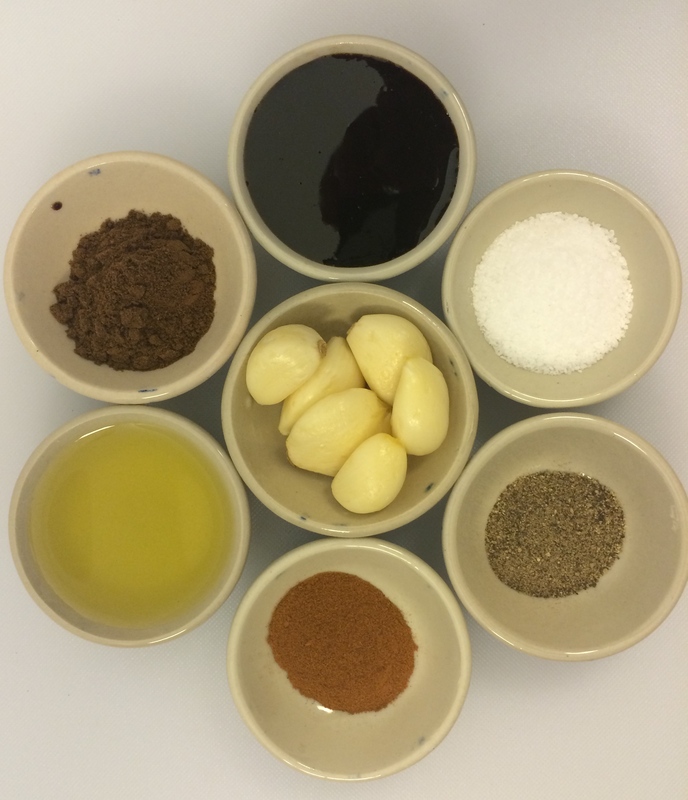 If your garlic cloves are large, cut them down to make the cloves more equal in size. Also, be sure to cut off the stem end because it doesn’t cook down and has an unpleasant texture. 1. Preheat the oven to 325F. 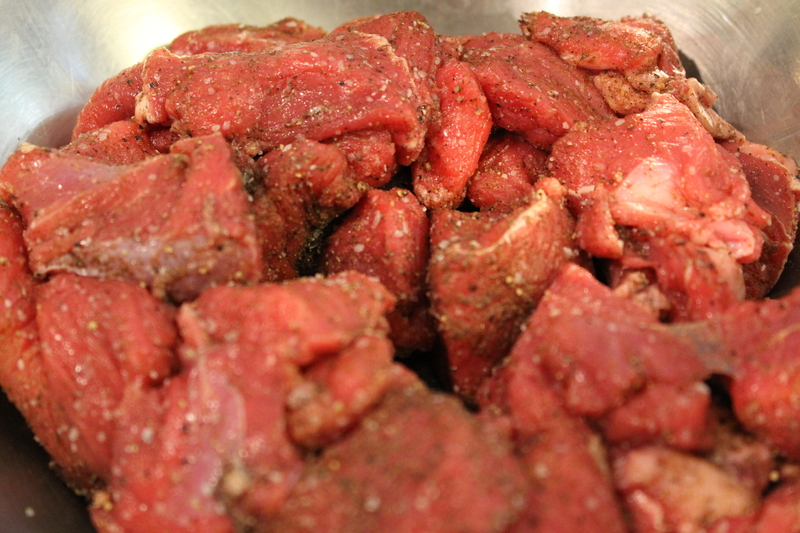 In a medium bowl, toss the meat with the spices. 2. In a Dutch oven, or, if you’re lucky, you have a tanour, heat the olive oil over medium-high heat. Brown the meat in batches; you want to get a good sear on the meat. If you crowd the pan, they will simply steam. Browning the meat. 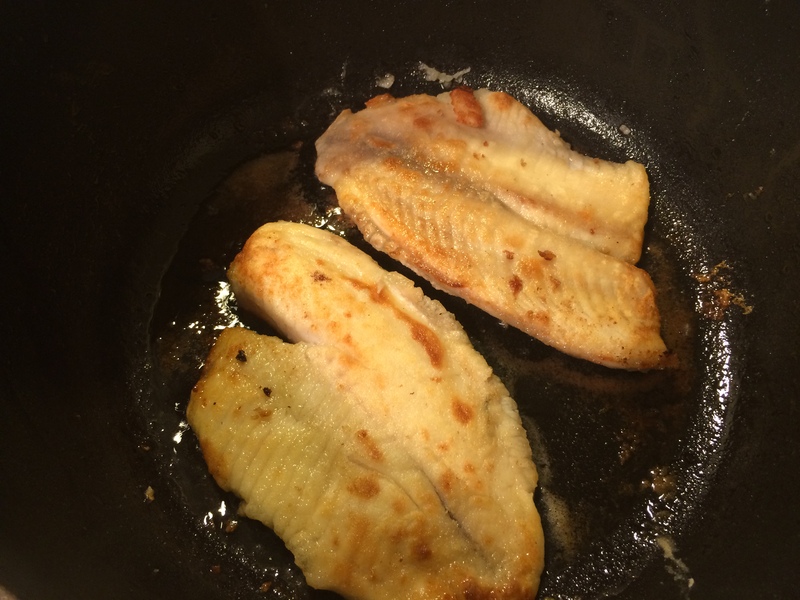 Don’t crowd the pan or instead of a nice brown crust, you’ll end up with grayed steamed meat. 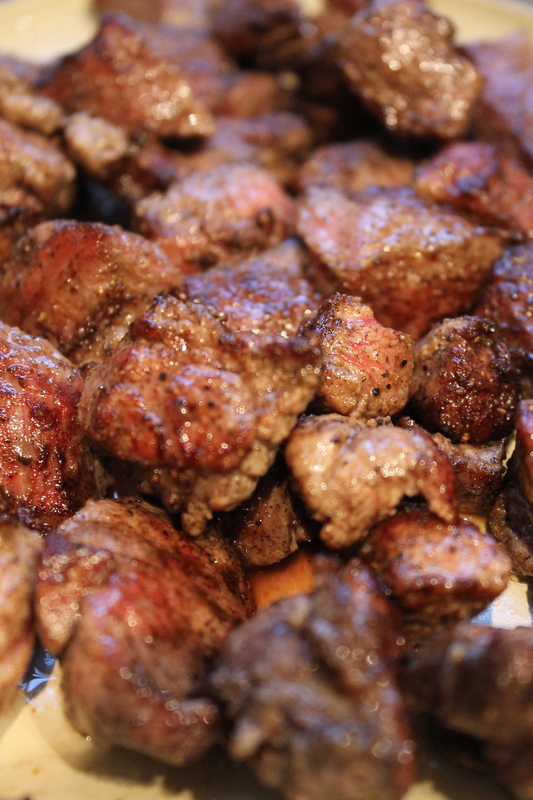 After each batch of meat is browned, take it out of the Dutch oven and set it aside. Repeat until all of the meat is done. The finished (so far) meat. I just put it in the overturned Dutch oven lid. It’s a Dad thing. 3. Saute the onions and garlic in the Dutch oven, about 5 minutes. 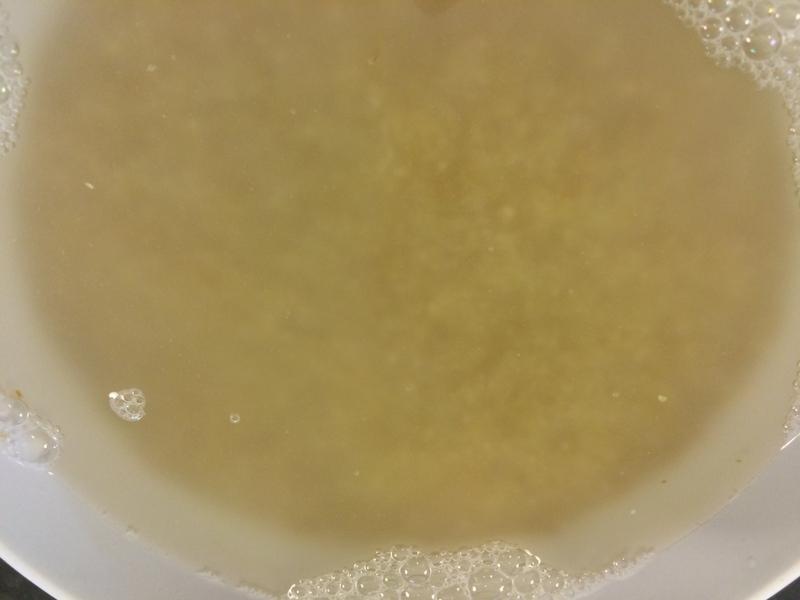 If you need to keep the brown bits on the bottom from burning, add about 1/4 cup of water or broth to help deglaze the pan. (It doesn’t have to be an exact measurement. Just eyeball it.) Stir frequently. Cooking the onion and garlic. If you need to, like I did here, add a little water or broth to deglaze the pan to keep the lovely browned bits from burning. 4. 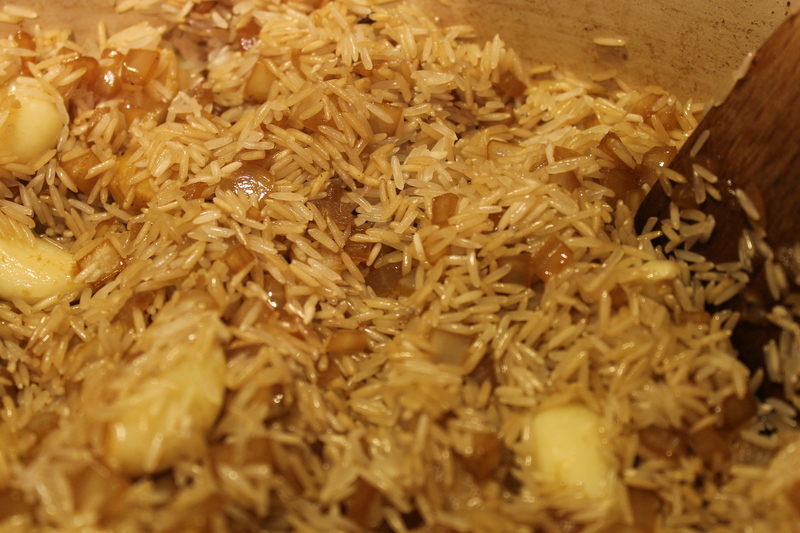 Add the rice and cook for another 2 – 3 minutes. Stir constantly. 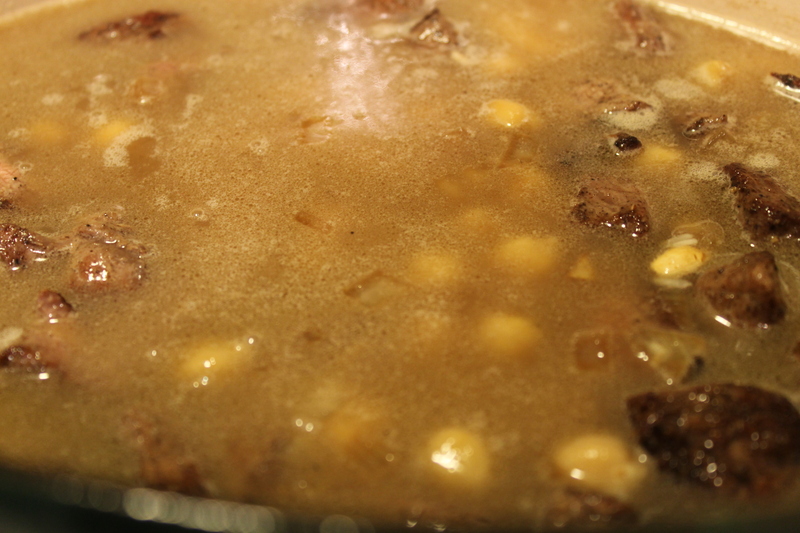 Add the chick peas and cook another 2 – 3 minutes. Again, stir often. Adding in the chick peas. 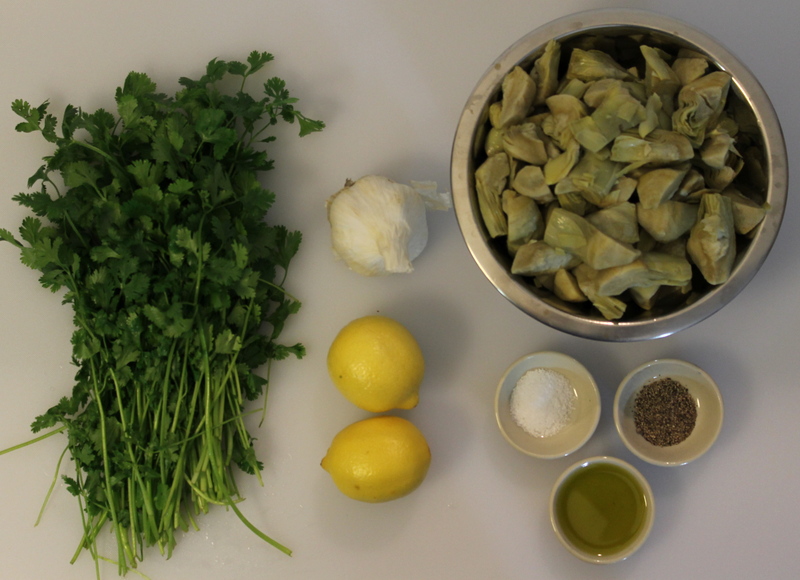 Then add back in the meat, cardamom pods, and the water or broth. Adding the meat, cardamom pods, and broth. 5. Bring the water or broth to a boil on the stove. 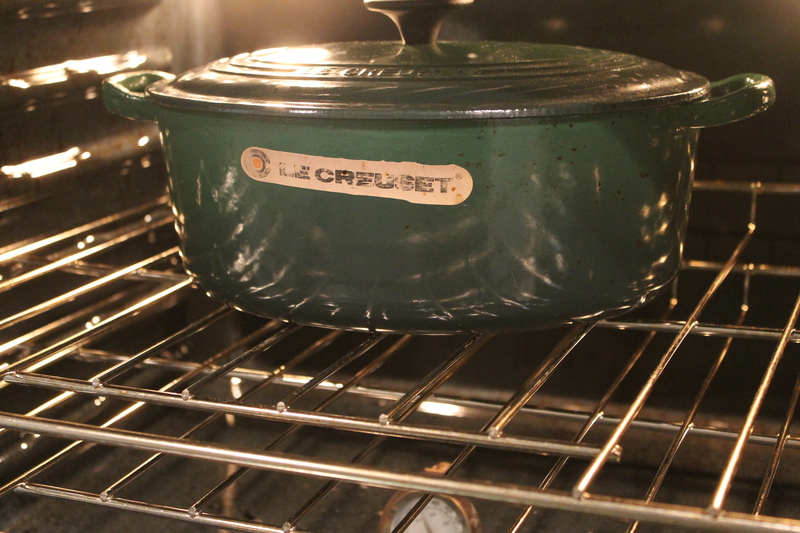 Cover the Dutch oven and place it on the middle rack in the oven and bake for 30 – 45 minutes, or until the liquid has been absorbed and the rice is cooked. Alternately, you can cook this fully on the stove (especially of you don’t have an oven-safe pot) on low heat for about 45 minutes, or, again, until the liquid has been absorbed and the rice is cooked. 6. 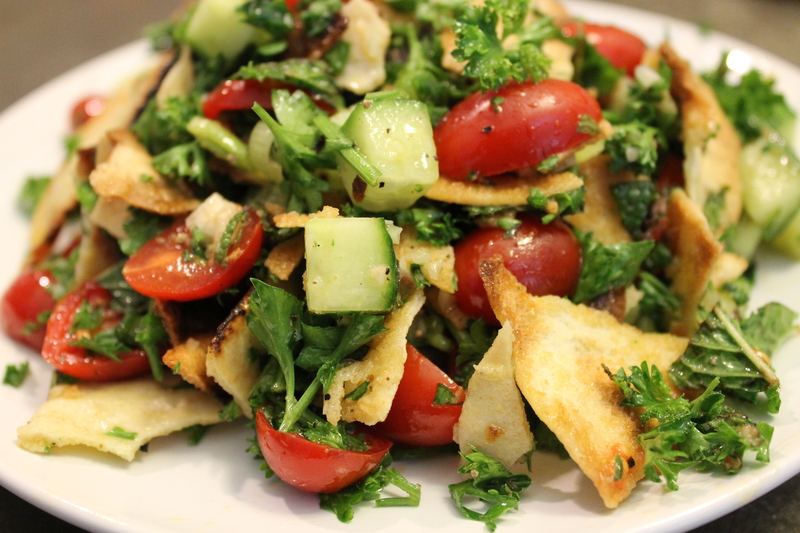 Serve with plain yogurt or cucumber-yogurt salad. If you use cardamom pods, be sure to let your guests know. The pods infuse a wonderful flavor but aren’t great to bite into. Stuffed Grape Leaves. In Arabic, محشي ورق عنب, or, spelled phonetically, mishi waraq ‘einab. It was another one of those dishes my sisters & I ate gleefully growing up. 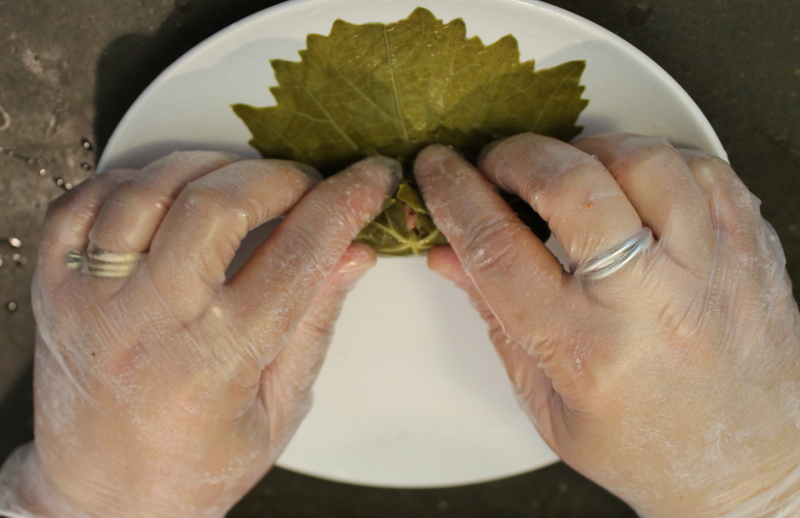 When Mom would make stuffed grape leaves, it was cause for great rejoicing. Especially for Dad. 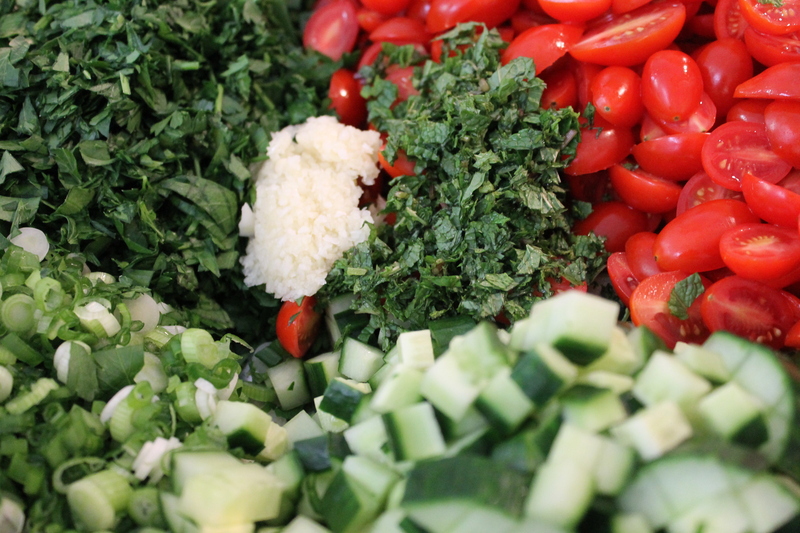 Many know the Greek word, Dolmas. 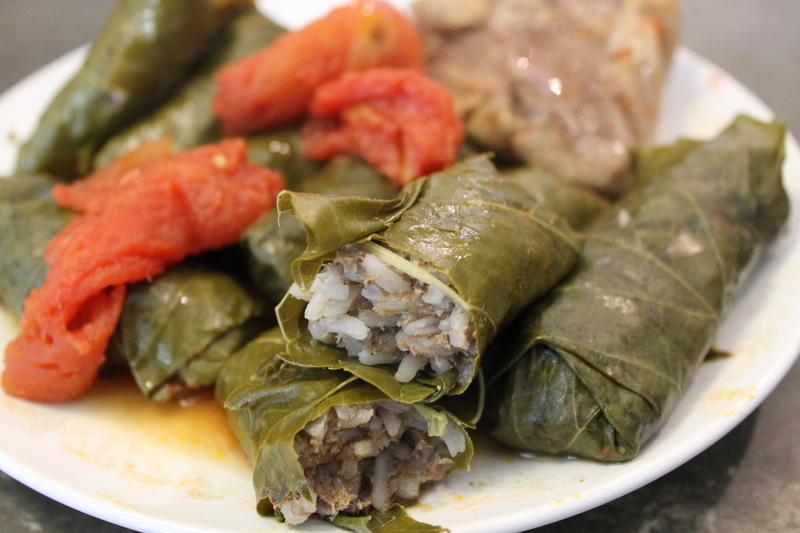 Dolma comes from the Turkish word “dolmak” meaning “to be stuffed”. In Arabic, “mishi” means “stuffed”. 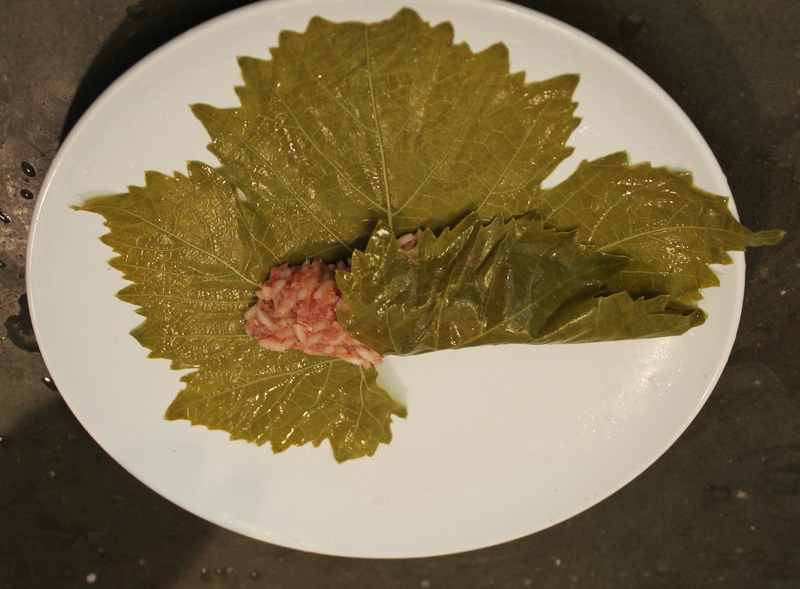 There are literally dozens of variations of stuffed grape leaves all over the Middle East, the Mediterranean, the Balkans, Central Europe, and Central Asia. 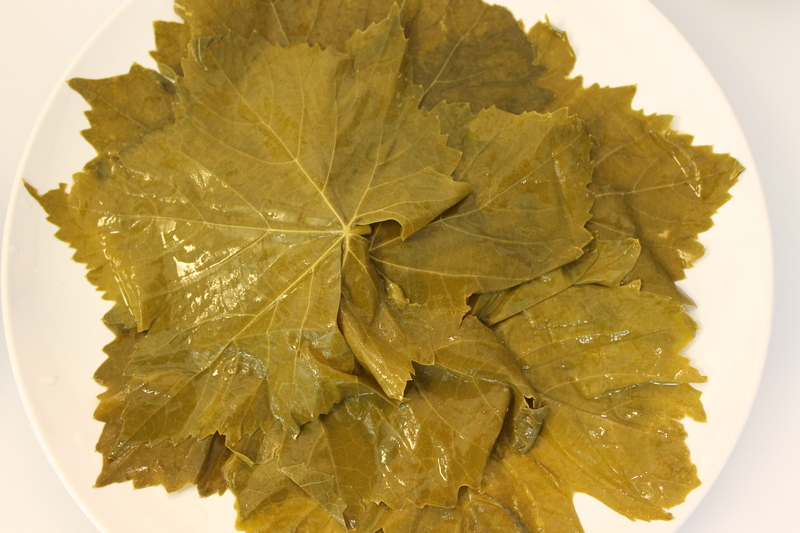 Probably the most common way to make the grape leaves is to cook them in an olive oil – lemon juice based-sauce. 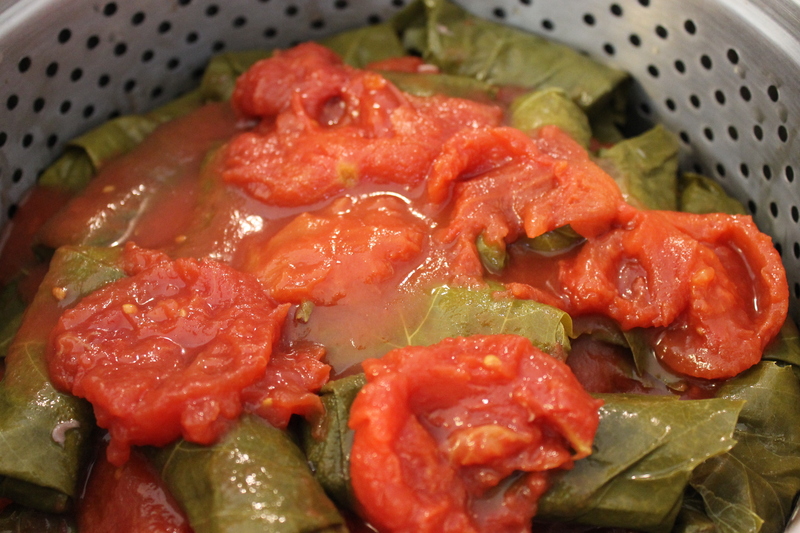 However, the way I was taught to make grape leaves was the way my grandmother made them; with a tomato-based sauce. I was talking to my mom about this one day. 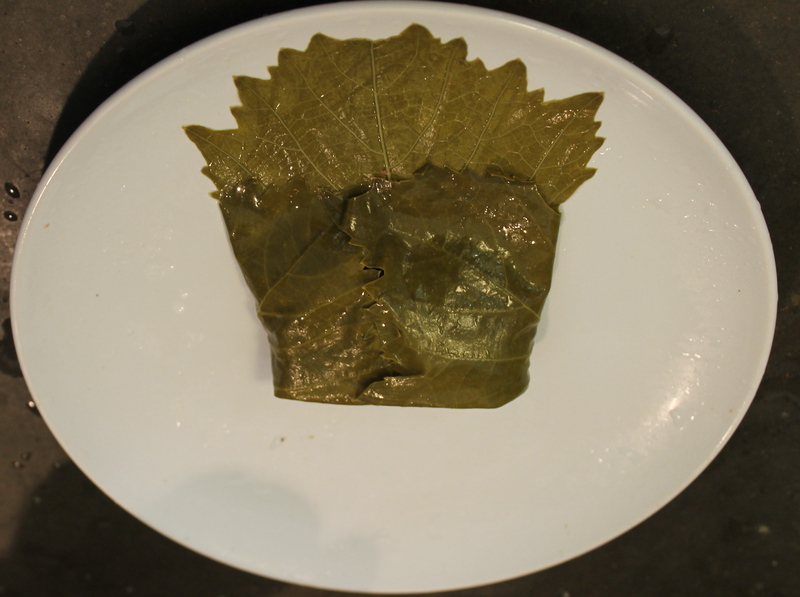 She said the first time she ever ate grape leaves, the sauce was made from sour grapes. She said it was awful. The next time she had the dish, my dad had made it the way he preferred and the way his mother made them – with tomatoes. I like to call it Palestinian-style. If you would like to make this dish vegetarian/vegan, substitute an equal amount of roasted eggplant for the meat, vegetable broth for the beef broth, and add 1/4 cup tomato paste to the stuffing (this will help the filling bind together). 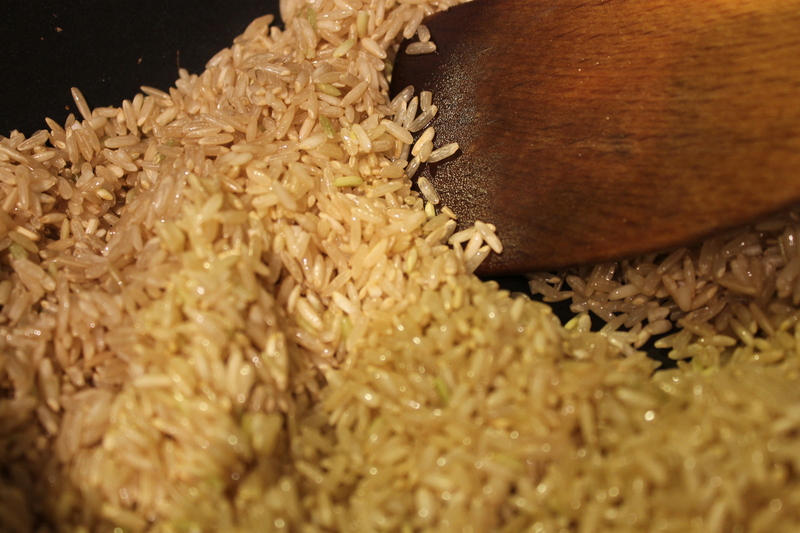 If you would like to use brown rice in place of the white rice, be sure to add 20 – 30 minutes to the cooking time. 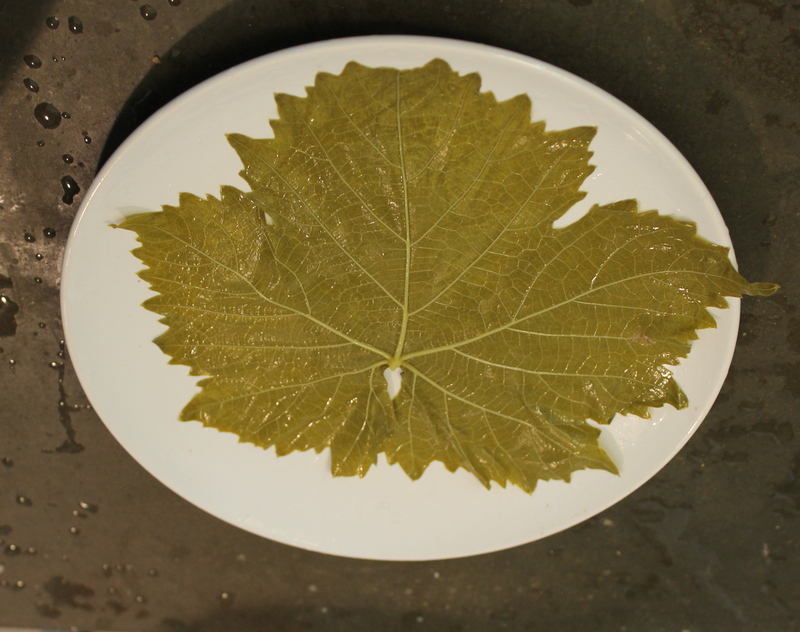 The grape leaves. 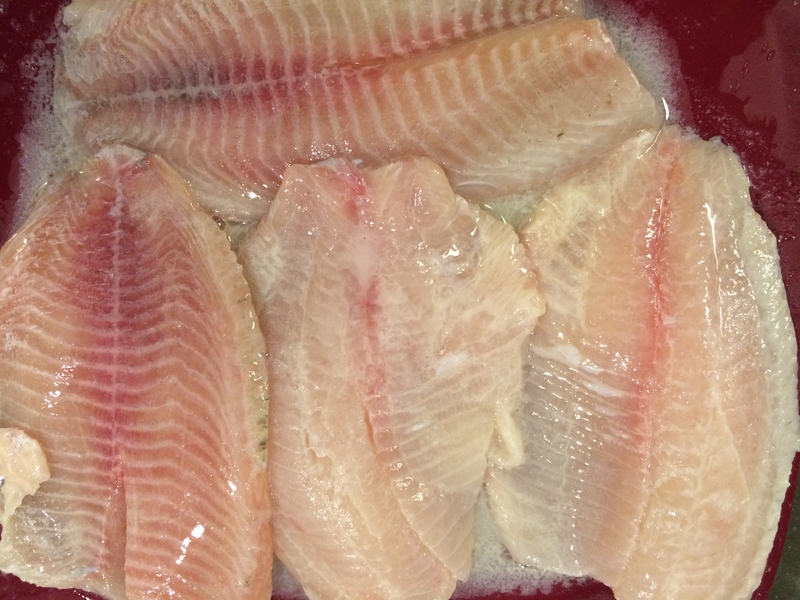 Be sure to rinse them thoroughly after removing them from the brine; otherwise, the end result will be like a salt lick. 1. Take a large saucepan or stockpot and place a rack on the bottom. 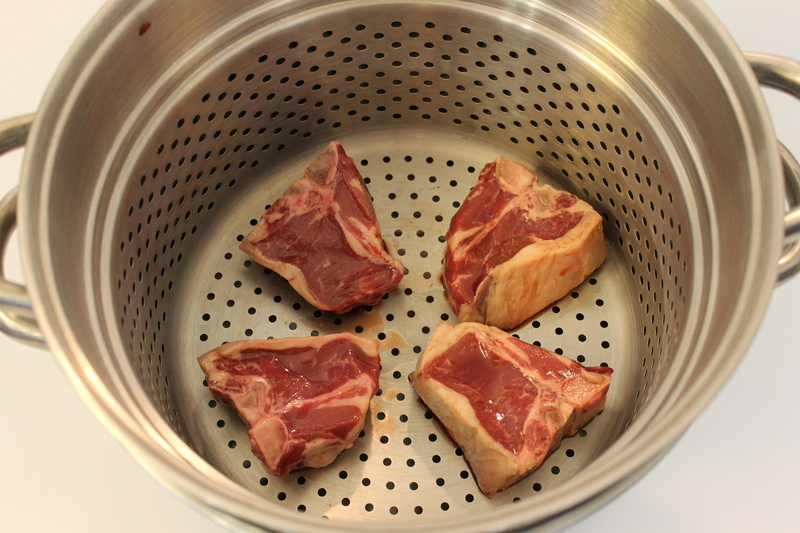 If you don’t have a rack, use a steamer that sits in the saucepan. (I like to use my pasta pot with the insert.) 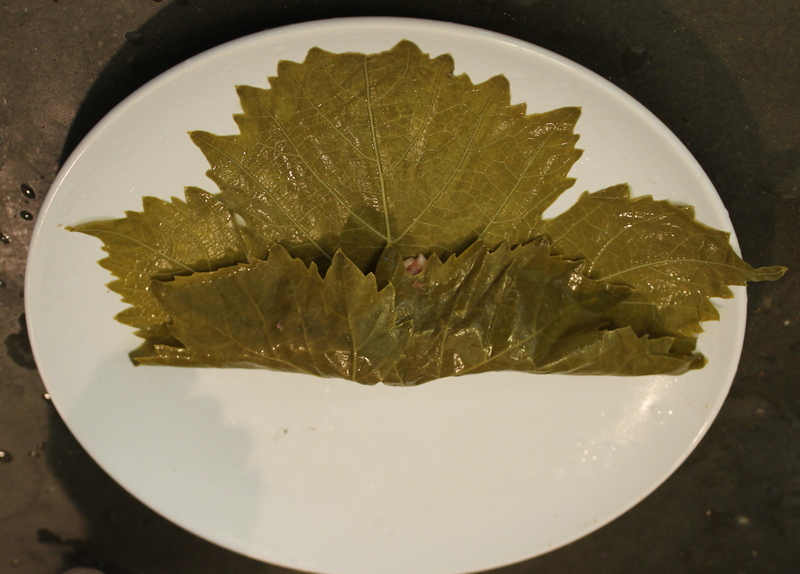 This is done not only to keep the grape leaves off the bottom to keep them from burning but to help steam the stuffed leaves as they’re cooking. If you are using shanks, chops, or ribs, place them on the rack or steamer. Set aside. My dad always used chops or shanks in the bottom of the steamer. It adds a lot of flavor to the final dish. Plus, it’s an extra treat. 2. 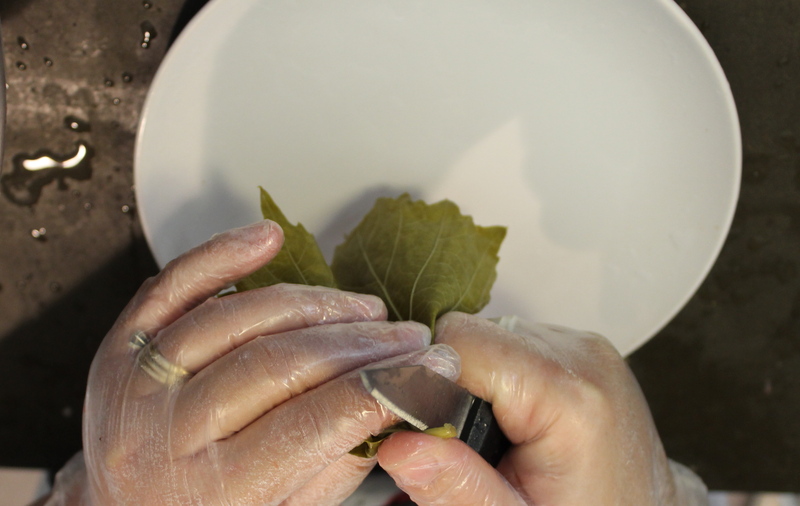 Carefully take the grape leaves out of the jar (take care not to rip the leaves) and rinse thoroughly. 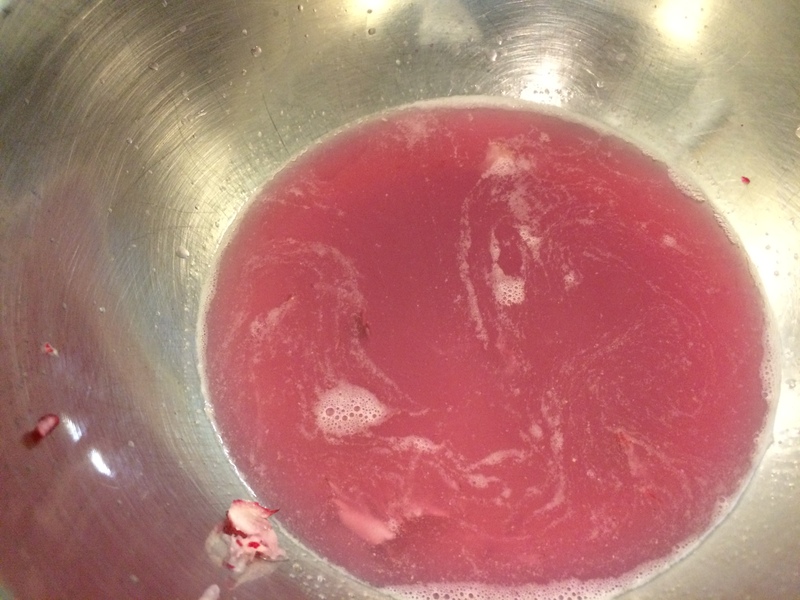 You want to be sure that the brine is rinsed off. 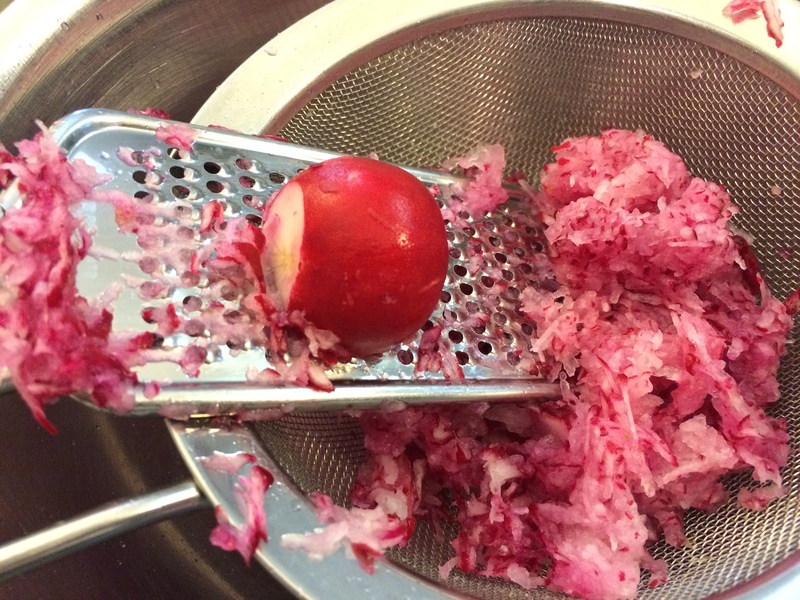 Usually, you will need to separate the leaves when rinsing. I’ll also fill a large bowl with water and let the leaves soak for a few minutes, then drain. You want the water to be as clear as possible. 3. 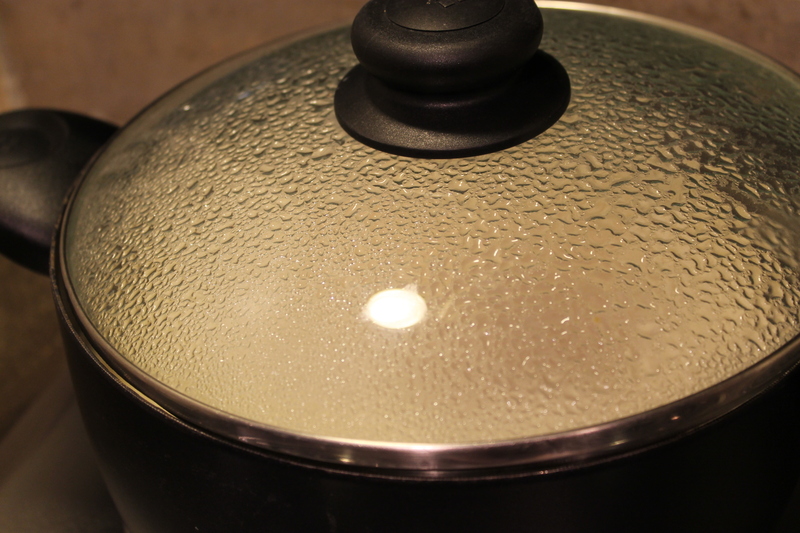 Parboil the rice: In a large saucepan, place the rice and cover it with 1″ of water. 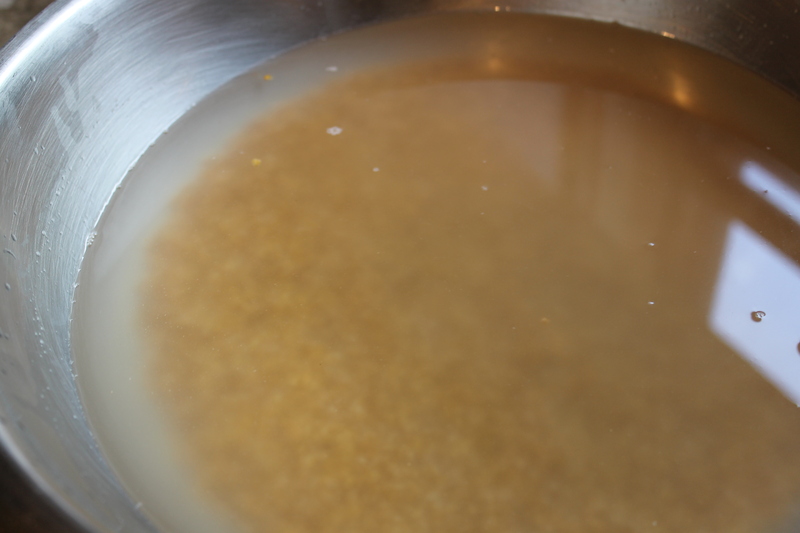 Over high heat, bring the water to a boil, stirring frequently to keep the rice from sticking. Parboiling the rice. Be sure to stir frequently to be sure it doesn’t stick to the bottom of the pot. 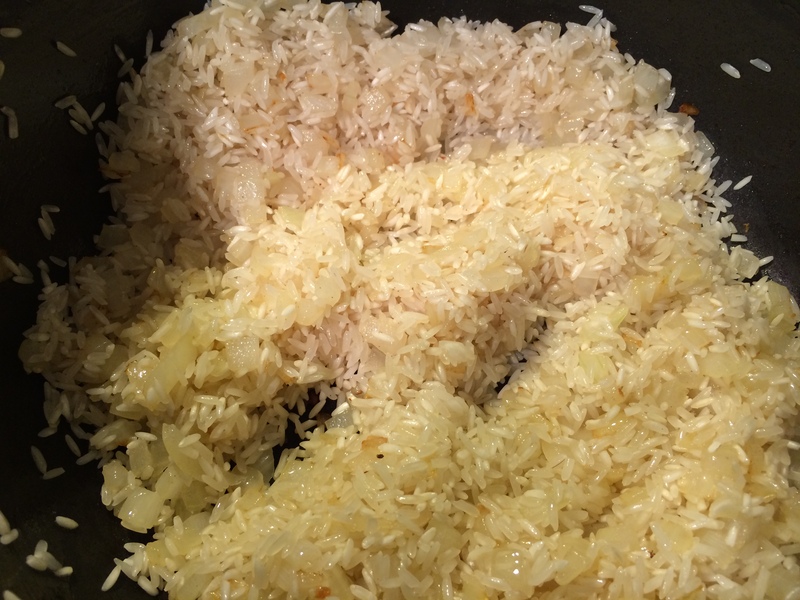 Boil the rice until it is about halfway cooked (take some rice out of the water and test it; it should be slightly chewy with a very crunchy center). Drain the rice in a colander and set aside until it is cool enough to handle. 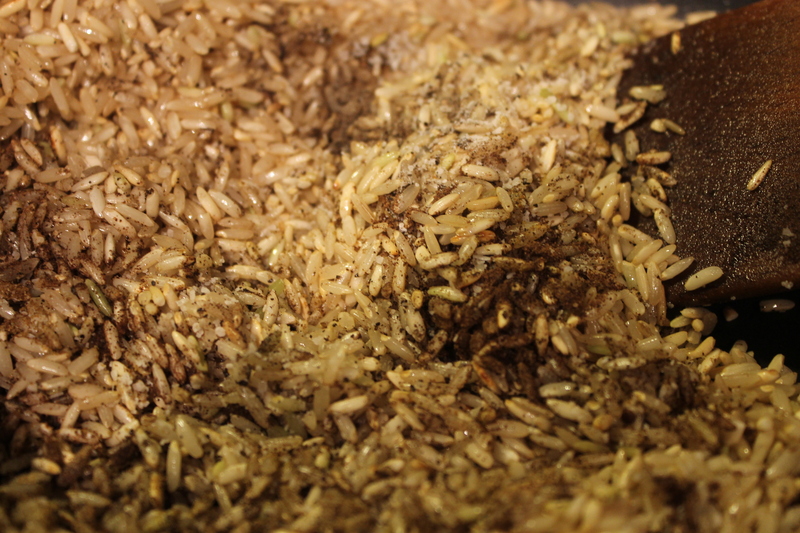 The finished rice. Let this sit until it’s cool enough to handle. 4. 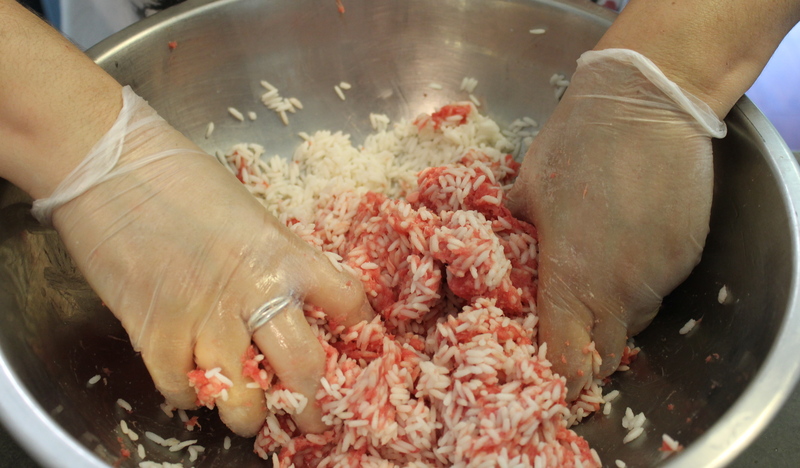 In a large bowl, mix together the meat and rice (it’s best to use your hands for this). Add the spices and mix thoroughly. 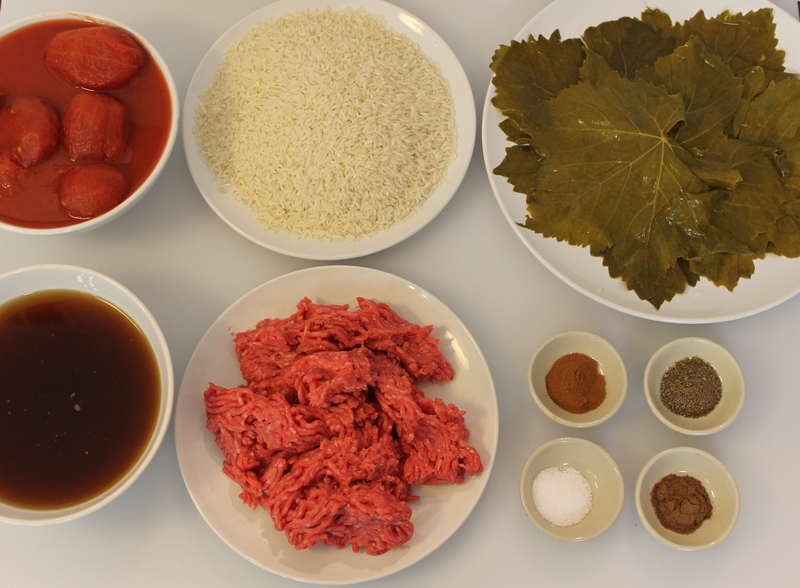 Starting to mix together the rice and meat. It’s best done with your hands. After adding the spices. My mom says she knows when it’s seasoned right because of the smell. I’ve not yet mastered that skill. To taste for seasoning, take a small amount of the mixture and place in a hot skillet to cook (the flavor will be closer to what the finished dish will taste like). Adjust the spices to your taste. Cooking a small sample to taste for seasoning. I also consider this cook’s treat. The most important thing to remember is to not wrap the leaves too tight. You want snug, but not tight. 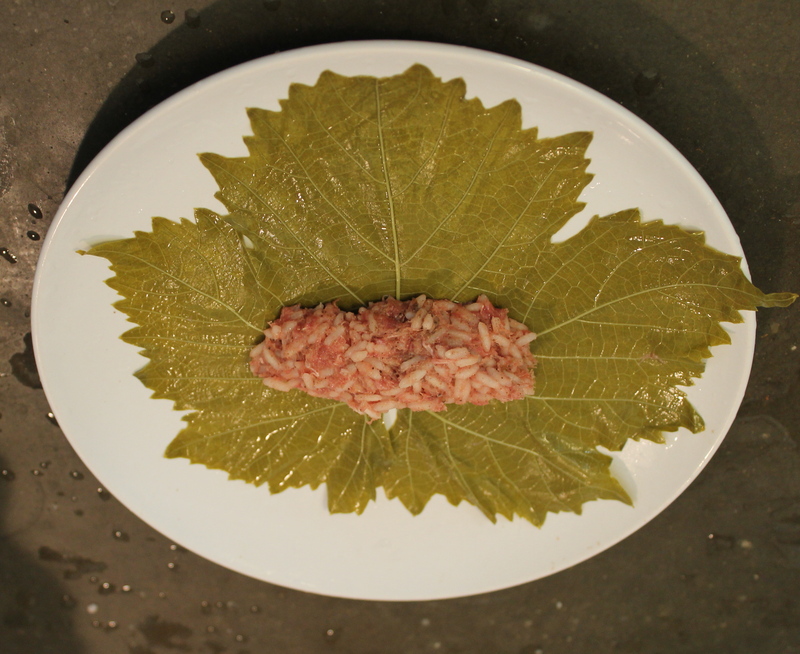 The rice will continue to expand when the stuffed leaves are cooked. If you wrap them too tight, they’ll burst. Conversely, if you wrap them too loosely, they’ll fall apart. A happy medium is preferred. 1. Cut off the stem with a sharp knife. 2. Lay the leaf flat with the vein (rough) side up facing you. 3. 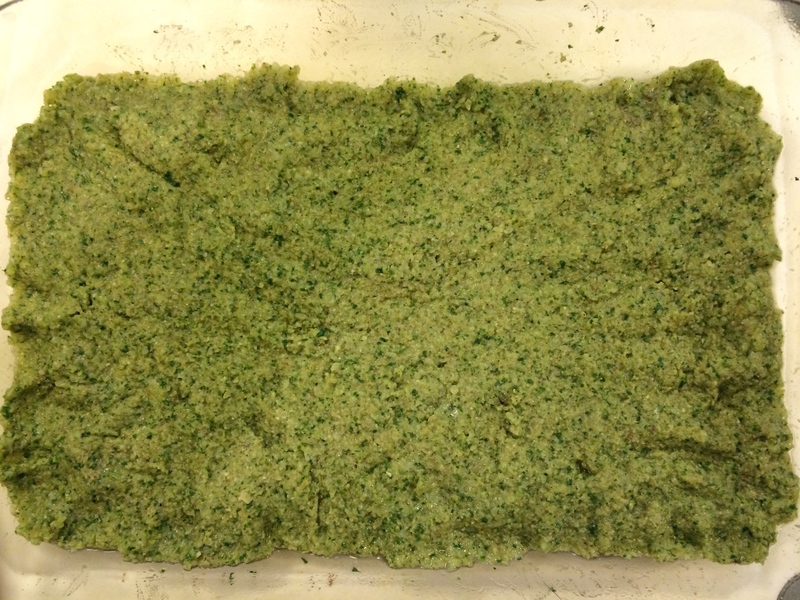 Take some of the stuffing (this was a large leaf, so I used about 2 tablespoons stuffing), press it together loosely into a sort of log shape. Please it on the bottom 1/3rd of the leaf. 5. Repeat with the other side. The stuffing should be covered. 6. 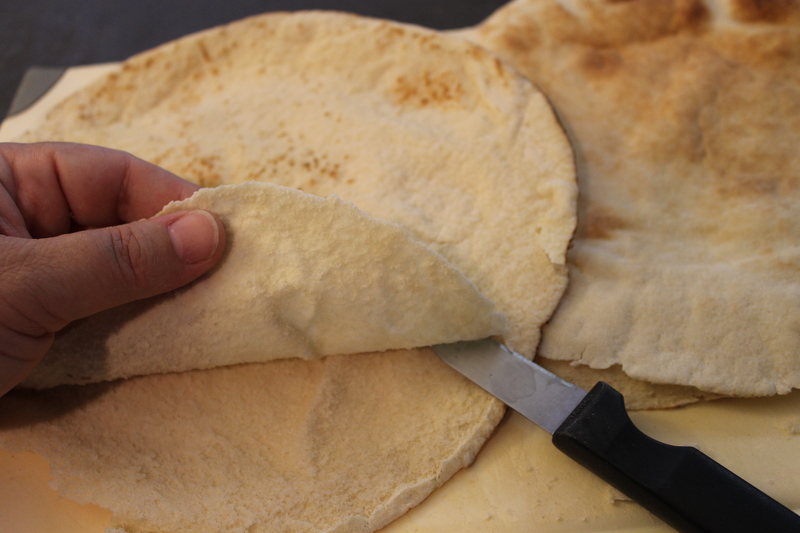 Now, fold the sides over the filling. 7. Repeat with the other side. 8. 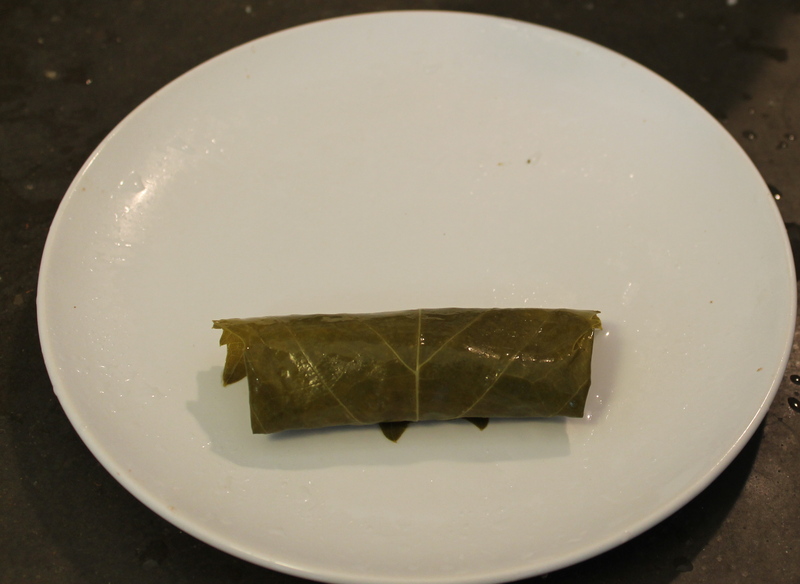 Now, finish rolling the leaf until the stuffing is fully enclosed. 9. Done! Now, do this another 40 times or so. You want to be sure that the amount of filling you use is proportional to the size of the leaf. 6. As you make each roll, place it in the pot. 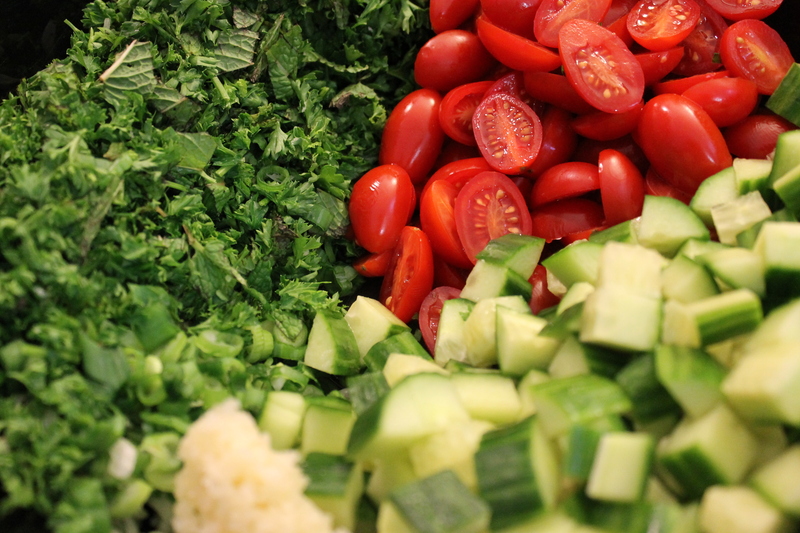 When you are about halfway through, crush a few of the tomatoes with your hands and lay them on the finished leaves. Pour on some of the tomato juice. Finish stuffing the remaining leaves. Crush the remaining tomatoes and place them on top. Pour over the rest of the tomato juice and the beef broth. The grape leaves in the pot ready to cook. 7. Cover the pot and bring the liquid to boil over high heat. Lower the heat to low, keep the pot covered, and cook until the rice and meat are cooked, about 30 – 45 minutes. You’ll need to take one out to test. 8. 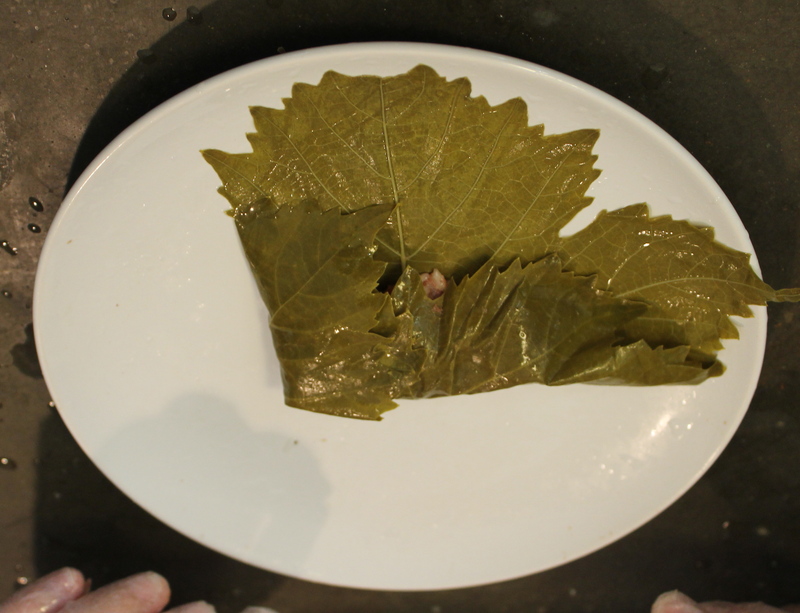 When the grape leaves are cooked, place a serving on a plate, carefully pull out one of the shanks or ribs, and spoon out some of the broth to pour over the leaves on the plate. You can also have some yogurt and pita bread on the side. Admittedly, this is a dish that does take some time to put together. But, the results are well worth it. Friday was my busiest day and it dawned early for me. Too early. I was up late into Thursday night starting prep for my cooking class and was exhausted by the time I fell into bed. However, even after 16 years of teaching cooking classes, I never sleep well the night before because I tend to worry too much about everything that might go wrong. So, long story short, I laid there in bed for another 2 hours trying in vain to go back to sleep. Then, the alarm went off. 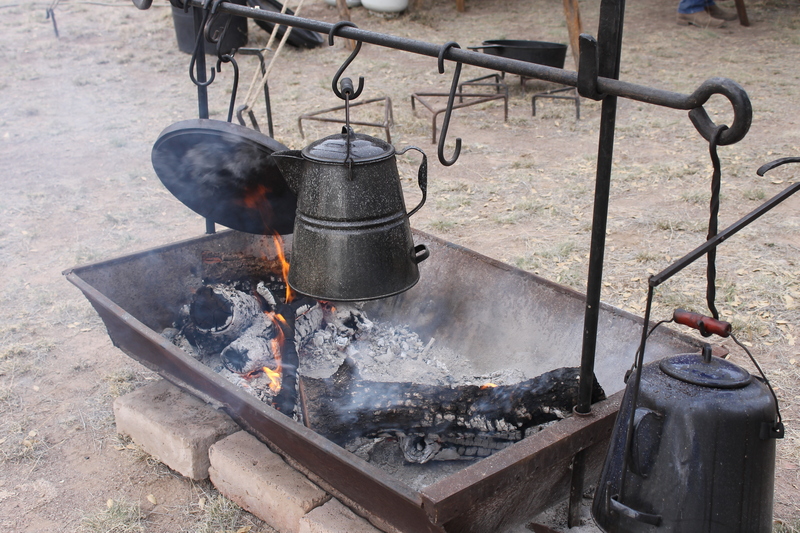 It was time to get up and head to the Cowboy Breakfast at Fort Davis. 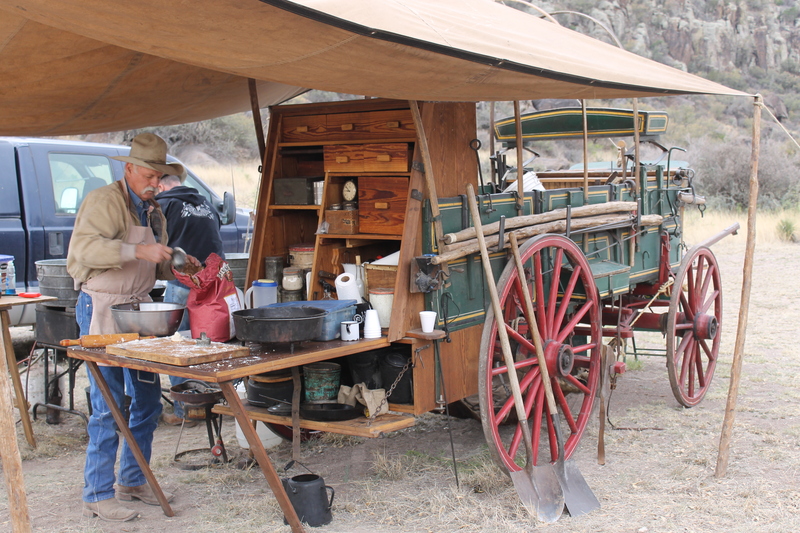 It was a chilly, overcast morning and perfect for a nice hearty chuck wagon breakfast. 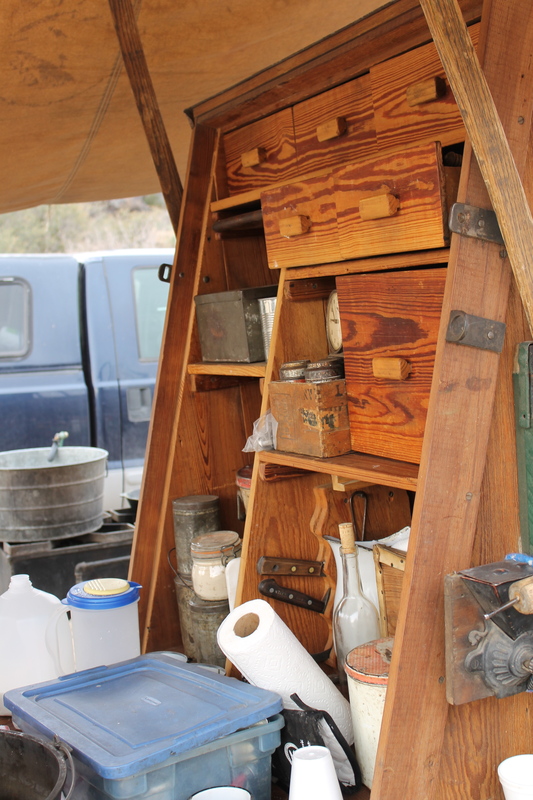 The chef that morning was Glenn Moreland, a champion amongst chuck wagon cooks. And, after eating his food, I can see why. 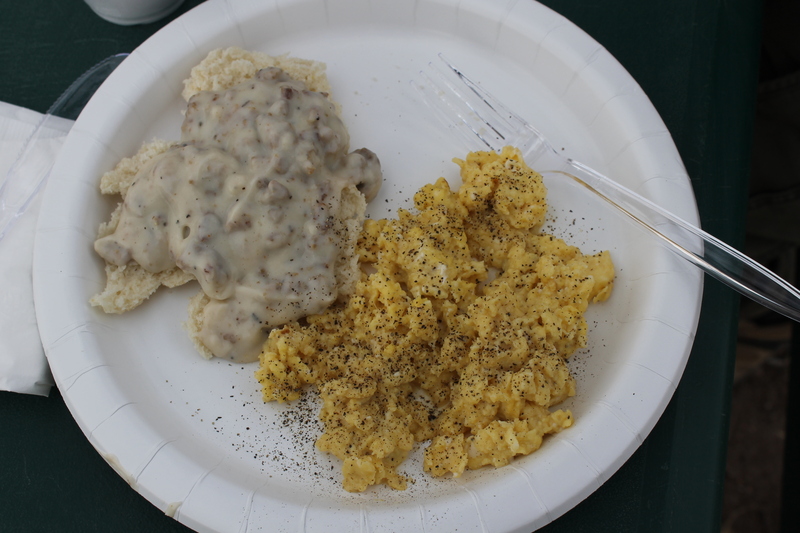 Breakfast was scrambled eggs, Dutch-oven Biscuits, and cream gravy with sausage. Let’s not forget the Cowboy Coffee. While we all agreed that while the eggs were very good, but nothing special, the biscuits and cream gravy were the best we’ve ever had. And, after living in Texas for as long as Mom, Dad, Steve & I have, that’s saying something. 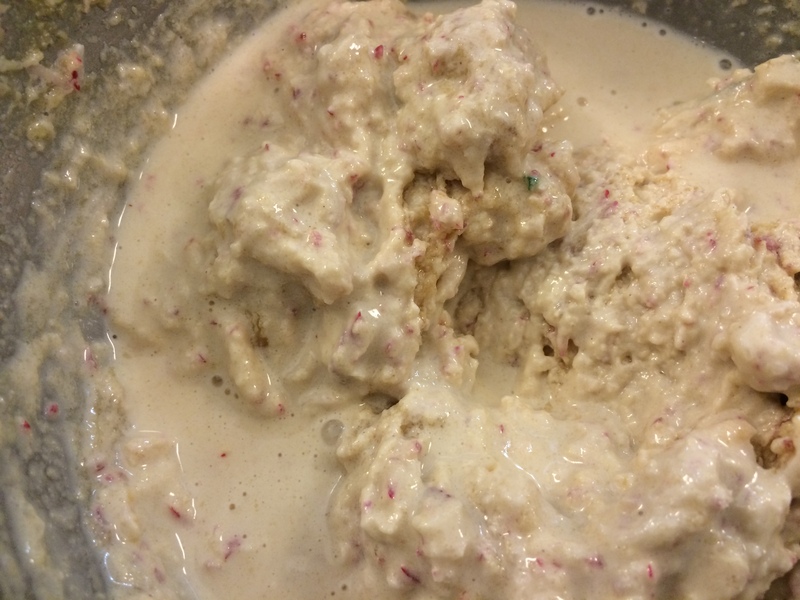 It wasn’t greasy, flour-flavored wallpaper paste; it was a lovely, not-too-thick, flavor balanced amalgamation of sausage, flour, and milk. 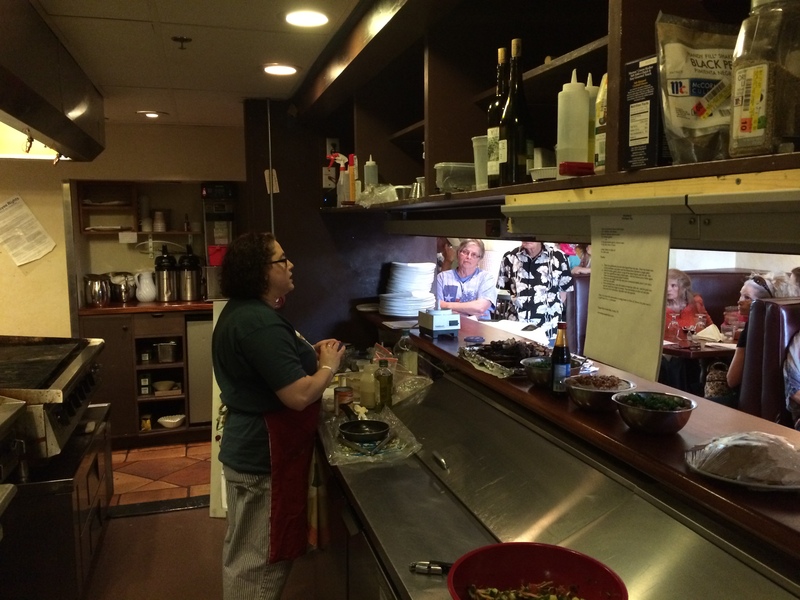 There are many restauranteurs who should take cream gravy-making lessons from Mr. Moreland. Then, there were the biscuits. Fluffy as a new pillow. Biscuits ready for the campfire. And, of course, our scenery made everything go down easy. 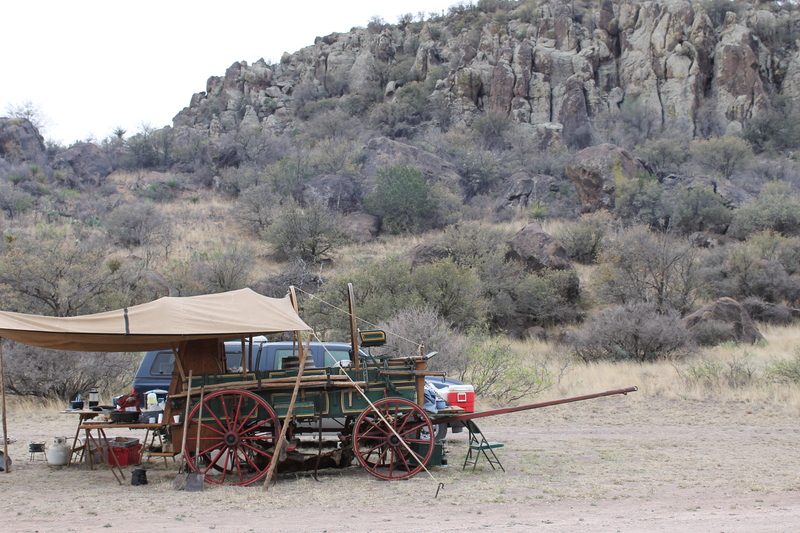 The view from the chuck wagon. 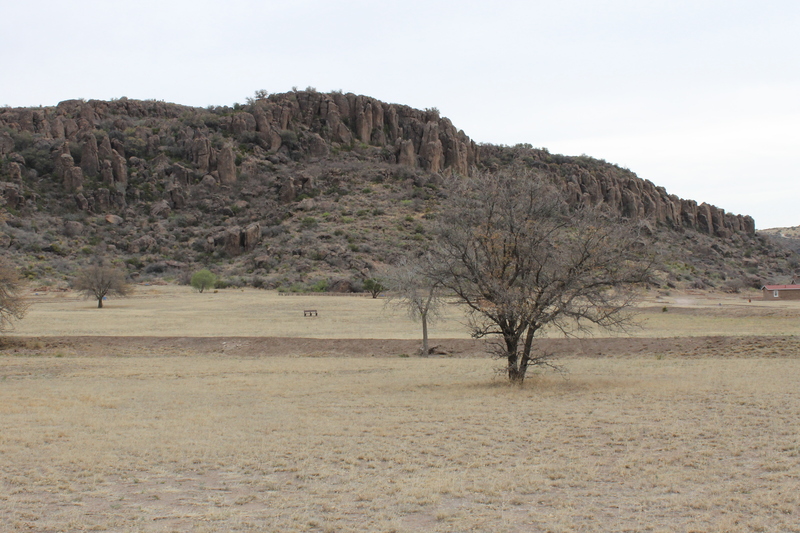 After breakfast, Steve & I drove back to Alpine while my parents went with Mom’s friend Betty (we happened to run into at the breakfast) to her home and then took a trip into Marfa for lunch. I had to get back to the hotel to prep for my class. I taught a very similar menu last year that proved popular, so Stewart & I decided that it would work again. And, while the prep was easy (especially since I’ve done all these recipes dozens of times), it took me about 4 hours to get everything ready to take to the hotel. So, yeah. I was just a little stressed. Because I didn’t have any hard-and-fast numbers, I had no idea how much food to make. So, I went with a triple batch of each recipe. I figured, if nothing else, I could leave the extra food for the kitchen staff at the hotel. Actually, my biggest fear was no one except Steve and my parents showing up. Well, my fears were unfounded. More than 3 people showed. By Steve’s estimation, I had 25 – 30 for my class. And, I made just enough food. A few members of the class. A few more students watching me behind the counter. I can’t remember what I was making at this point. Either hummous or baba ghannouj. From my vantage point. And my mess. Looking at al the food that was already on the counter, I must have been talking about the kebabs. Stewart joining me at the end. It was a good group. 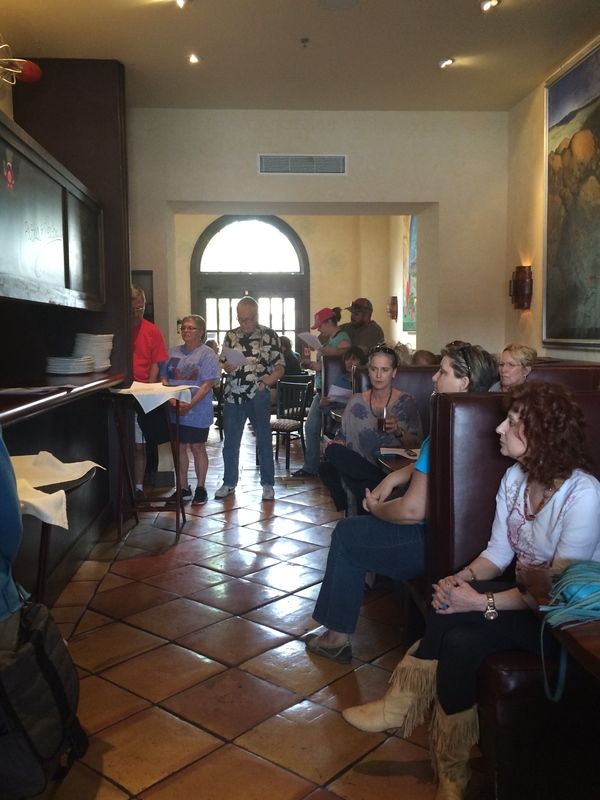 They listened, took recipes, asked thoughtful questions, and seemed to enjoy the food. I admit I felt a strong sense of relief. Overall, I think the class went well. There was just enough food for the class with a little left over for the kitchen staff. Except for the kebabs. Those were gone. 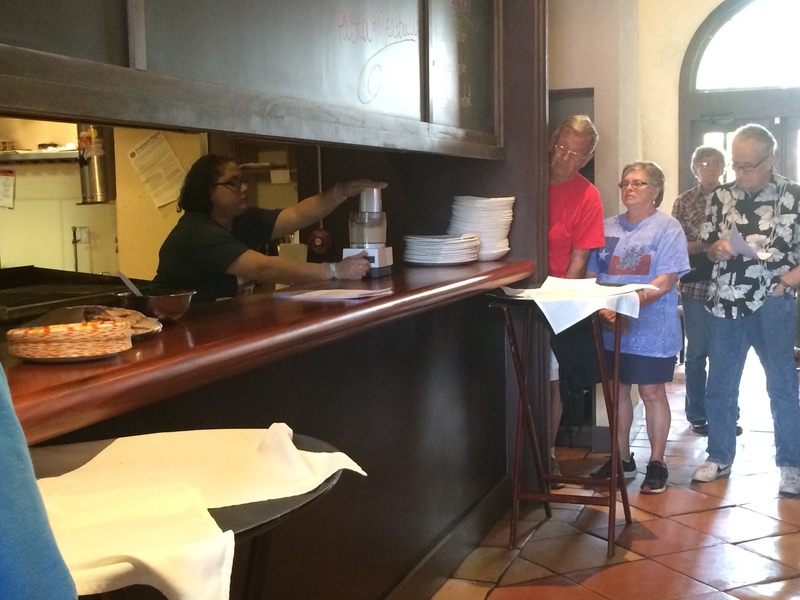 I must give credit to William Paynter, the Century Grill General Manager, who was a great help. I couldn’t be more grateful to him and his staff. 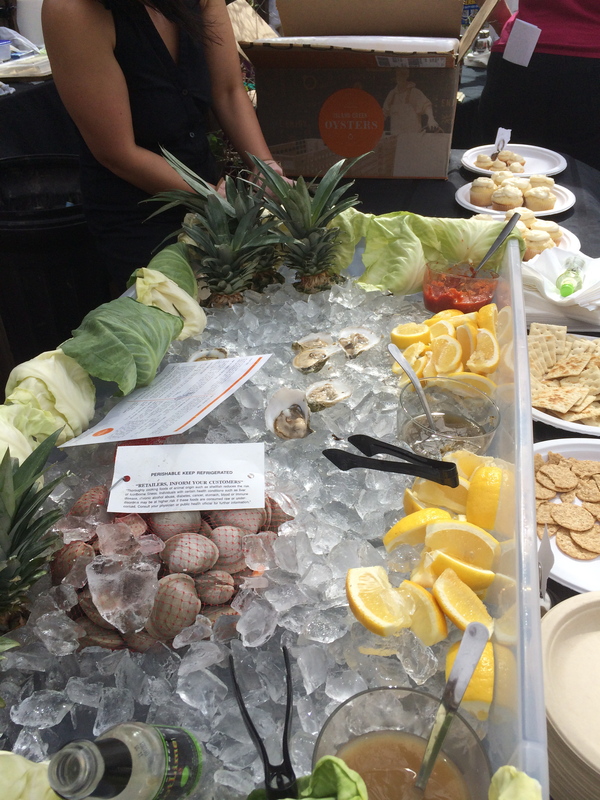 At the end of class, after Stewart & I announced the gin-and-oyster party in the Holland Loft Courtyard, I cleaned up and cleared out as quickly as possible so I could get some oysters and put my feet up for a while. I didn’t really care about the gin drinks. 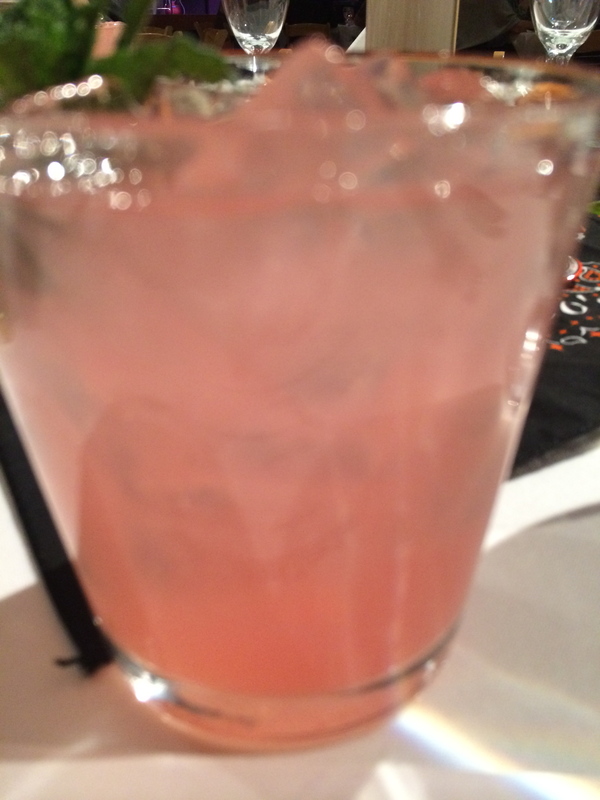 Although I did have a few sips of Mom’s and Steve’s drinks. Lots of gin and mixers. Oysters. Lots of oysters. I think I had 10. I didn’t want to seem too greedy. The party was actually just outside Steve’s & my room, so we and my parents were able to get our food and drinks and hide out inside. If we wanted more, we could just walk two steps out the door and partake. Since I hadn’t eaten since the breakfast, I was grateful for the snack. We chatted for a while, I got cleaned up, and then we headed to our next event: The Tito’s Vodka Cocktail Dinner at the Granada Theater. The whole event was, in a word, incredible. 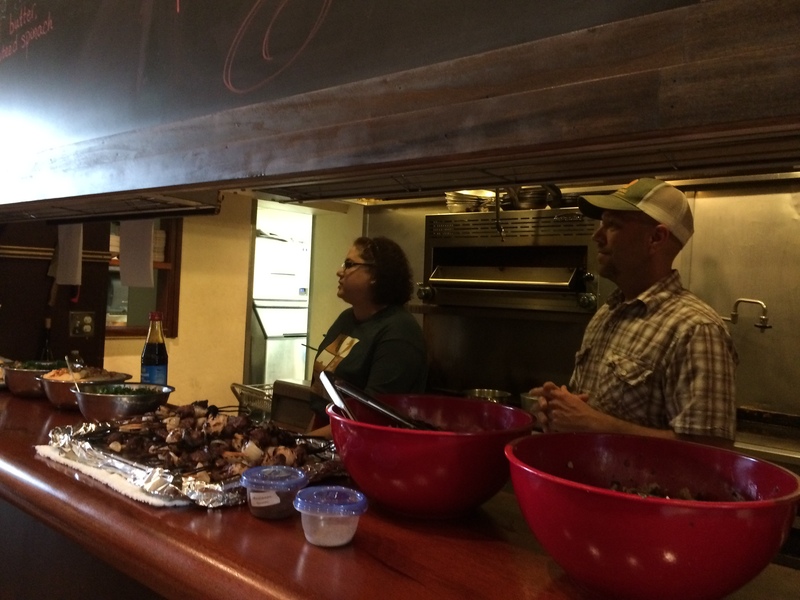 The food was catered by the Saddle Club by Chefs Stephen and Jonathan Wood. 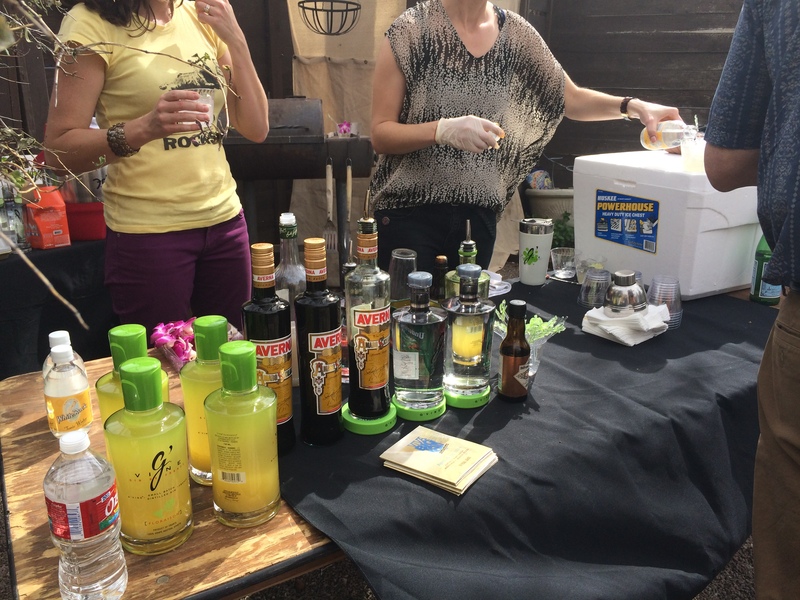 The cocktails were mixed by David Allen, whose book “The Tipsy Texan” was an event at the festival in itself. 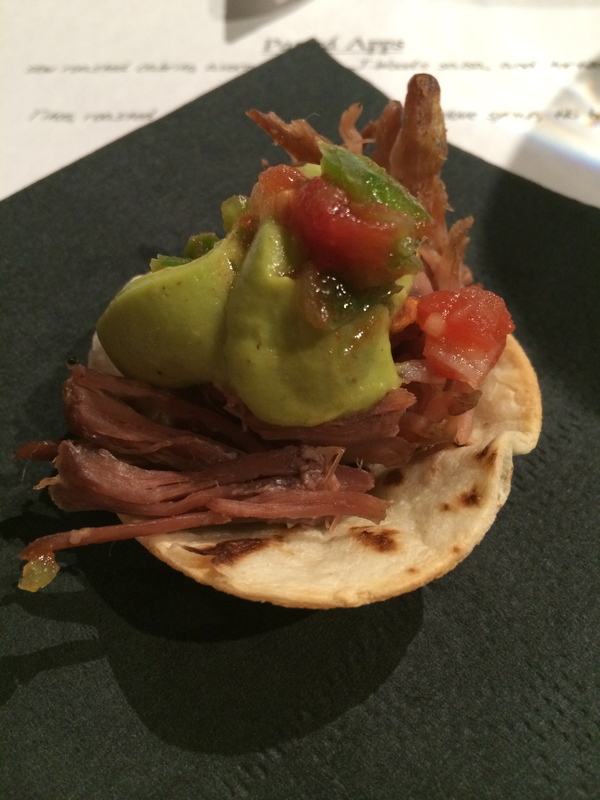 The dinner started out with a “passed app” of Slow Roasted Cabrito with Avocado Mousse, and salsa on flour tortilla cups. 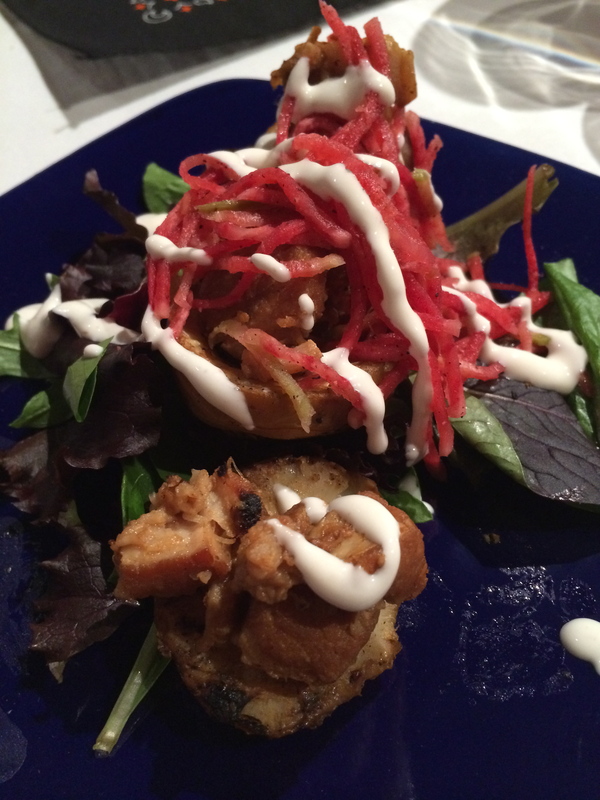 The cabrito was perfectly cooked – a lovely shredded melt-in-your-mouth treat. The mousse was simple and the salsa added just the right amount of heat. The cocktail was a mason jar full of the “Little Miss” made with Tito’s (as all the cocktails were), roasted pineapple juice, lime, cinnamon/clove syrup, and bitters. I only had a small taste of the Little Miss. Wow. If you weren’t careful, these could be dangerous. They tasted almost like a spicy lemonade. (Full disclosure: I’m allergic to cinnamon. 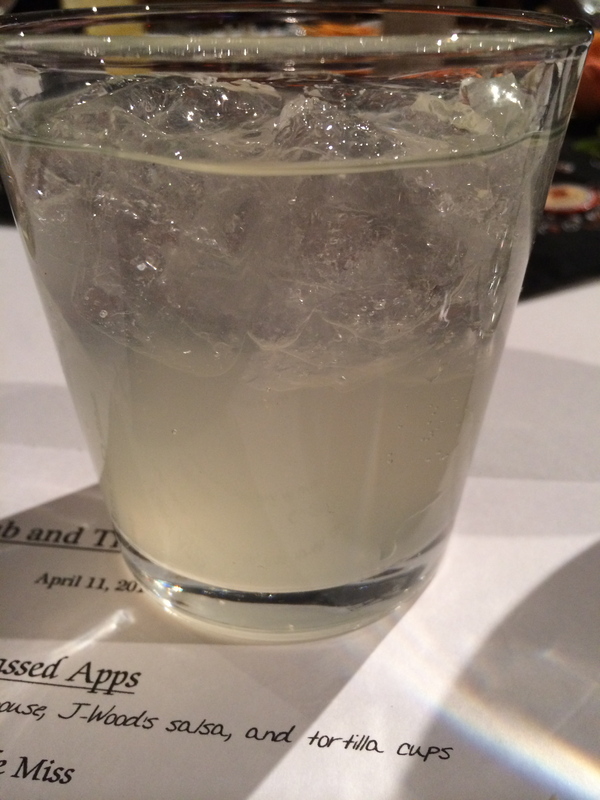 So, I only had a small taste of this cocktail and the dessert.) Mom and Steve enjoyed it. Dad sipped. This tasted like a slightly spicy hard lemonade. My alternate cocktail. Basically vodka and ginger beer. Wow. All I can say is wow. 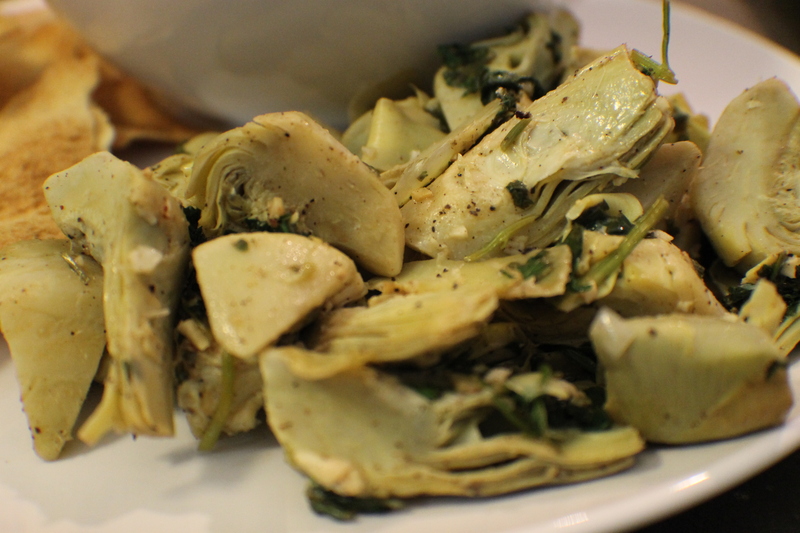 Artichokes aren’t my favorite vegetables, but I’d eat them every day if they could taste like this. The carnitas had just the right amount of flavor, richness, and textures. And the creme; well, everything’s better with bacon. 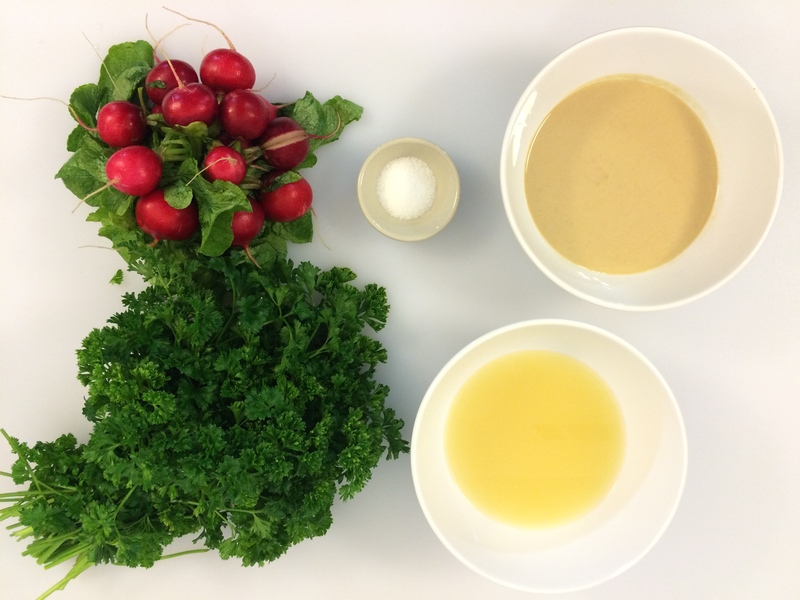 The pickled radishes added just the right amount of contrast to the rest of the dish and cut right through the richness. The paired cocktail was “Southern Days”. It was made with vodka, watermelon, mint, and sugar. A very refreshing summer-sipping-on-the-porch cocktail. 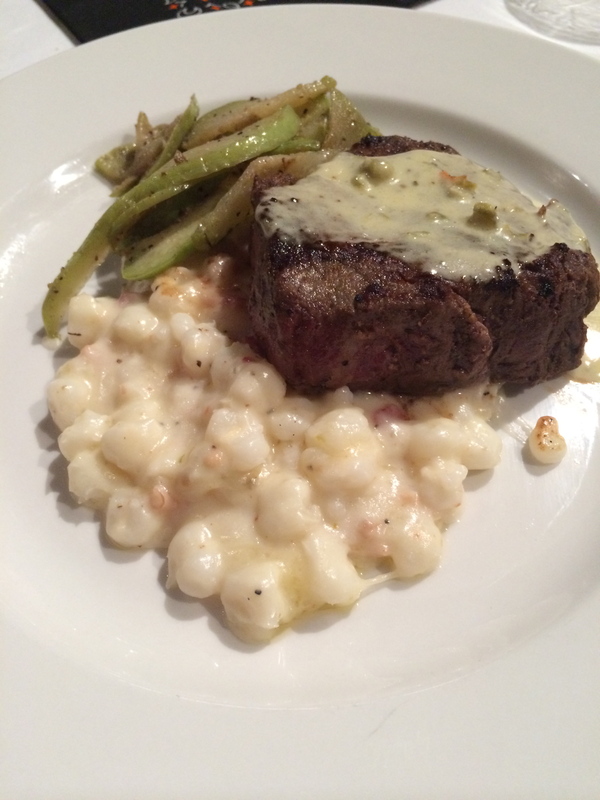 The main course was Jalapeno Rubbed Beef Tenderloin, Bacon & Pepper Jack Hominy Cassoulet, Chayote Squash, and Fire-Roasted Jalapeno Cream. This was my favorite course, hands down. The tenderloin was at least 4-5 ounces of Chateaubriand cut cooked to a well-rested medium rare. While I don’t believe the tenderloin is the most flavorful cut of beef (or any animal for that matter), Chef Stephen found a way to make its grass-fed goodness shine. 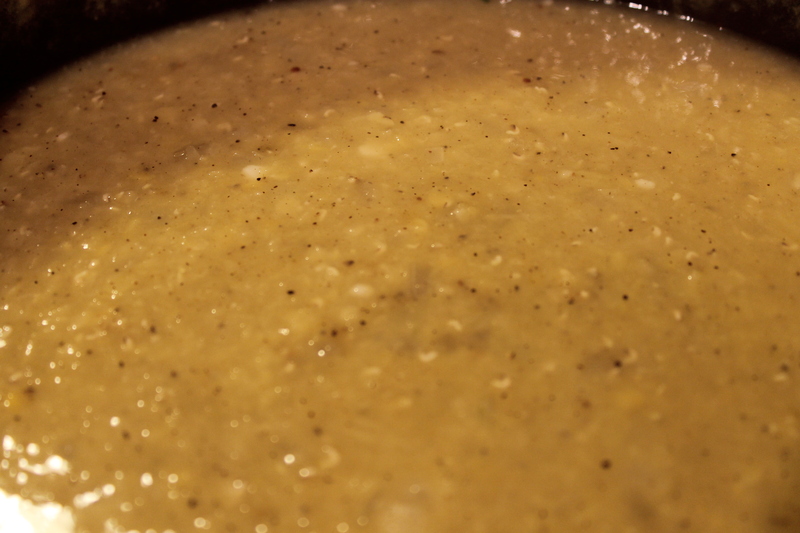 I think I found a new way to make chayote squash – a vegetable I rarely use. I should’ve asked him how he made it, but it seemed to me to be very simply pan seared. It still had some crunch to it. One of my favorite foods is hominy. And by pairing it with bacon and cheese, it was moved to new hights of possibilities. And the Bacon Creme? What do you think? 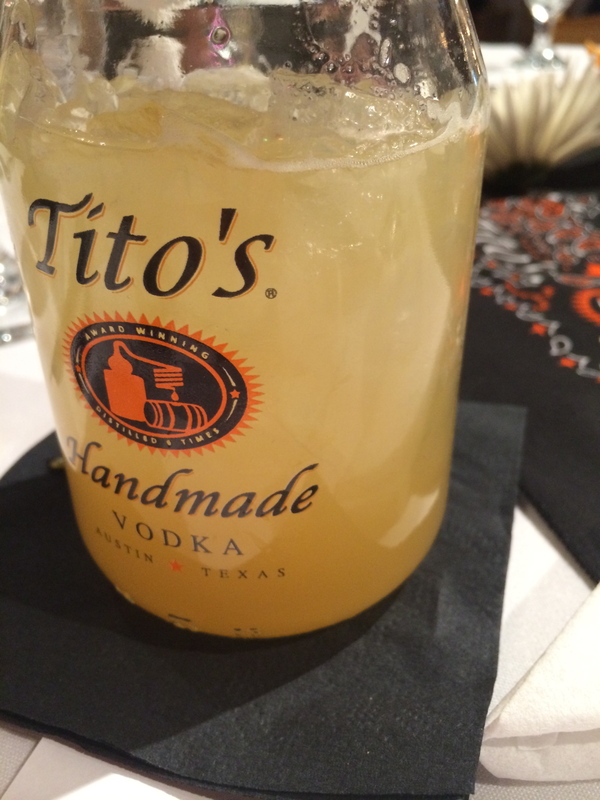 The paired cocktail was “Tito’s Martinez”. 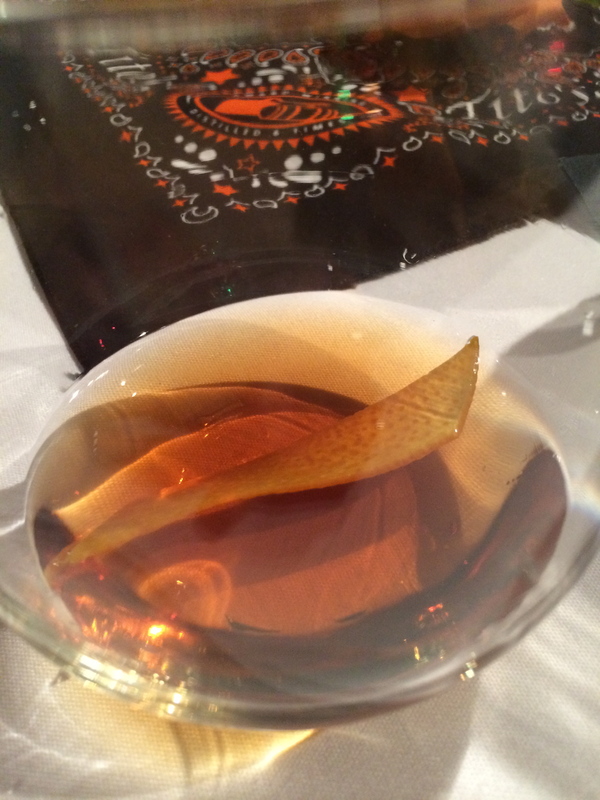 Made with vodka, Carpano Antica (a sweet vermouth), Luxardo Maraschino (a cherry liqueur), and bitters, it acted as a digestif to help counteract the richness of the course. Dad didn’t like it. Mom & I split it. 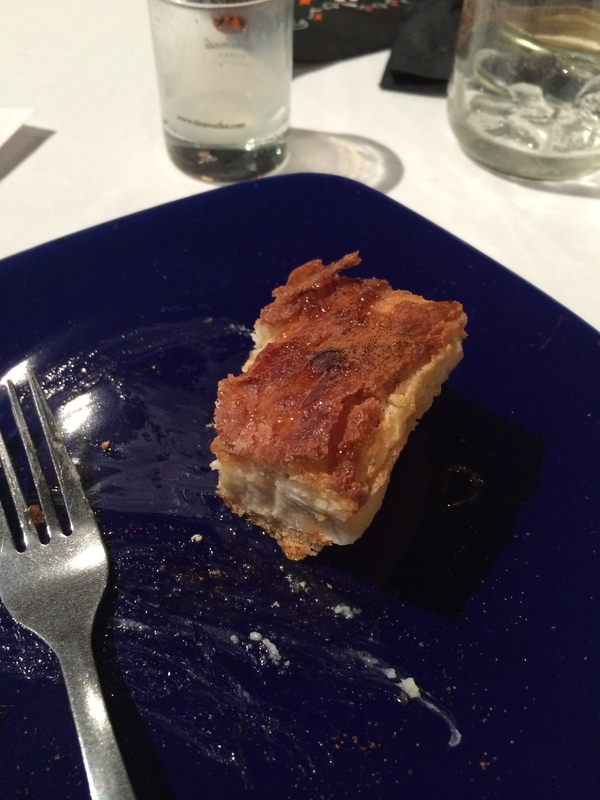 Sadly, I didn’t get to try to much of dessert: Sopapilla Cheesecake. It looked like a wonderful amalgamation of creaminess with a cinnamon brulee crust. I did try a couple of bites of Dad’s portion and detected coconut as well. However, no one else could confirm this. Steve’s dessert. I just managed to get a photo before he finished. The final cocktail more than made up for my lack of dessert experience: the “Iceberg”. 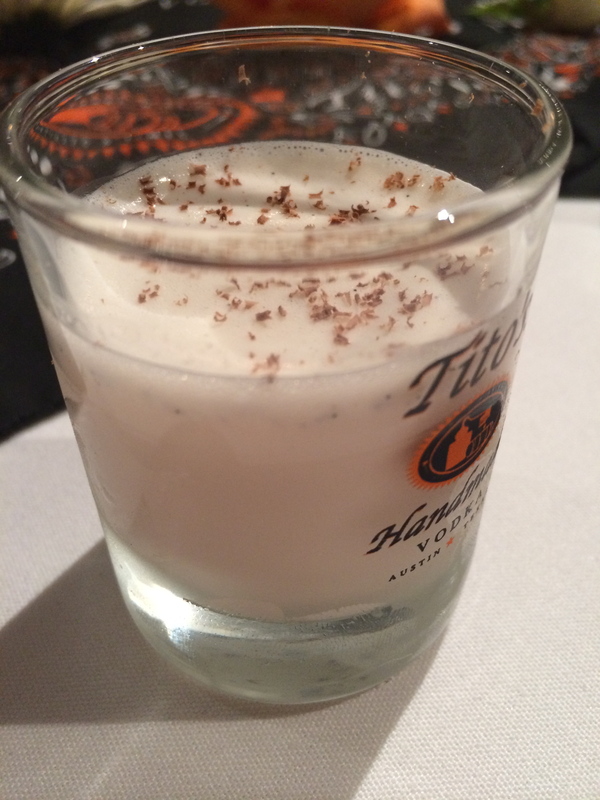 Made with vodka and frozen Cremes de Menthe and Cacao it tasted like melted chocolate chip mint ice cream. I was only sorry they served it to us in shot glasses. After the meal and some well-deserved applause for Chef Stephen and his crew, we made it back to our room in a relatively straight line. After discussing meeting up at the Farmers Market the next morning and relaxing a bit, Mom & Dad went back to their hotel. Steve & I were in bed by 10. We’re old.